So, the structures are done. It has been an involved process, for sure, and at times physically exhausting. 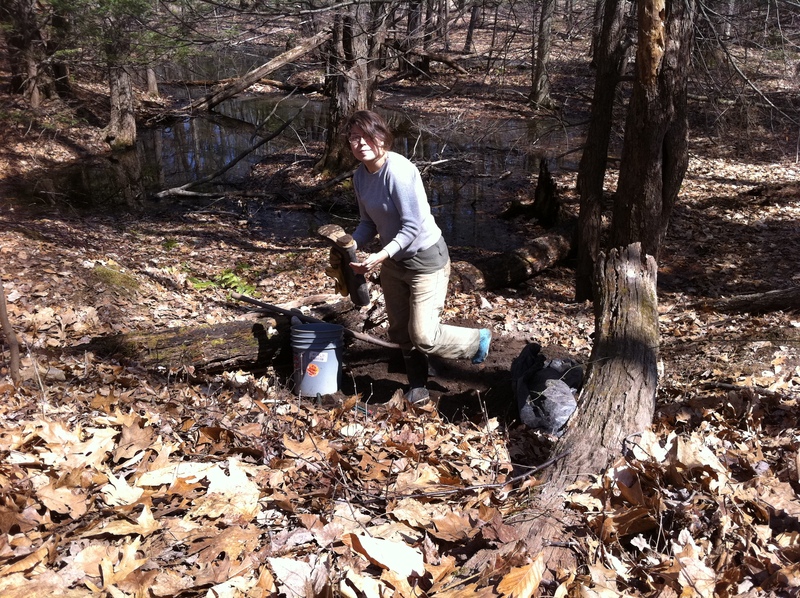 Before I could begin work there was research, preparation, site selection, and the gathering of materials. Actual construction was interwoven with documentation, as I took pictures at all stages of the process. 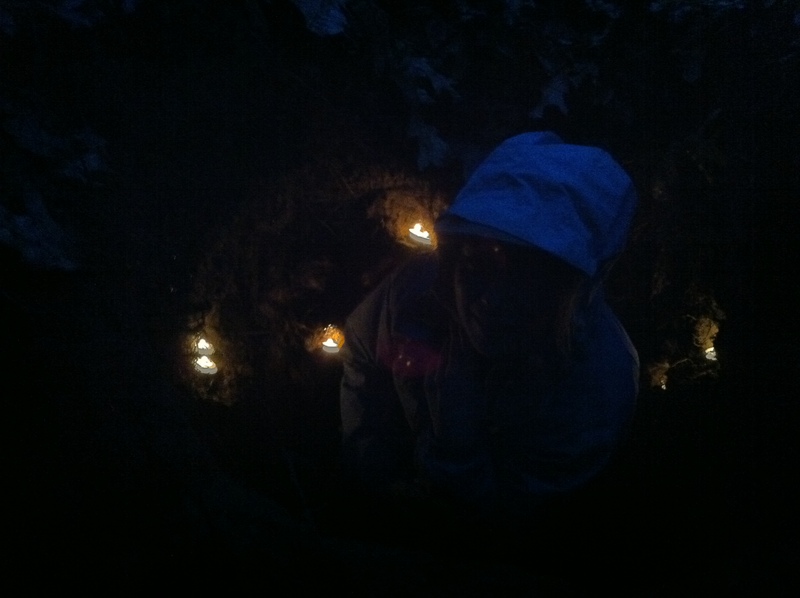 Afterward there was further documentation, including experiencing the structures in the dark. 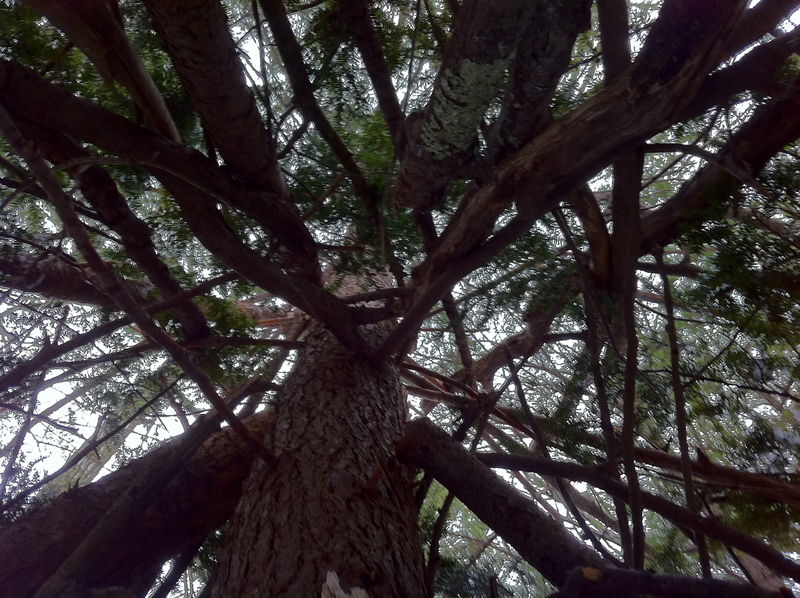 Some of them required maintenance after the fact; just yesterday I went back to the earth shelter and filled it with supple pine branches, bent to create pressure on the ceiling and hopefully hold it up in the rains. 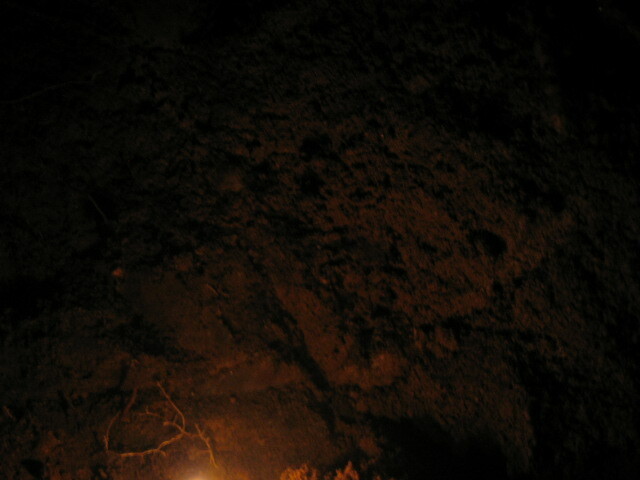 Some materials, like snow and earth, were ready and waiting for me. 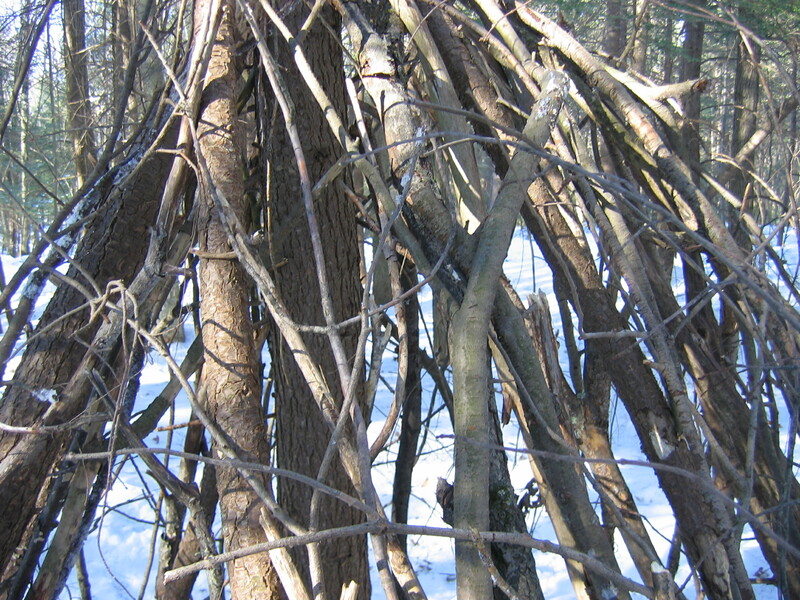 Those structures were created through subtraction of materials, rather than addition. 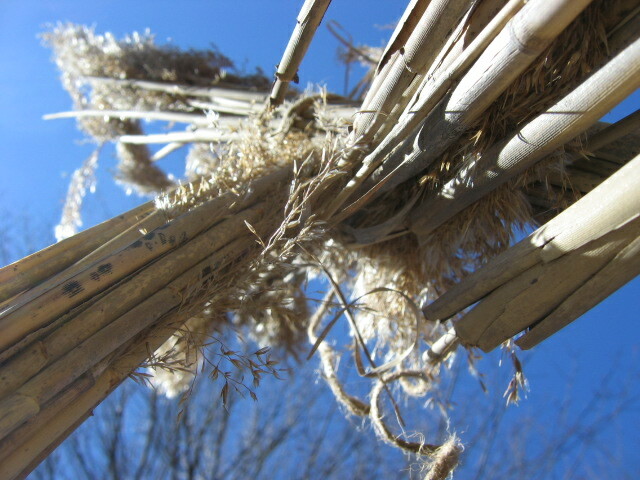 Wood and thatch both needed to be gathered and woven together. 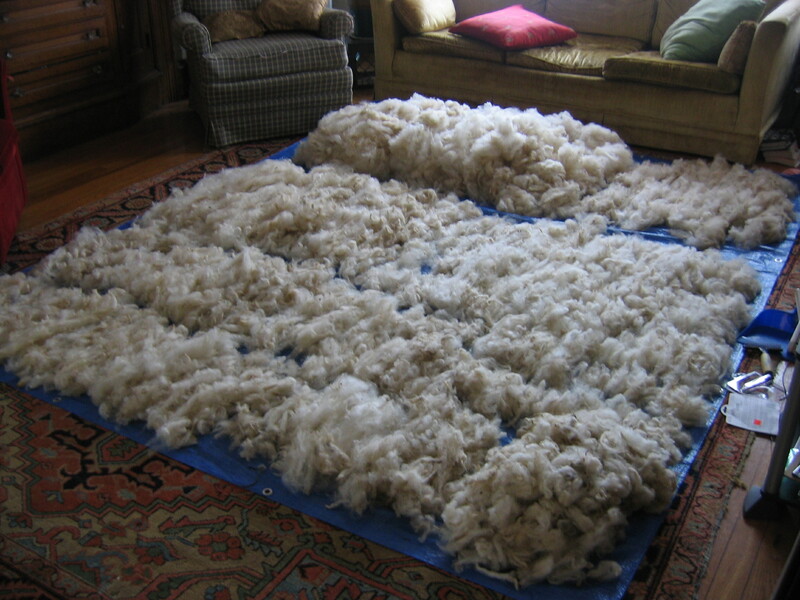 The felt structure was unique: making the felt required many more steps- getting the wool, washing it, drying it, stretching it, and working for hours to felt it. 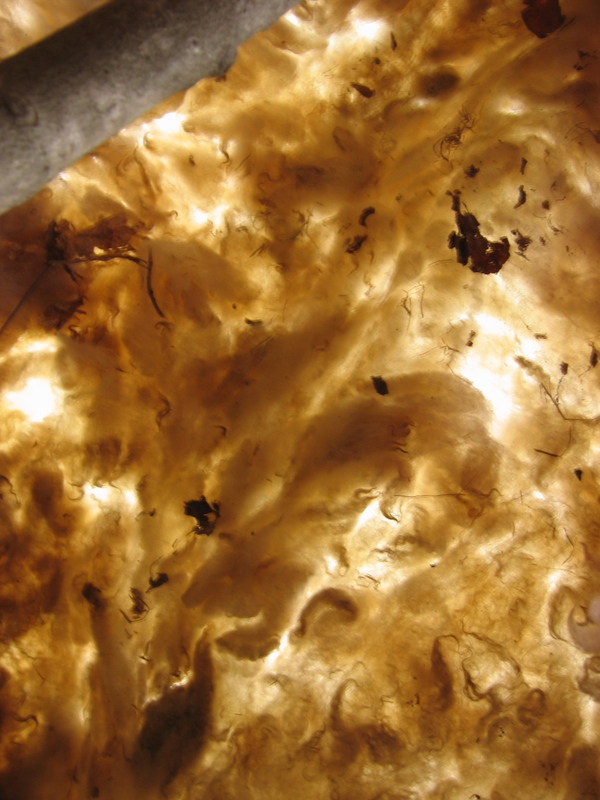 Despite the differences in working with these materials, I found they had a similar, almost hypnotic quality to them. The repetitive work of digging, gathering, combing, washing, carrying, agitating, left me with a kind of blankness in my mind. 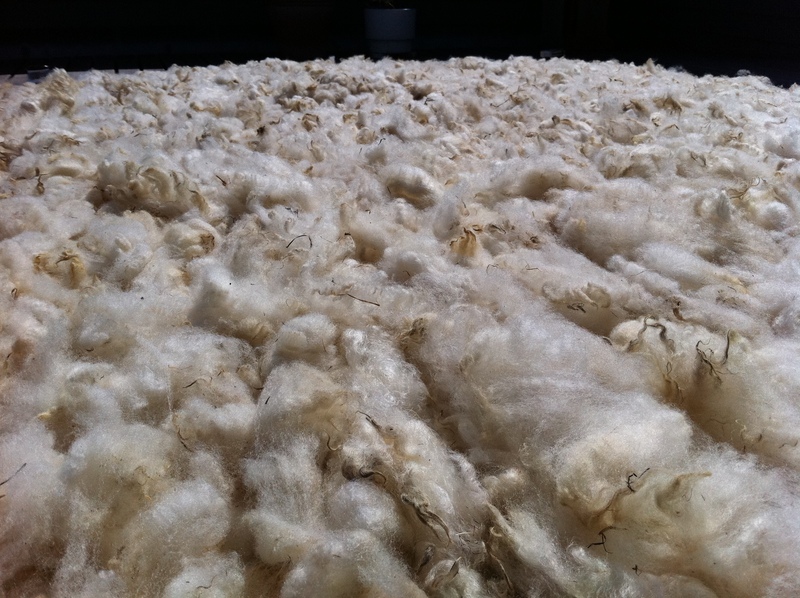 This was especially true during the wool preparation; I would go the same motions until I was completely glazed over. For all of the structures I had this idea in my head that I could work 8 hour days on them. This wasn’t the case. Usually after about 3 or 4 hours of work I had to stop because my body told me to quit while I was ahead. I often spent these hours in strange positions or small spaces, lifting heavy things, sometimes all three things at once. 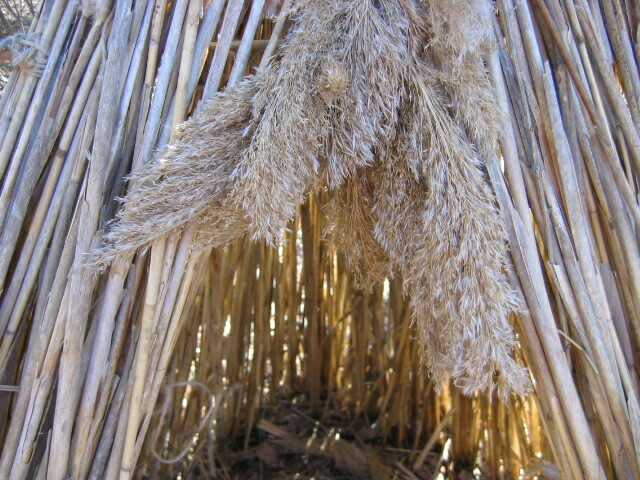 At other times, the materials need a break; thatch needed to dry, etc. The other common experience I had among all of them was that I found it really hard to leave them. I always had this urge to do a little more, carve out a little more, add a little more to the outside. I always had to tear myself way, never feeling quite done. Earthen buildings are among the most interesting to me. There is a long history of earth being used to build, from sod huts in Europe to dwellings hollowed out of the ground, sometimes several stories deep, in China and the Middle East. 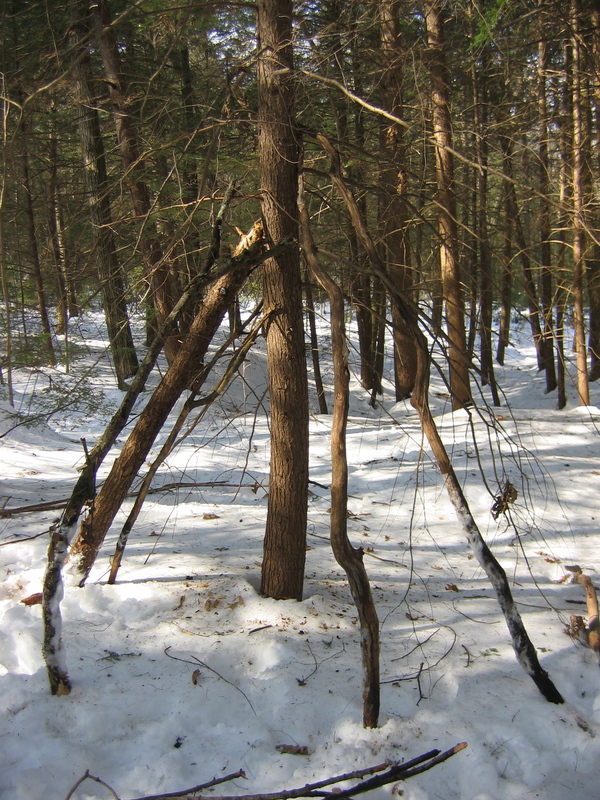 I initially planned to make a cob structure, but since one of my goals has been to refine these shelters down to their simplest form, I decided instead to go with a more basic design: hollowing a shelter out of a hill. 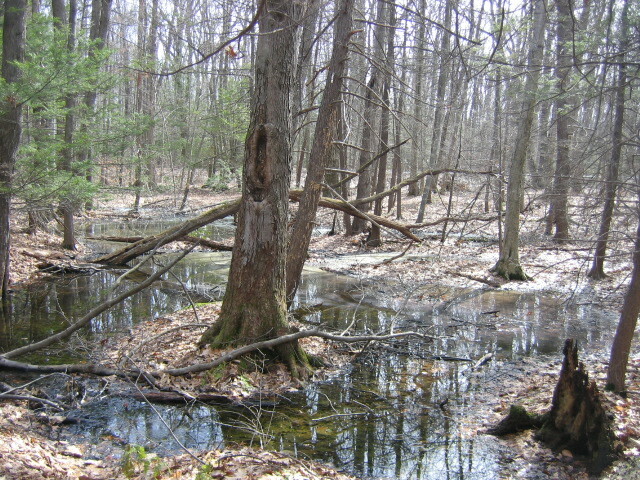 I chose a small hill in the woods that had a nice view over a vernal pool. 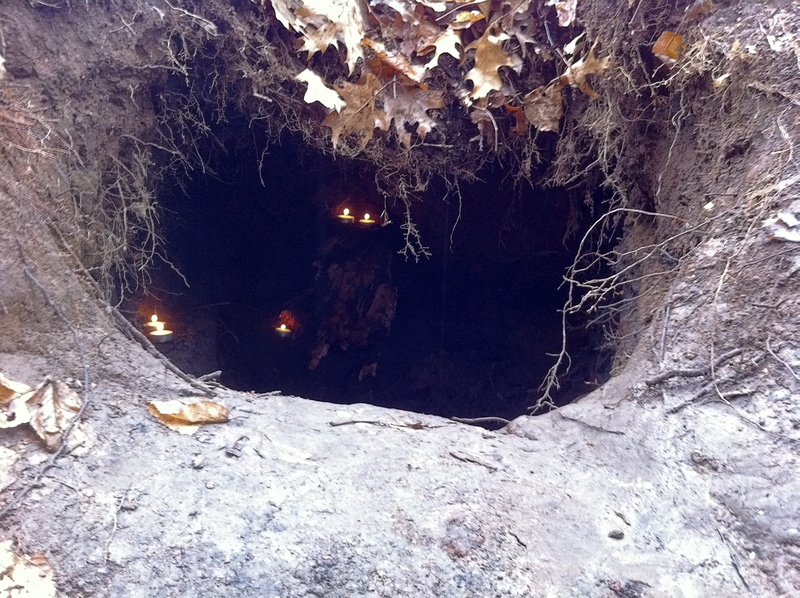 I began by removing leaf litter and then started carving out a door. 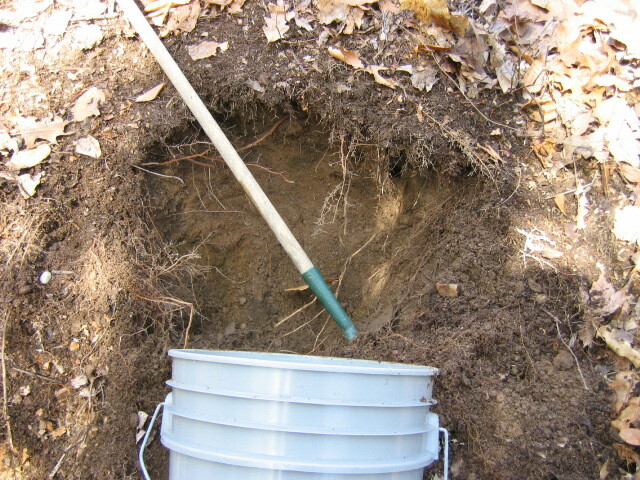 The first day I neglected to bring a shovel, so I was digging using a hoe and a trowel. 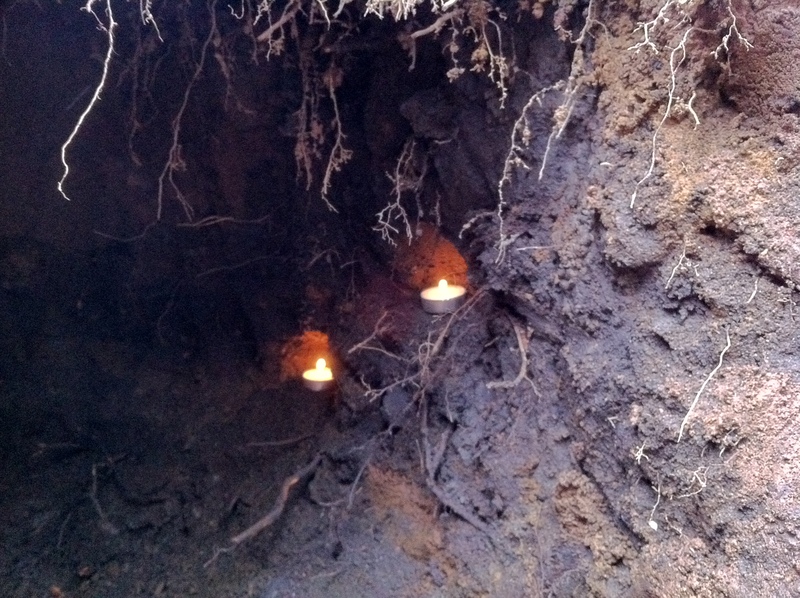 Despite knowing that the stabilizing role of roots in the ground is what enabled the hollowing to work, I hadn’t thought of what to do with roots that were in the spot I was digging out. I resolved that the next time out I would bring a shovel and clippers. 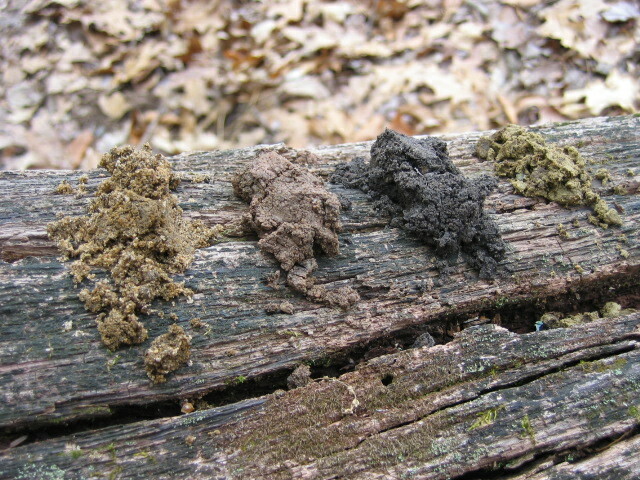 I was amazed by the variation and beauty I found in the soil I was digging. 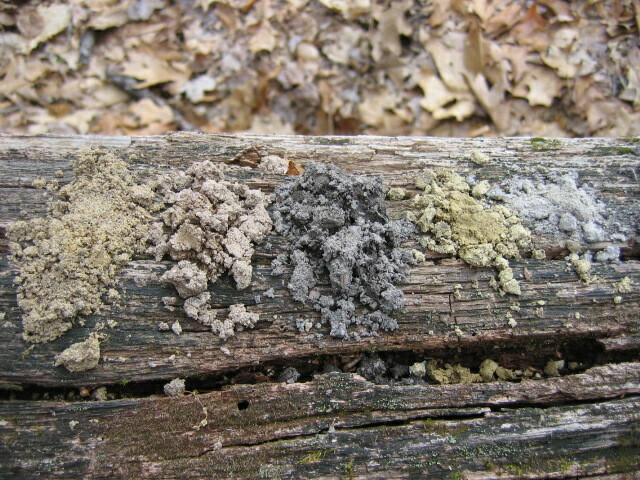 In just the one small cavity I found 5 different types of soil, each a different color. 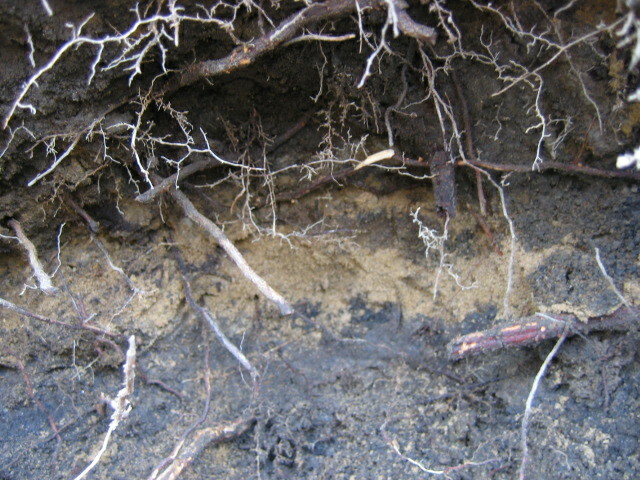 There were large veins of pure sand, a black almost ashy soil, a red clay-like soil, a greenish silty soil, and a few veins of clay, gray-blue. not so fast. five different colors! 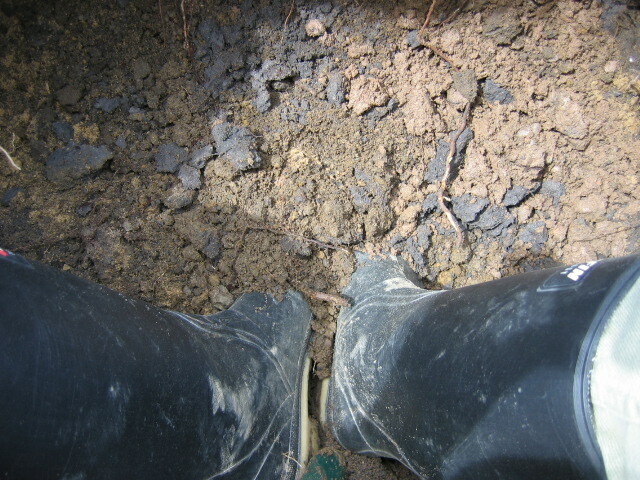 As I dug I tried to work inwards rather than downwards, where I was concerned I might hit water, or upwards, since I wanted to keep the ceiling by the entry very thick to prevent it from weakening. As I worked my way in I found a large rock, large enough that I couldn’t budge it or even tell how large it might be under the soil. 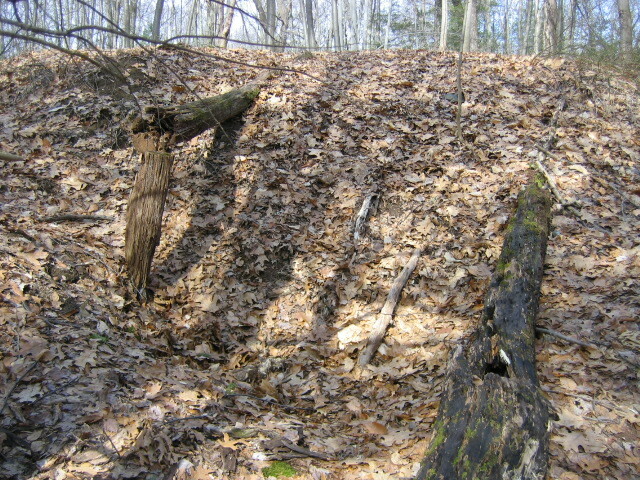 I also hit wood at the back, a very old stump perhaps, which made me wonder how this hill had formed. 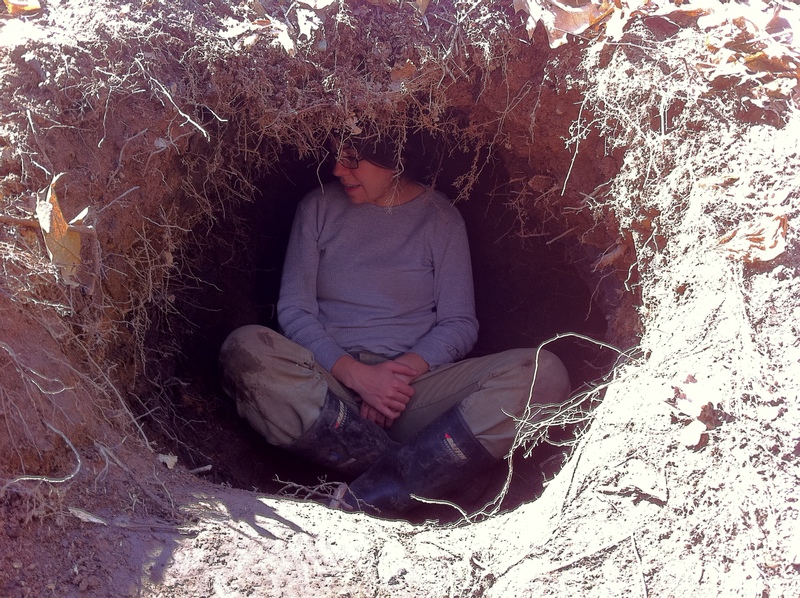 When I left the first day I had a hole that wasn’t quite large enough for me to curl up in. the giant piece of wood. The next time I brought a shovel and clippers. 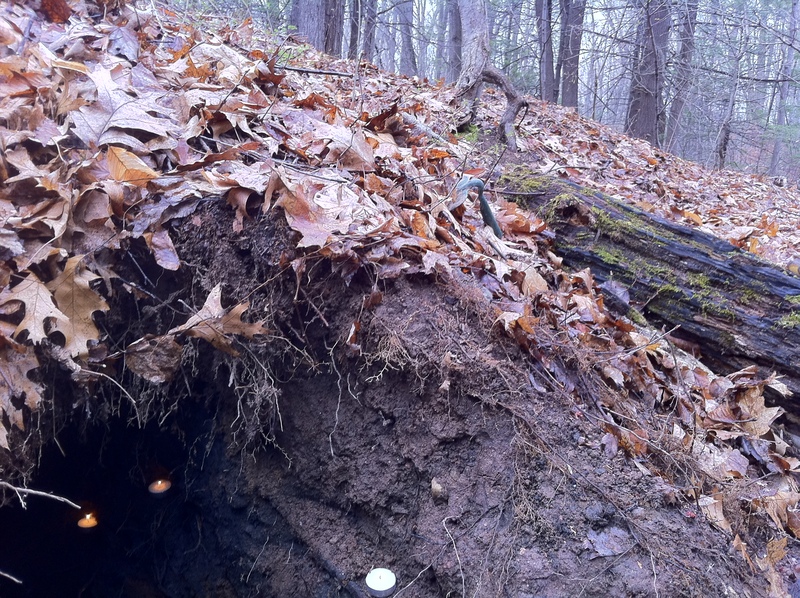 I was continually amazed by the density of the soil- it seemed like I’d taken far more soil out than could ever have been contained in such a small space. 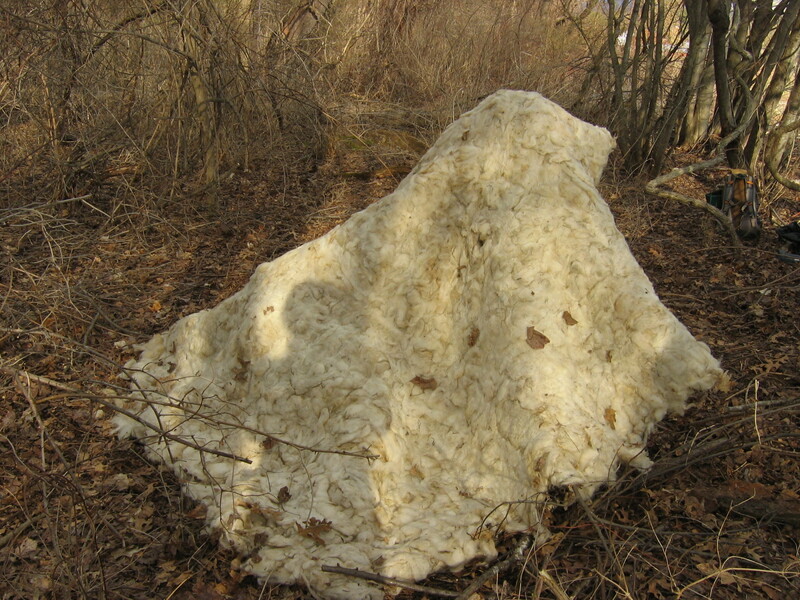 Once aerated, the piles looked huge. 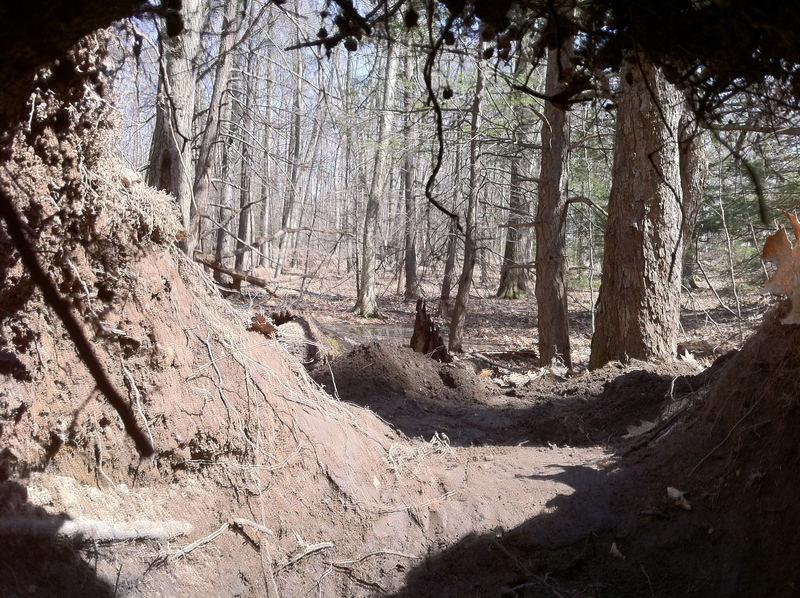 Eventually, after much digging, I could get all the way in and continue hollowing upwards into the hill and widening the chamber. the trowel is for scale. 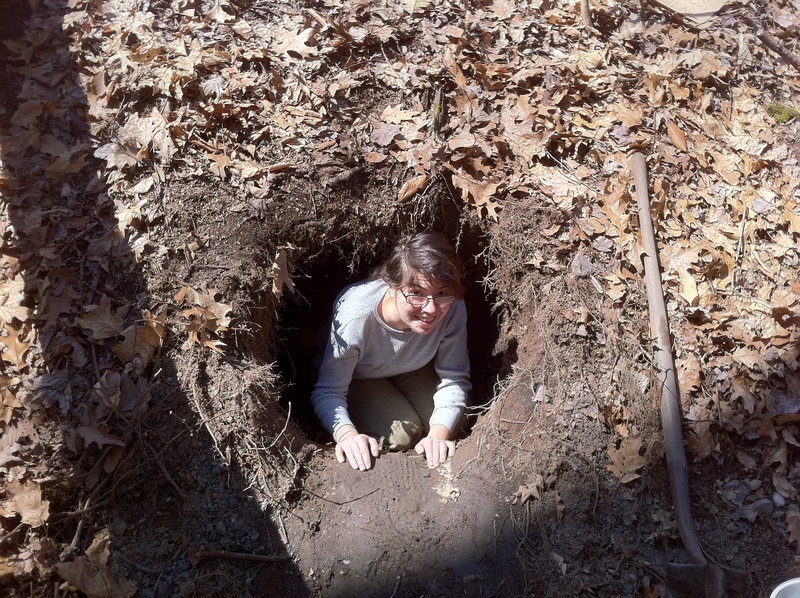 As you might imagine, digging upwards meant that I was taking a serious dirt shower. It was in my eyes and mouth, falling down the back of my shirt and down my legs into my boots. 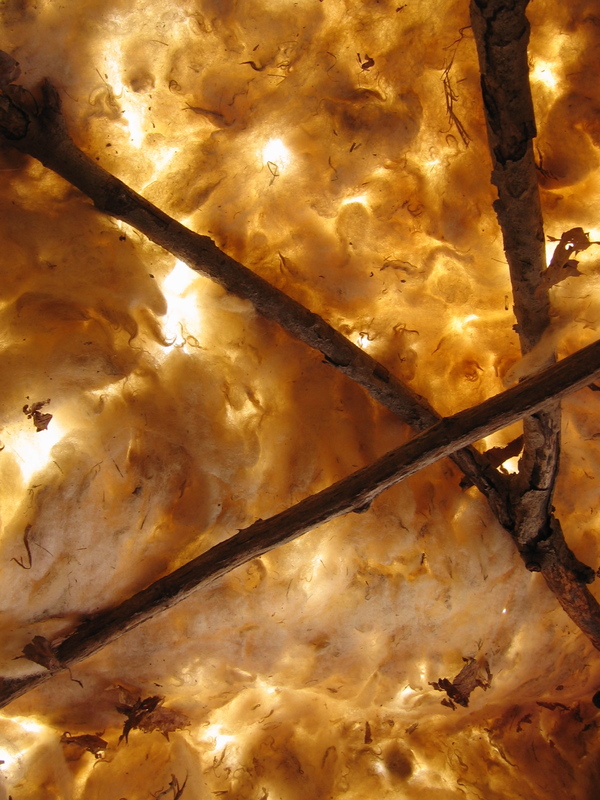 The chamber became a lot more comfortable when I carved out the ceiling enough that I could sit up straight. Luckily there was a large enough space between the giant piece of wood and the big rock that I could sit comfortably, leaning back into the curve of the wall. At the end of the second work day the chamber was almost complete, I just wanted to widen the back and bit more and create a little more head room. When I returned it was to a sickening sight– in the heavy rains of the last few days, the ceiling over the doorframe had collapsed a bit. 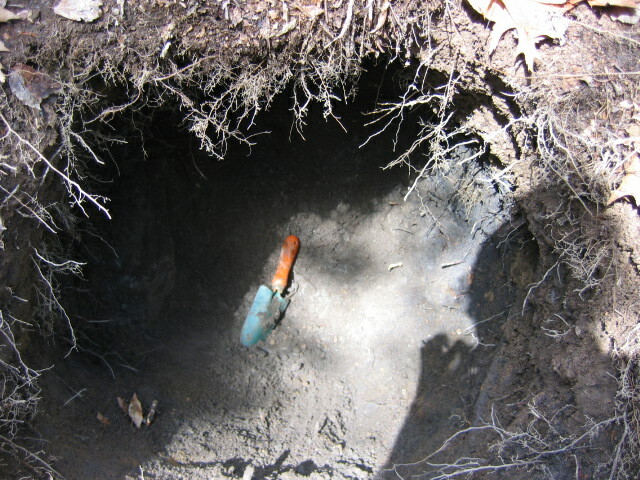 I dug the new heap of soil out of the hole and inspected the damage. I could still climb in, the entryway was lower but still passable. I could still sit up straight in the back. I did some more widening but I didn’t want to disturb the ceiling any more than I had to. There wasn’t a way to fix the ceiling, all I could do was try to prevent more damage. 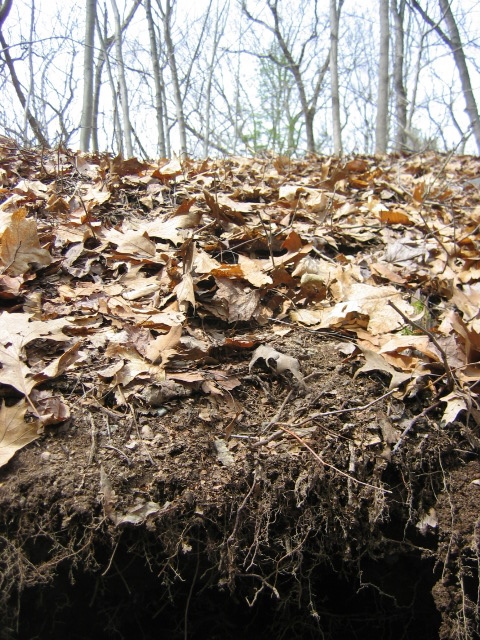 I gently squeezed the soil, trying to pack it back together, and covered the exposed soil with a layer of dead leaves in the hope that keeping the rain from falling directly onto it would keep it from becoming sodden and heavy. We’ll see if this helps. I don’t know quite what I could have done to prevent this from happening, except to leave the ceiling even thicker, or to make sure the ground is better covered. 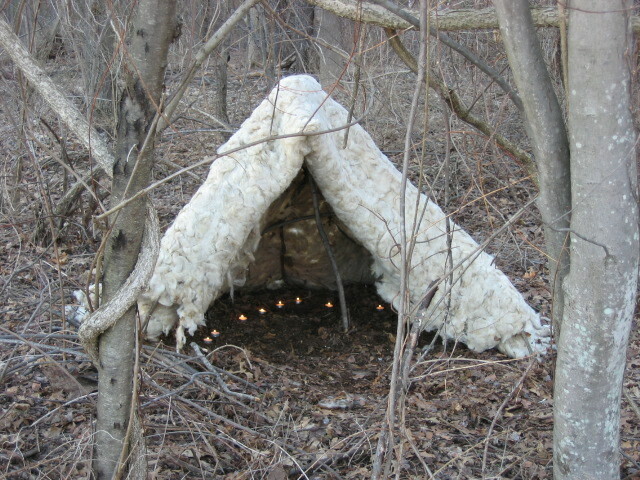 I don’t know if the shelter will survive until my show, which saddens me. 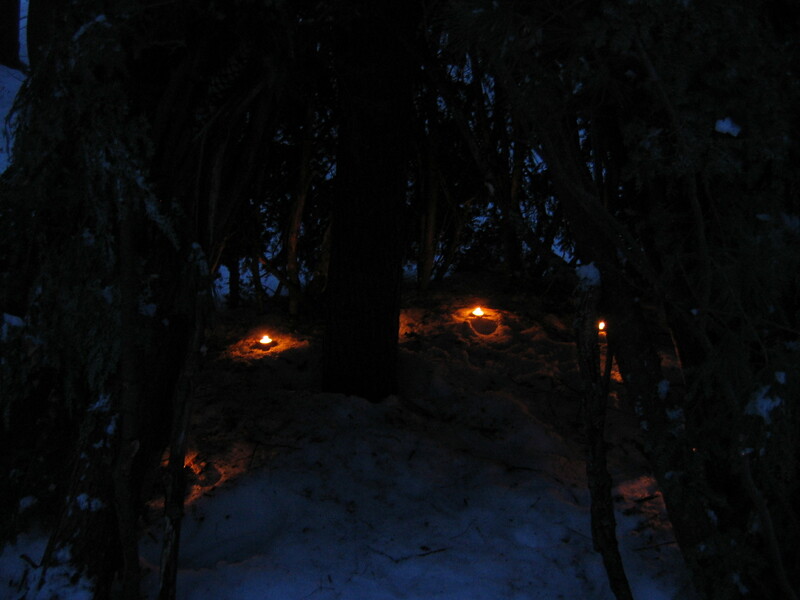 I used soil to level off the exposed rock, making it into a shelf, and carved a few cubbies into the walls similar to the ones in the snow shelter. 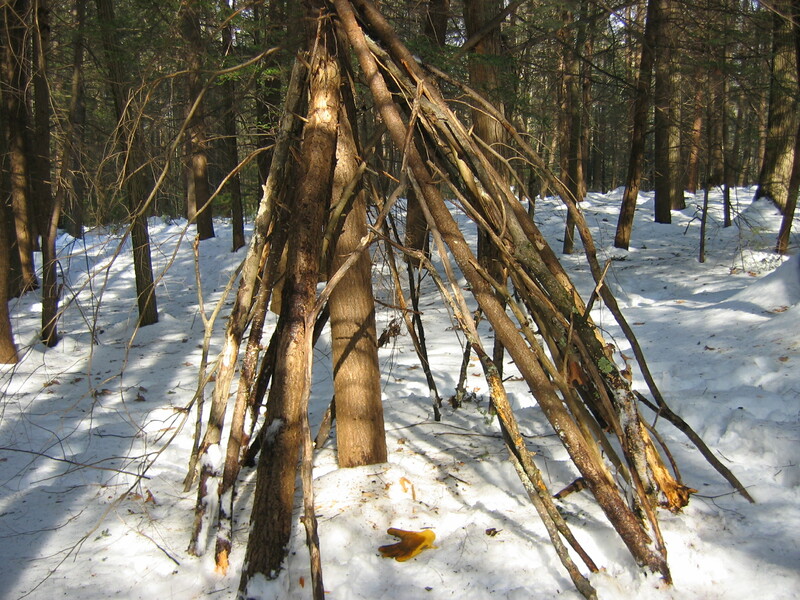 All in all, the snow shelter and the earth shelter were somewhat similar. Both involved subtraction rather than building, both involved being crammed into a small space excavating compacted powder. 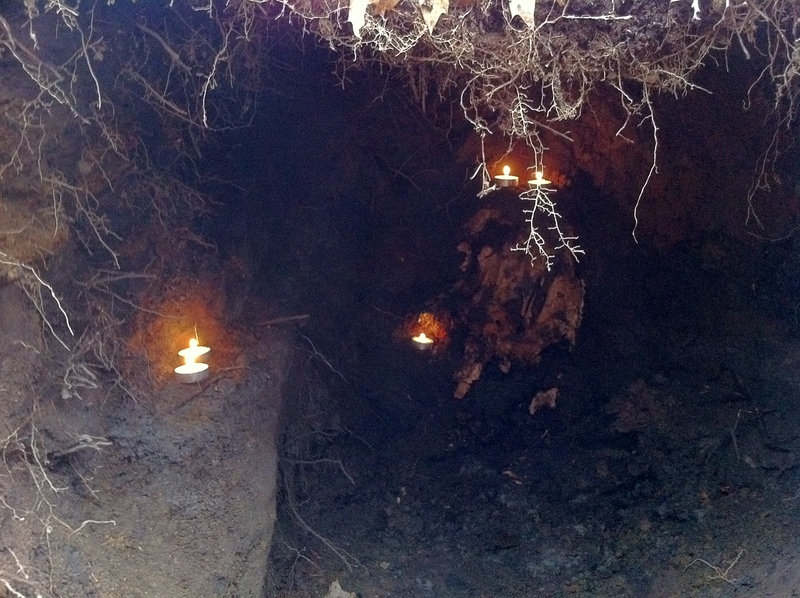 They had different challenges as well, like removing roots while preserving structural integrity. I thought that I would have claustrophobia problems with both these structures, but I actually enjoyed being in both of them. They were cozy rather than oppressive. someone small has a similar idea. 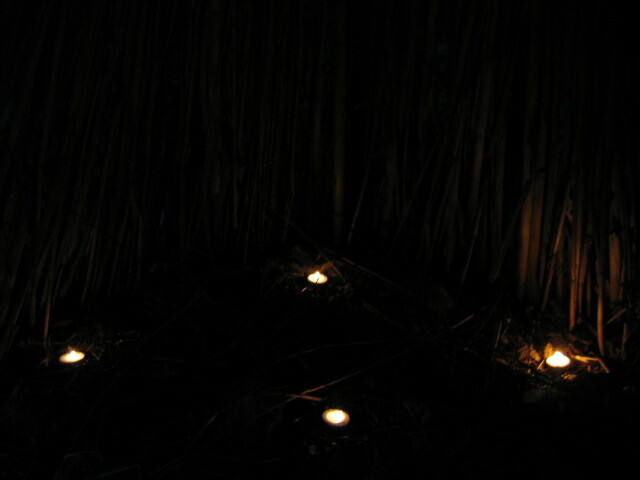 When night fell we went back out and lit the chamber with tea lights. 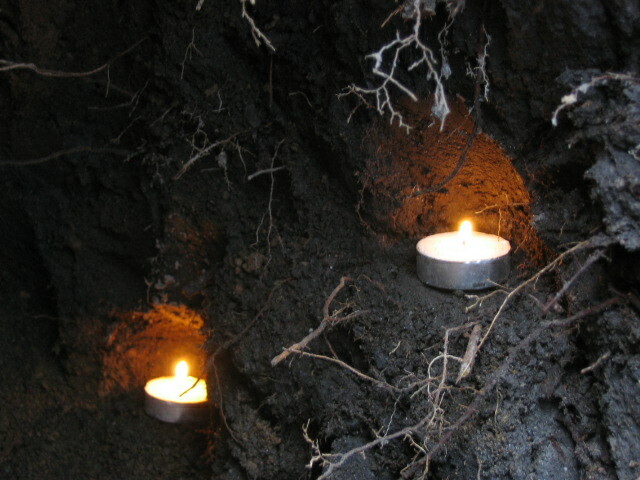 The flame light was beautiful on the rough soil walls, lighting the roots up red in the dark. I hope the pictures convey that quality of light. 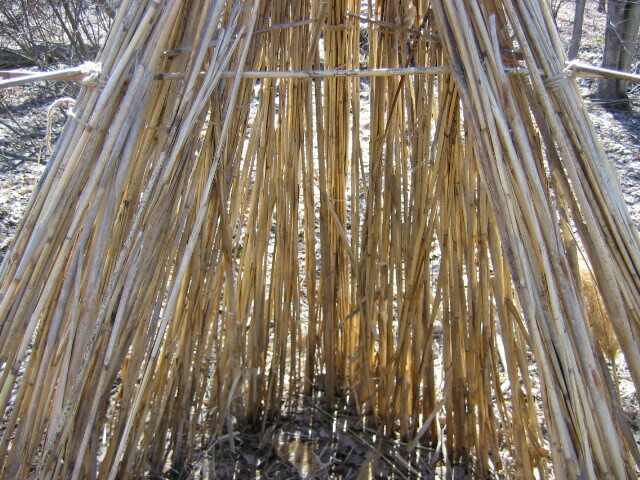 The first step for creating this structure was gathering reeds. 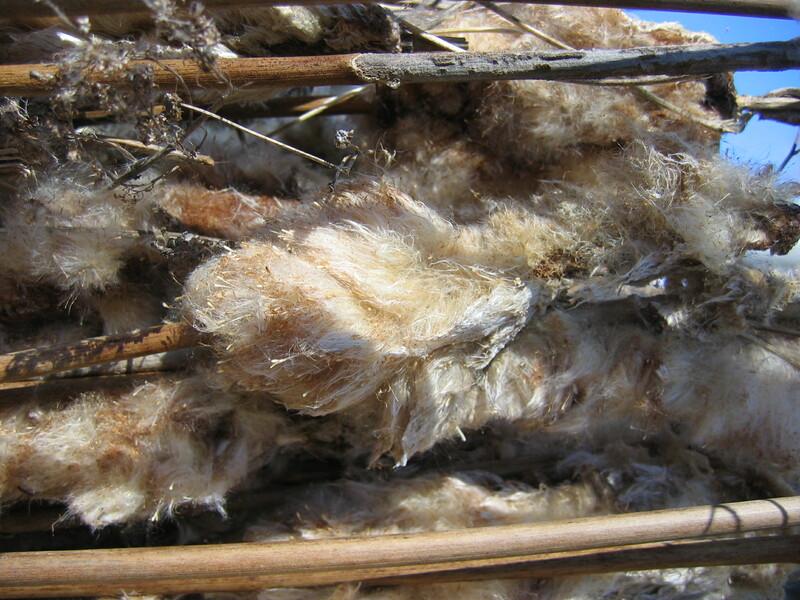 I had heard of a spot that had lots of cattails, so Emma and I went down there and slogged around through a swampy spot gathering armfuls. A lot of them we could pull up easily, many of them were waterlogged and rotting. We bundled them into Emma’s car and brought them home to dry. 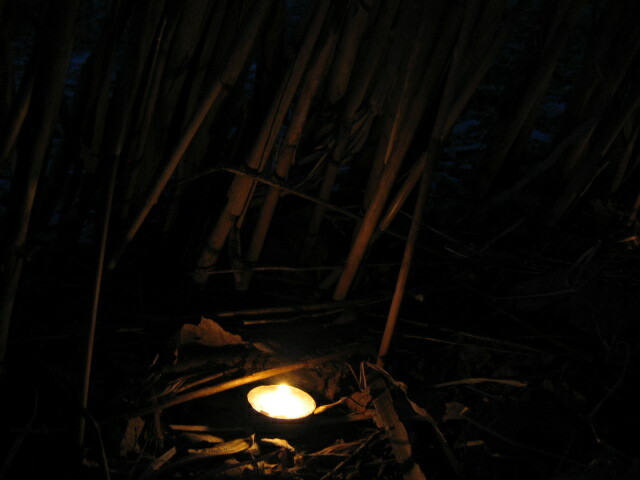 On her way home from that excursion, Emma found another spot with many more reeds, taller ones. Next Sue was brave enough to join me on this mad errand. 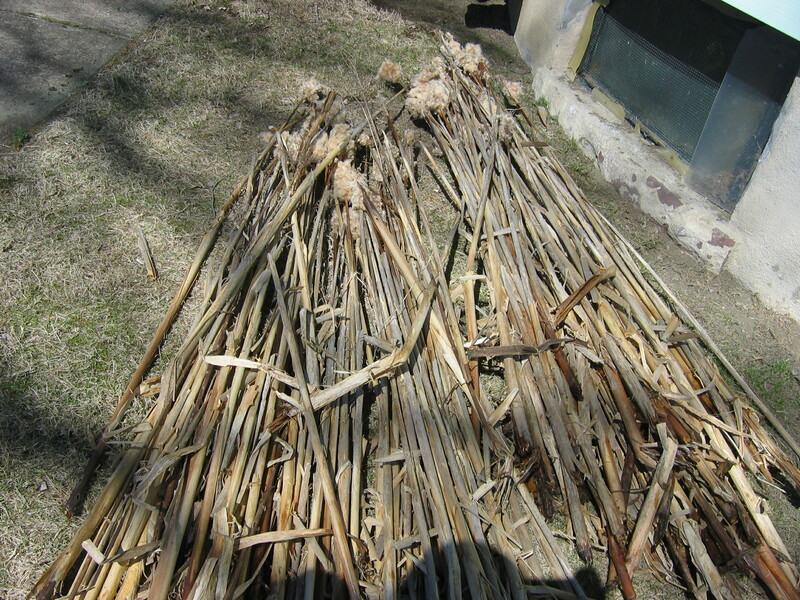 We gathered lots of reeds and brought them straight to the spot I was building at school. The bad news is that we found a frightening number of ticks on us after this. The good news is that they were all dog ticks and none had attached yet! 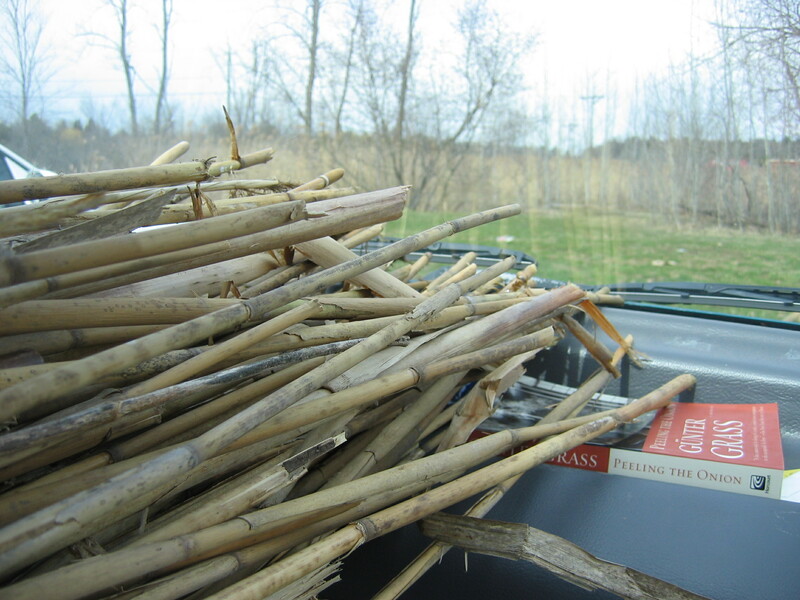 Other fun facts- reeds can give you lots of tiny cuts and splinters, and they may not fit well in your car. 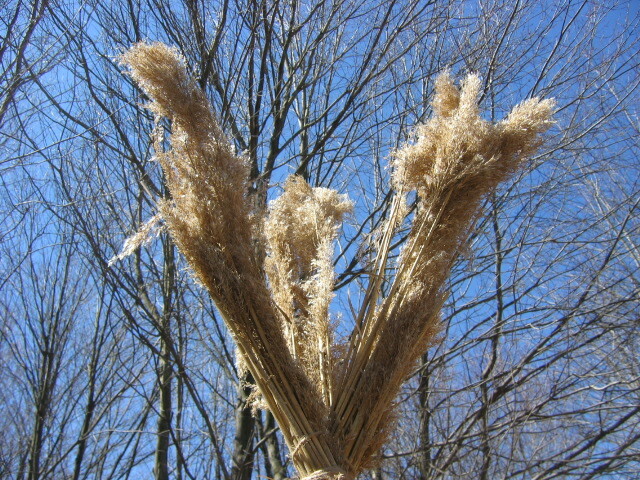 These were a different species, phragmites. 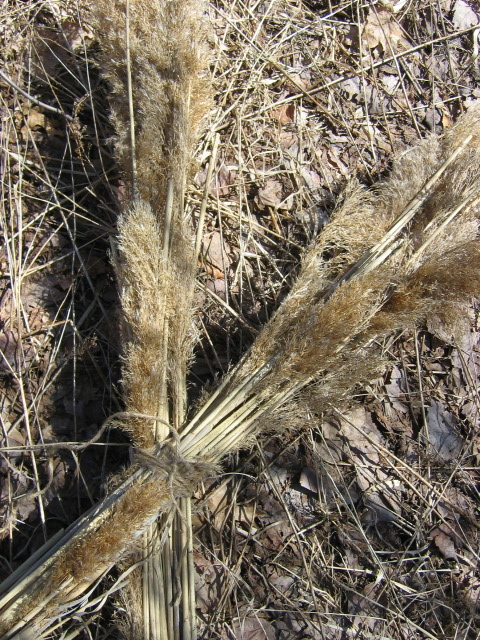 The stems are hollow like straws, and they are harder, taller and thinner than the cattails, which are not hollow and are much more dense. 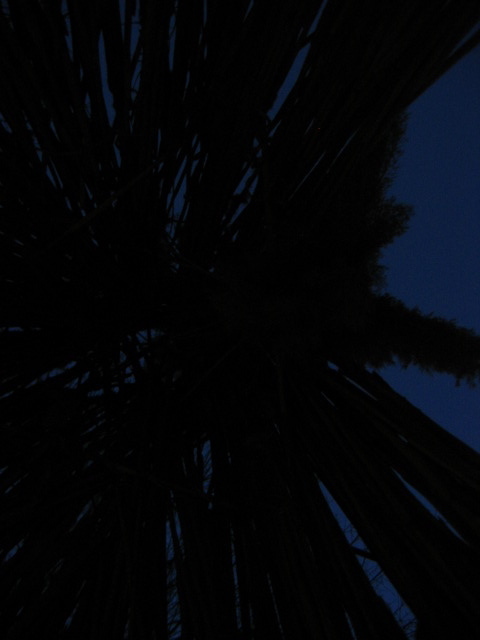 In my thatch research, I learned a lot about roofs, which are apparently much better documented than thatch huts are. 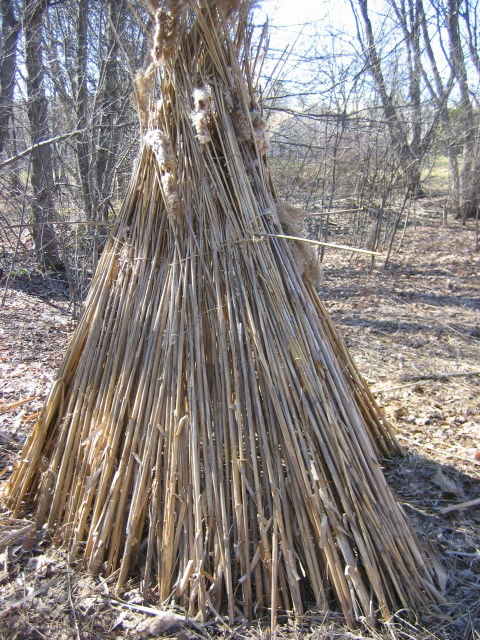 I had to turn to the internet because neither the school libraries or the public library system had any books on thatching. The closest I got was a book on historic preservation that had a chapter on repairing wattle & daub. It was actually interesting, but not terribly relevant. The one book I had that did help tremendously with this structure and my entire project was Shelter, published by Shelter Publications. This is one of the best books ever. It is all over the place and not very well organized but still an amazing resource and full of exciting pictures and diagrams of shelters all over the world. 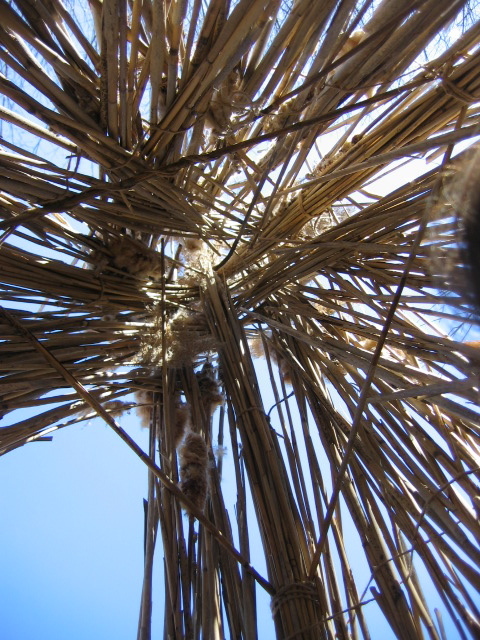 I found some resources on the internet about how to build thatch huts. They all said you needed a wood frame to thatch onto, but I don’t believe this to be true. 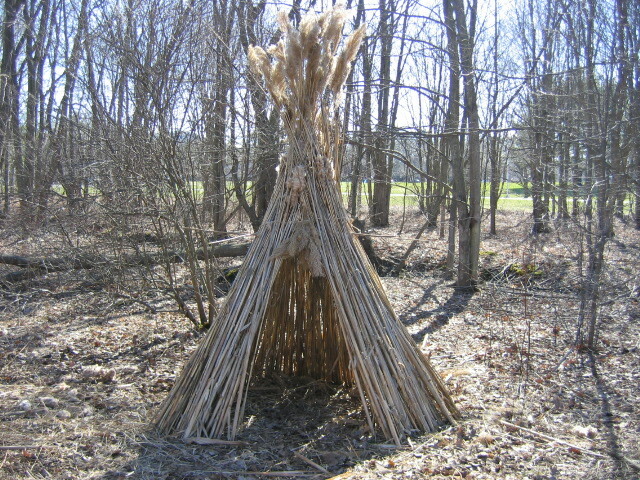 I decided to go with a design based on tipi structure. I started by sorting the reeds on site. 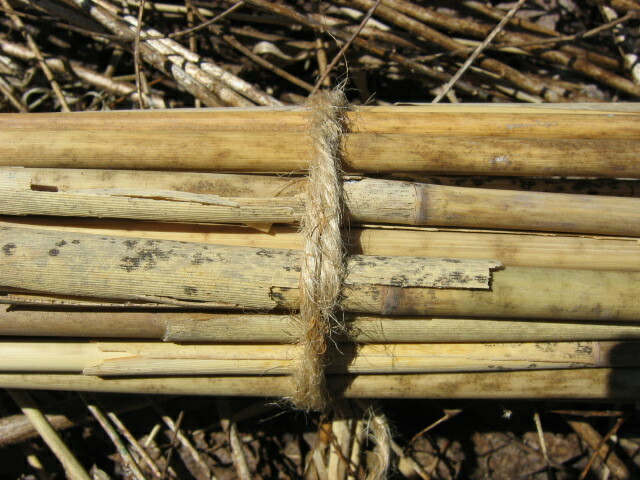 I put the longest ones onto three bunches and bound them together tight, creating three reed “logs” for my frame. 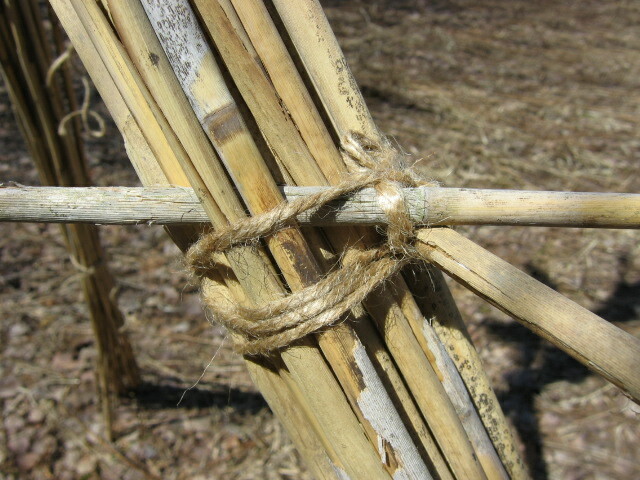 and then bound the joint together, looping over and under to make sure each bunch was supported. I tied it tight and then stood the whole thing up, unfolding it tripod style. Voila! 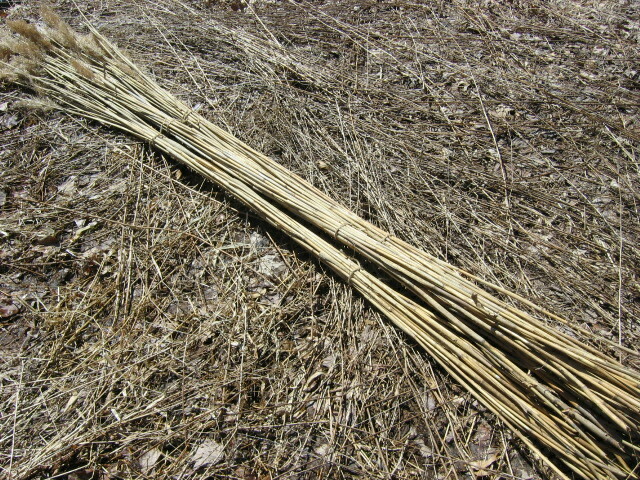 Thatch needs something to be sewn onto, so the next step was to create crossbeams. 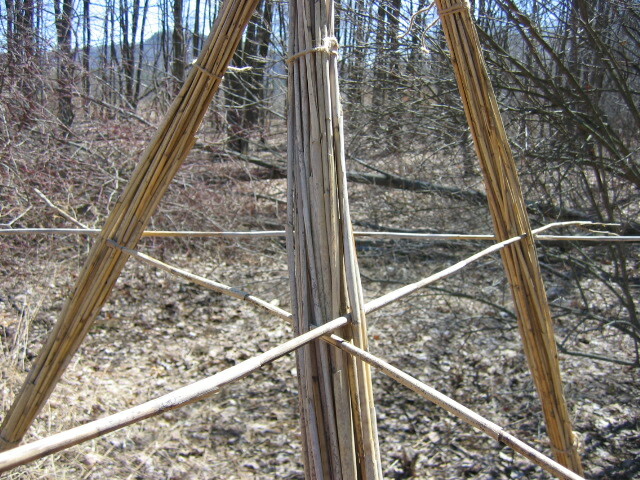 I drove a reed crossways through each bunch, joining the sides and making a sweet looking triangle in the center. 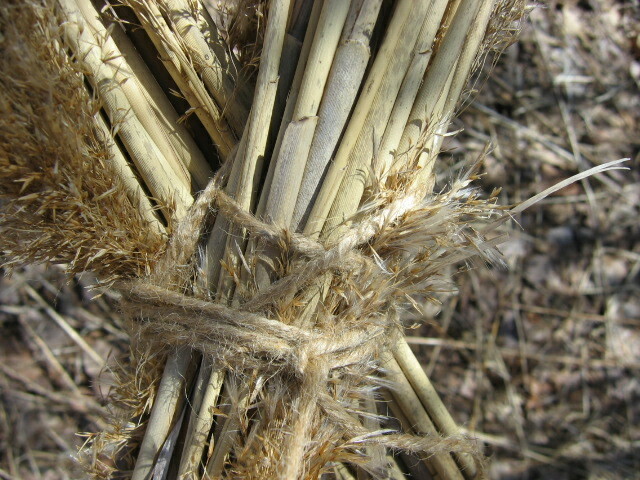 I then bound these reeds in place so that they won’t slide up or down. 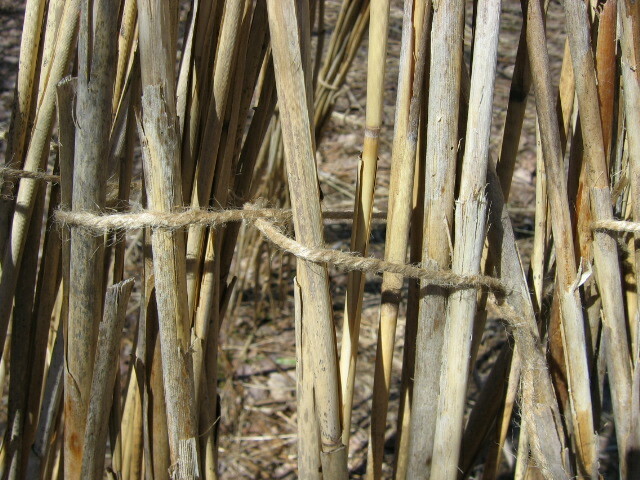 Then I started leaning the remaining reeds along either side to form walls. Some were tall and I had to trim them. I drove a few more short pieces through the three main supports to hold the wall reeds in place while I worked. 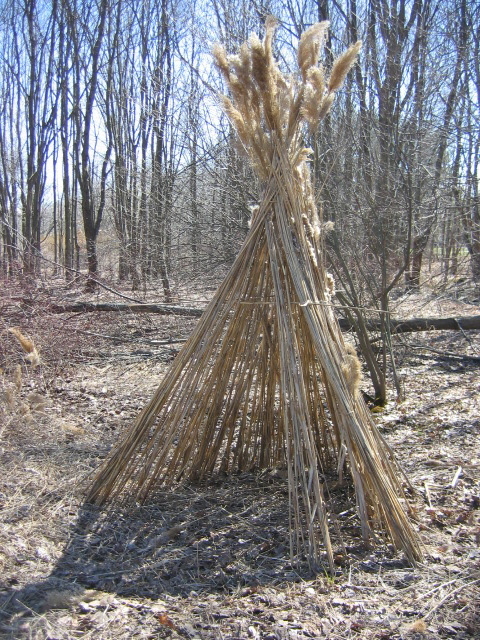 When I had relatively solid walls on two sides I made a thatching needle out of a piece of reed and sewed the reeds in place. I used a simple in and out stitch like you would sewing cloth, only I went back across stitching so that the reeds were held in place on both sides, matching every in with an out, so to speak. 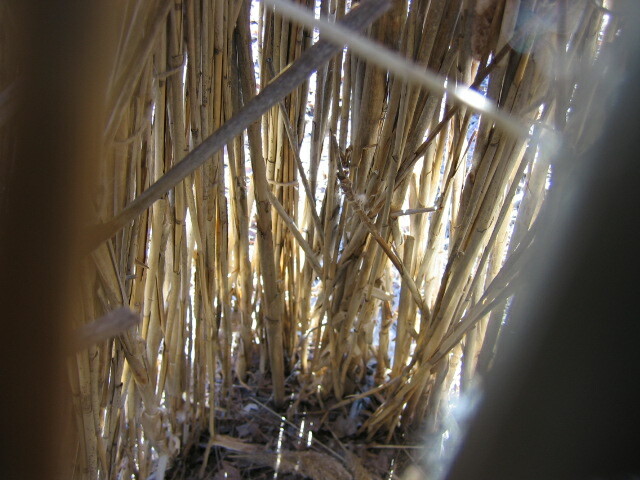 On the front side I used shorter reeds to create the wall around the door. 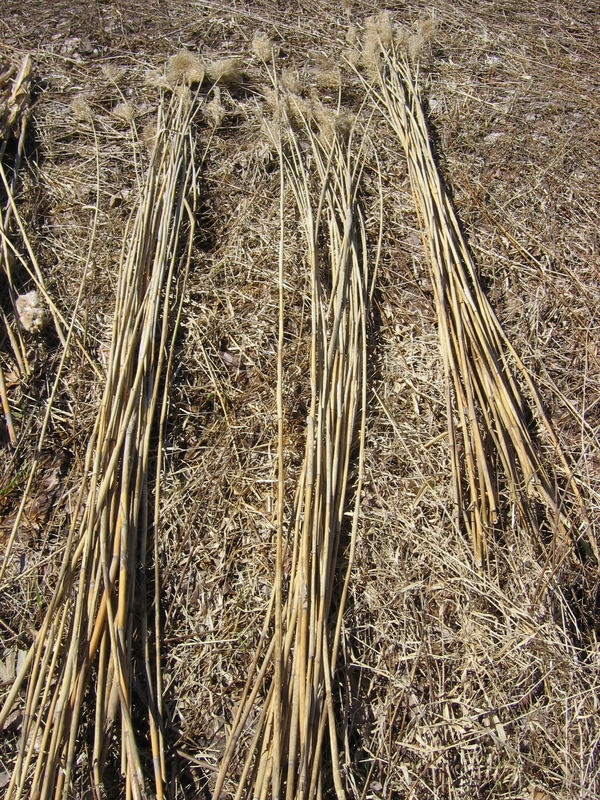 After that it was a matter of just adding and adding and adding reeds, tucking them into the stitches to fill in gaps and strengthen weak spots. 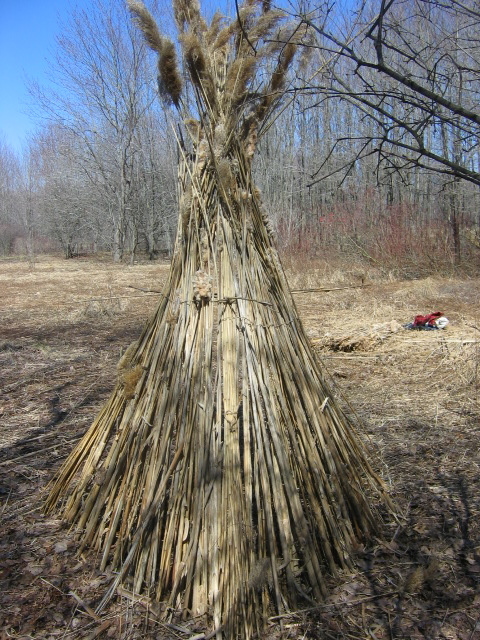 The whole process went a lot faster than I expected- once I gathered the reeds, I built the structure in one afternoon! I hear people like a picture of a person, so here is a person. 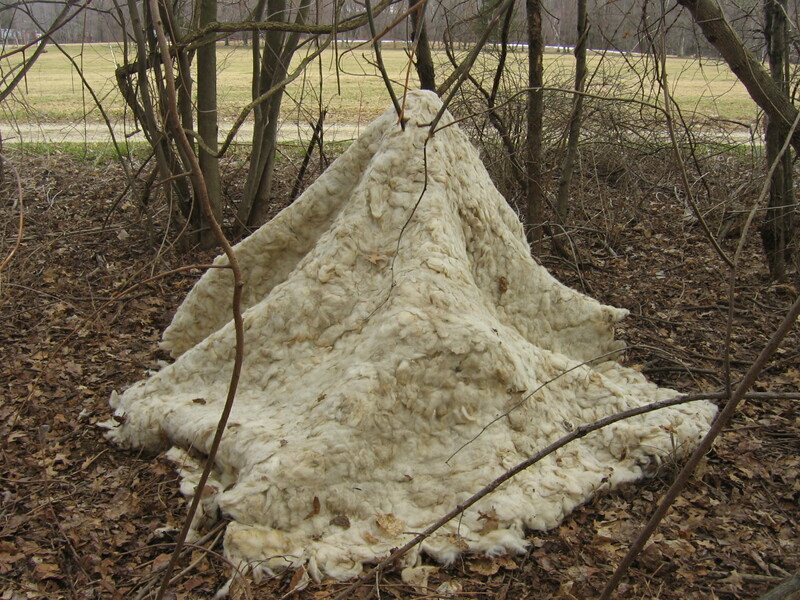 I had several ideas for how I could turn a giant piece of felt into a structure. My first idea was to felt it over a mold the size I wanted the structure to be. 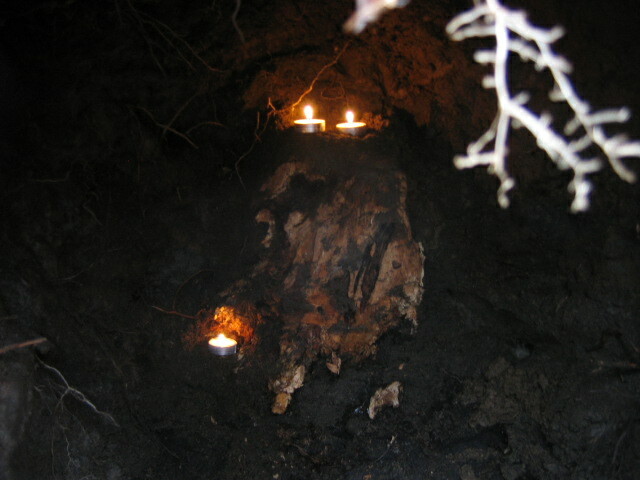 My second idea was to dig a hole the size I wanted the structure to be and felt the whole thing in the hole, an inverted mold. Both of these ideas seemed overly complicated by the time I actually got to the production stage. My third idea was to cut a slit halfway into the felt and roll it up like a giant cone. 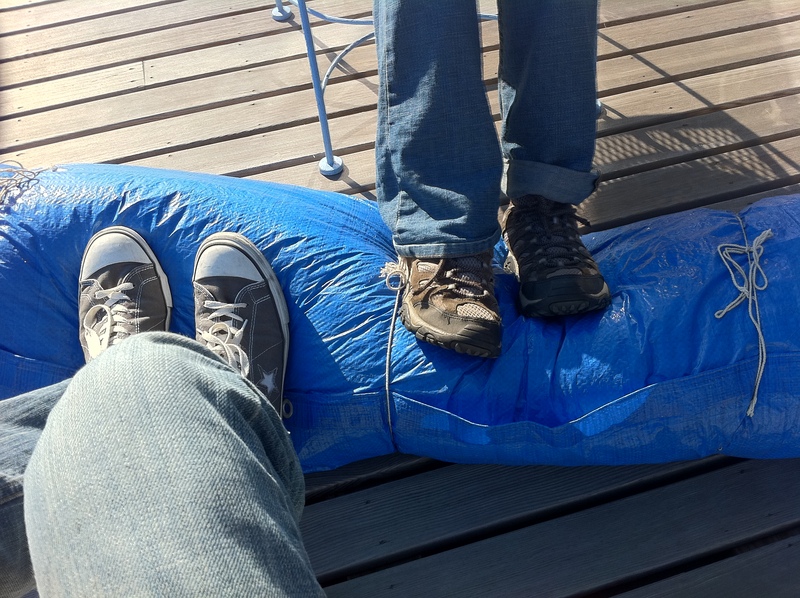 I was hoping the felt would be stiff enough to stand on its own, but it was too floppy. Doubled over it could stand, but one layer wasn’t stiff enough. I decided it made sense to go the way of my Mongolian cousins and give it a simple wood and bark frame. 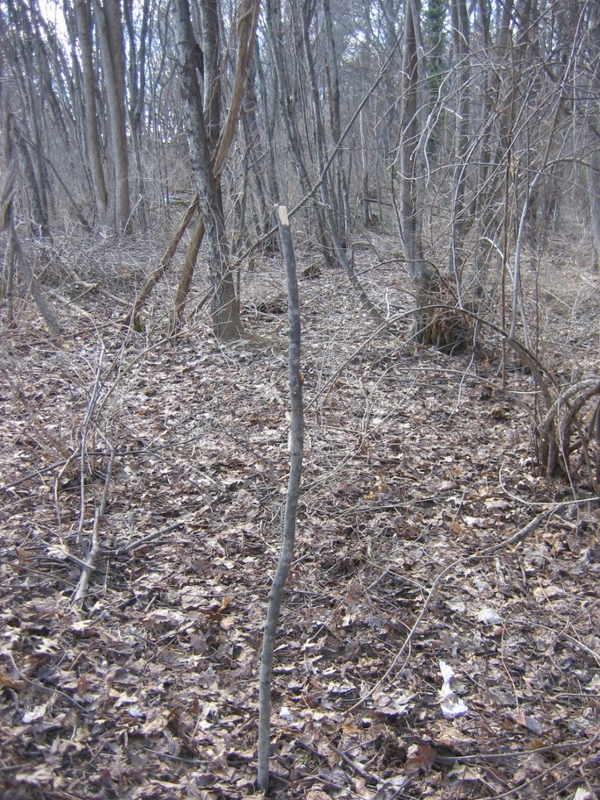 I located the structure on the edge of the woods alongside a pasture. 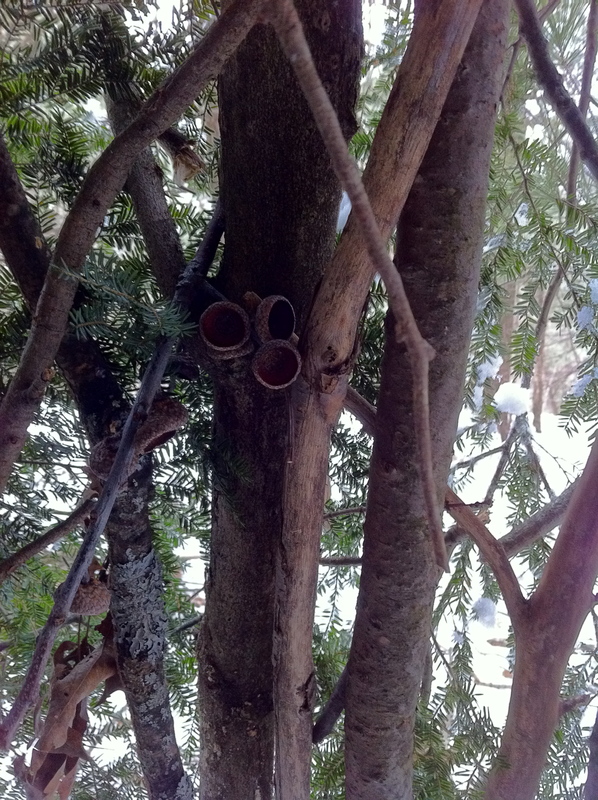 Starting with a center post, I placed some bark on the top of the branch to keep it from puncturing the wool. 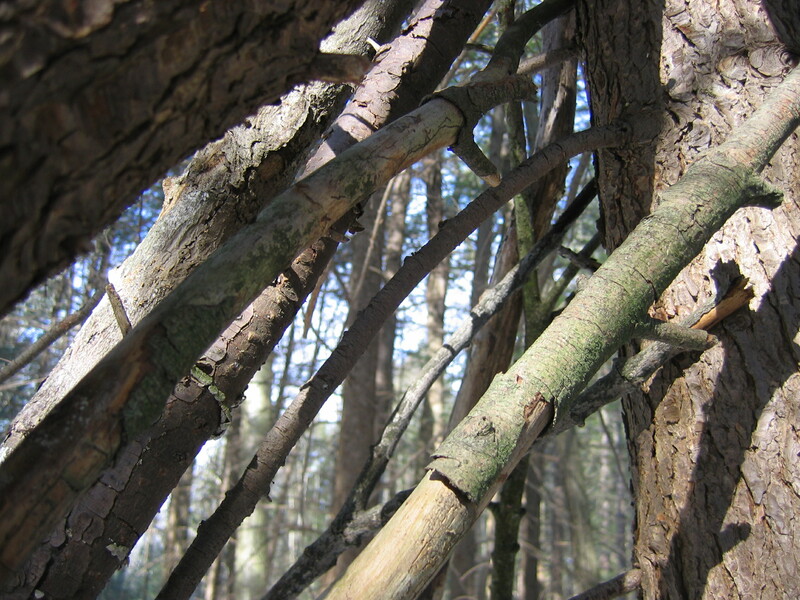 I then found three branches I could use as cross bars or “ribs”. 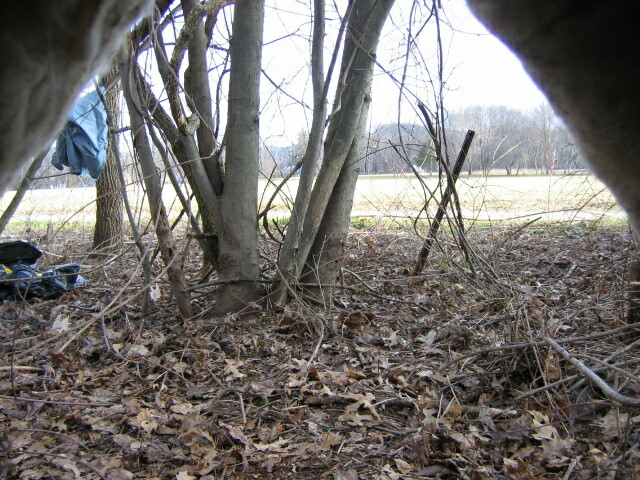 One of these went across the back of the shelter, the others across the front, creating support for the doorway. 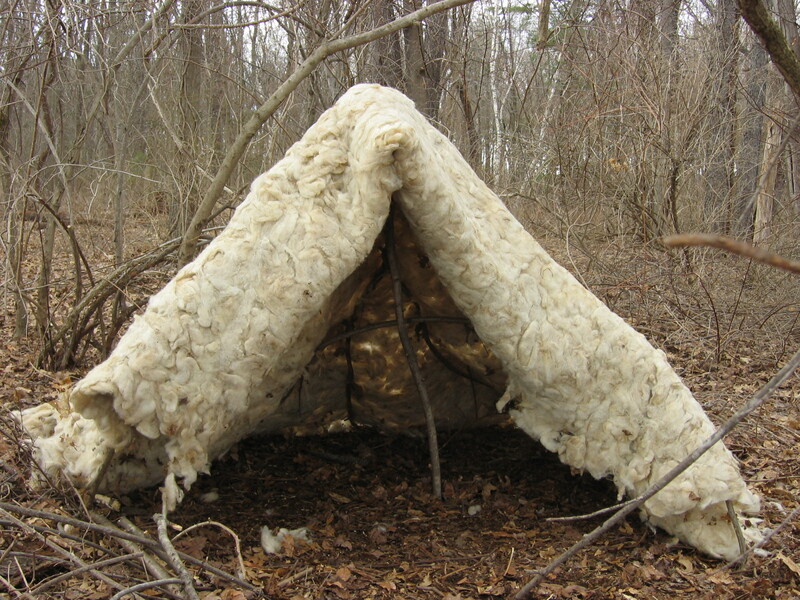 My first attempts at placing the felt were pretty lopsided and wobbly, but I found that doubling the felt over from the front to the center pole, so that there were two layers in that area, made the shelter much sturdier. 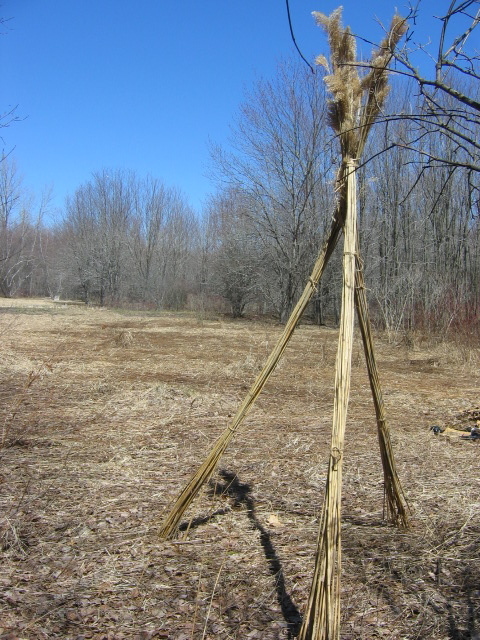 What does this tell me about what I would have to do to make a freestanding felt structure? That it would have to be even larger so that the felt could be doubled over, or with thicker felt. 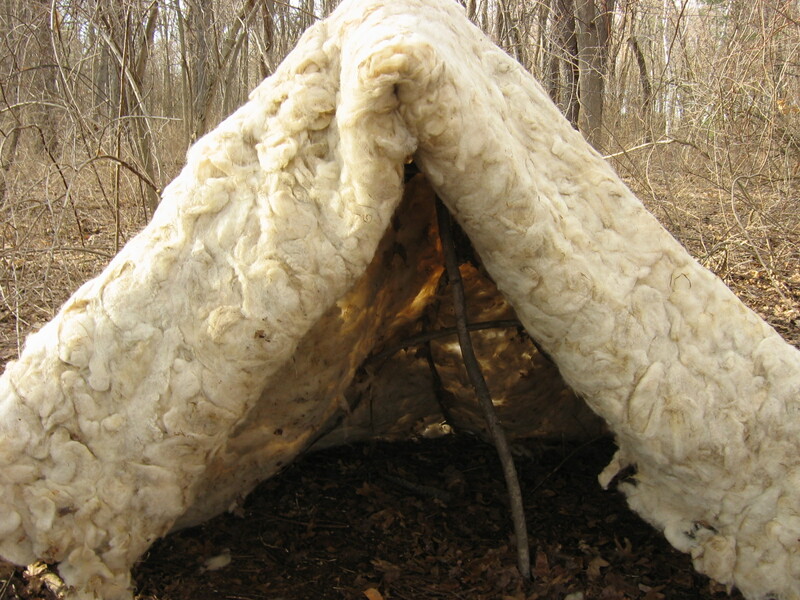 That said, if you did happen to be in the woods with a pile of wool and needed shelter, wool has such great water-resistant and insulative properties that just sleeping curled up in a pile of it would probably do you a lot of good in a pinch. Being inside felt nice and cozy, especially lying down. Unlike the other two structures, lying down felt like the thing to do in this one. Maybe just because the cieling was lower, or maybe because it felt more like a pillow-and-blanket fort than the others. 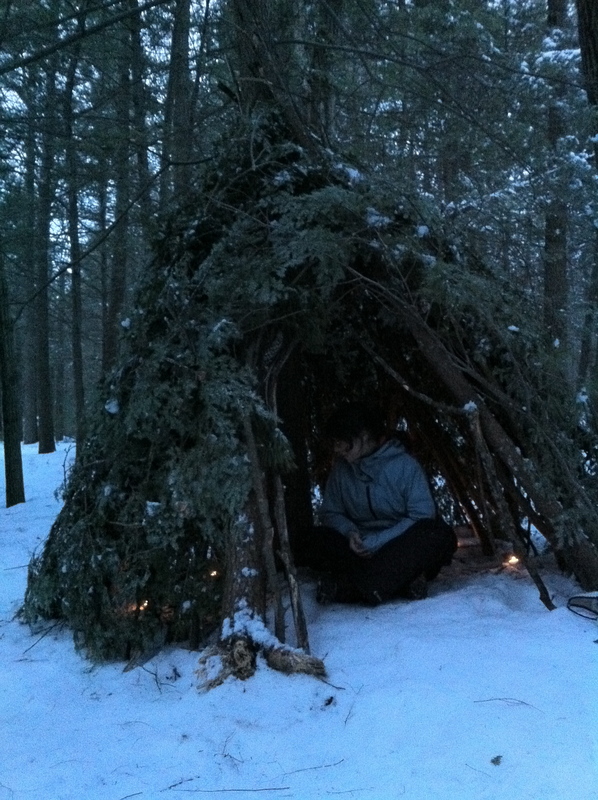 It felt kind of like being curled up in a giant sweater. Inside was noticeably warmer than outside, pretty much immediately. 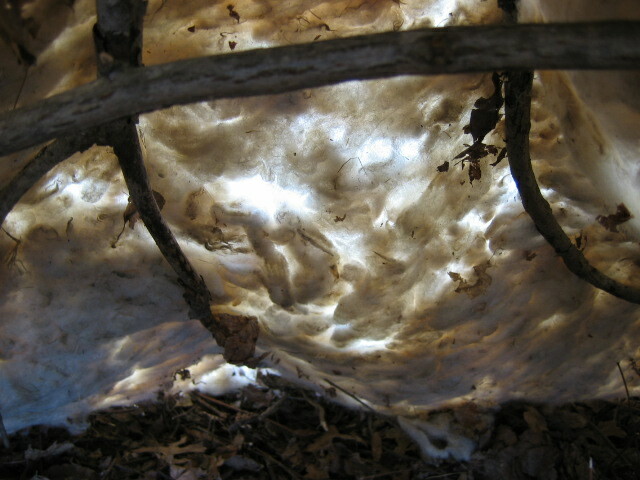 The light shown through the wool in a stunning way. 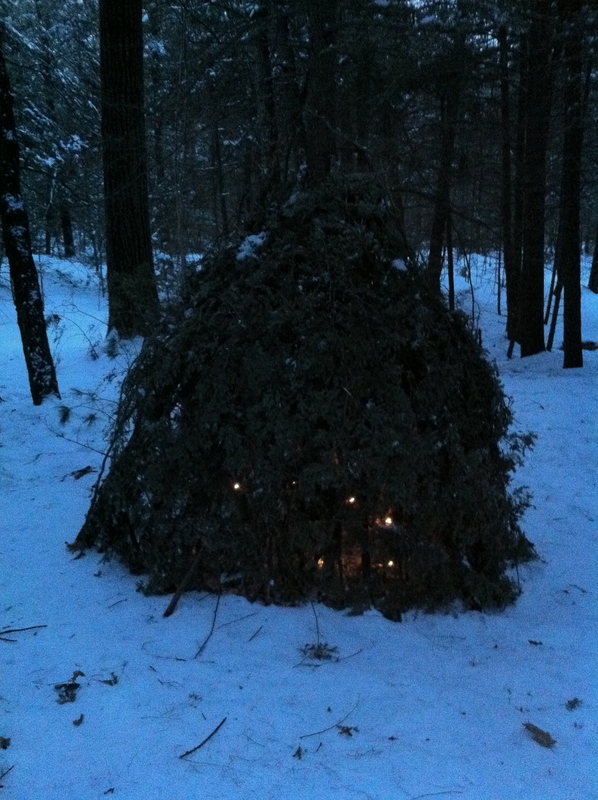 This was the first structure I was working on and encountered other people. A few runners and bicyclists and walkers passed by on the farm road. Only about 5 of them saw me in the trees. I heard one bicyclist say to another “You never know what you’ll see in the woods around here!” Two girls stopped and asked what I was doing, one of them took a picture for me. One other girl said she was heading to the farm because she’d never seen a sheep! I also had a close encounter with a redtail hawk. Beautiful. I stayed out until it began to get dark. 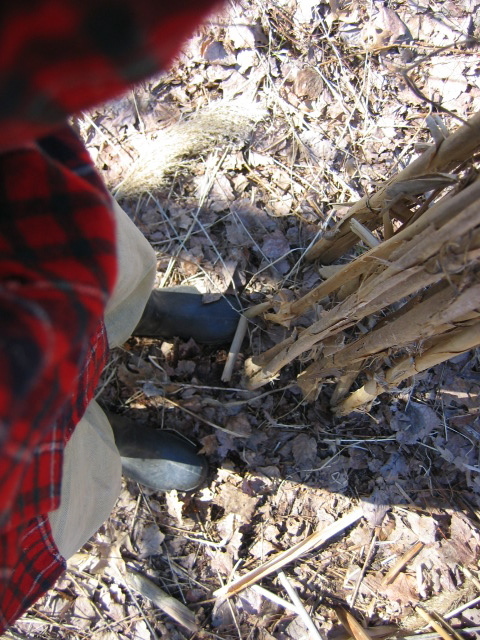 Around that time I started hearing dogs in the woods, and the gunshots. I tried to tell myself it must be sound carrying from the firing range, and that no one would hunt on the border of a farm, but part of me began to wonder if some weird animal was in season in the spring. Eventually I decided better safe than sorry and broke camp. Those of you who make it to my final show will get to meet the giant felt! I decided not to leave it in the woods so that I could have it to show people. Perhaps you are wondering where I’ve been. 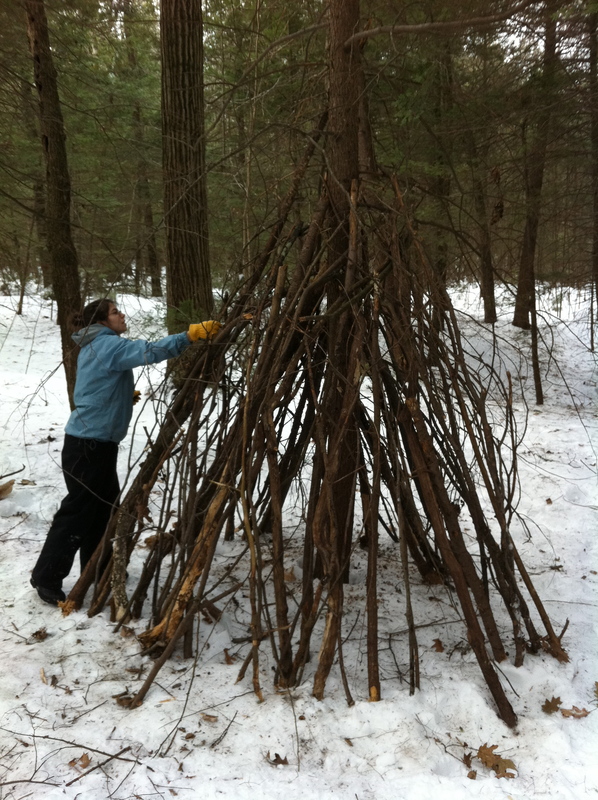 My latest structure has been by far the most challenging, logistically and physically. I had a feeling it would be, the material and the method both being pretty far out of my comfort zone. I also had a feeling that this would be the structure I’d learn the most from– also true so far. 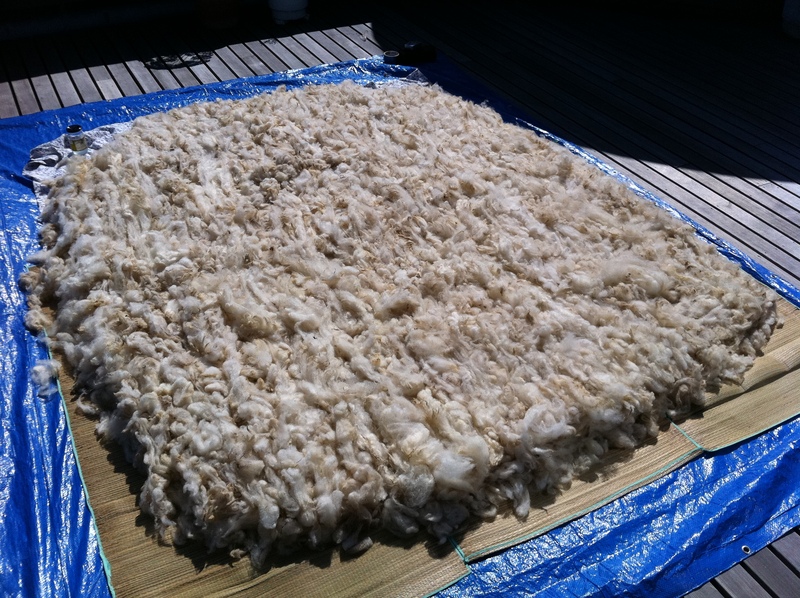 After doing quite a bit of research, I decided to felt this structure using a method similar to the ones used in east central asia, combined with a rolling method I found that is used to make large felt pieces such as blankets and rugs. First I needed wool. 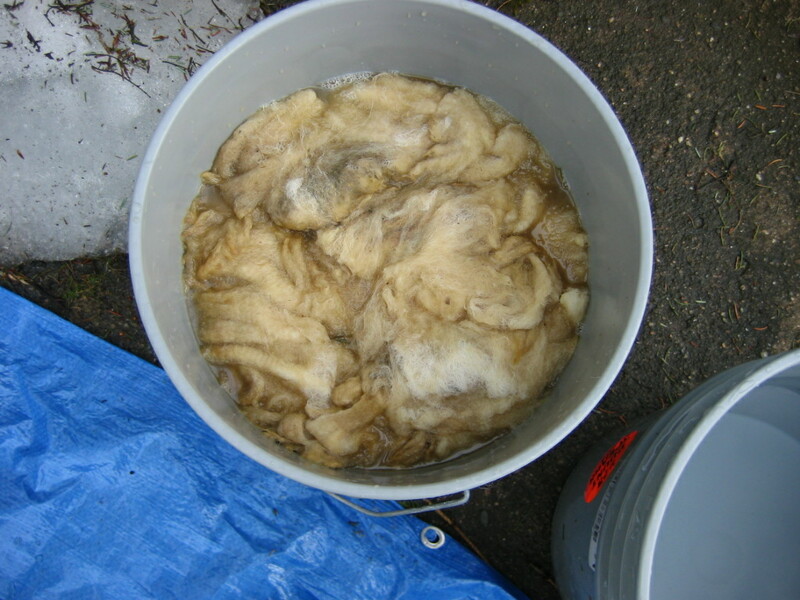 I began by asking around among people I knew and also on Freecycle, and got several bags of wool from those sources. 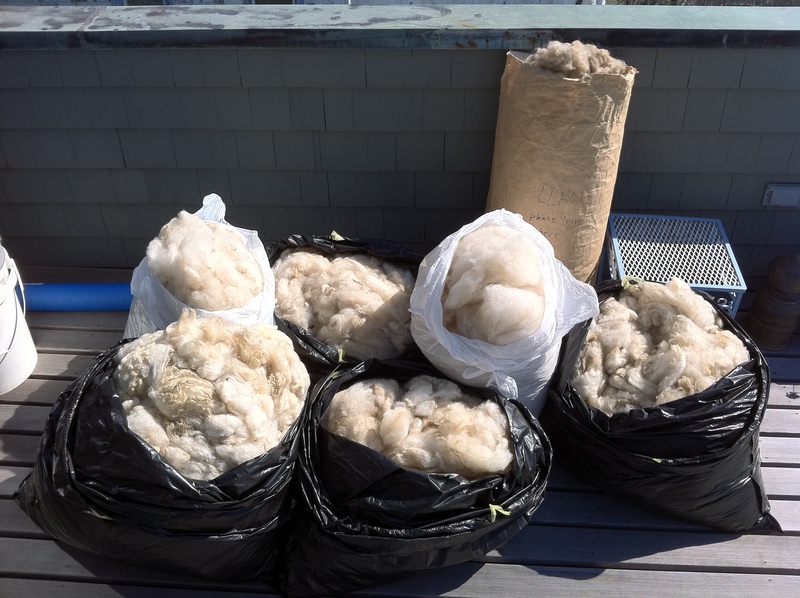 I also got two bags of wool from the Hampshire Farm Center. As I continued by research, I realized I was going to need a tremendous amount of wool, so I began searching farther afield. 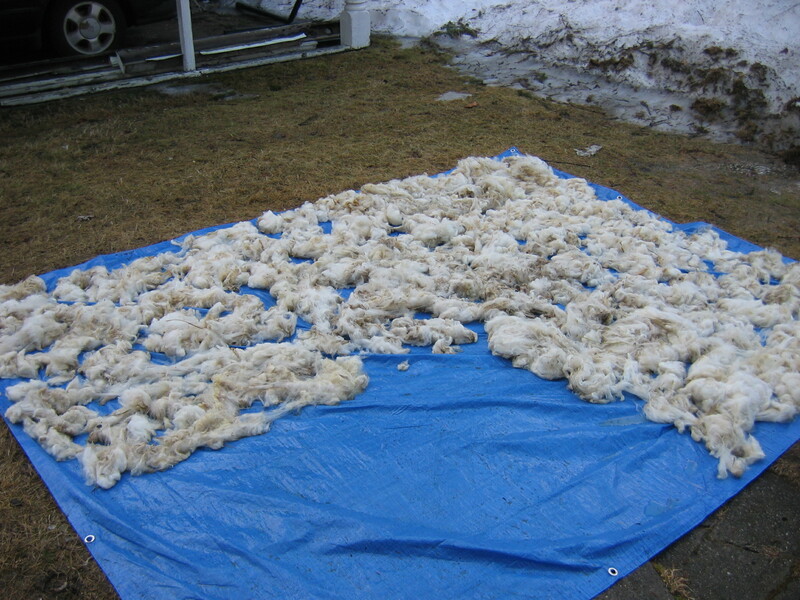 My friend Llani gave me one big bag, and through a chain of about four people I found a man in Charlemont who shears sheep and sells the unwashed fleece for $1 a pound. What a deal! On a rainy, muddy day, I ventured up into the hills. It was a beautiful drive, sudden vistas, mist hanging in the valleys. 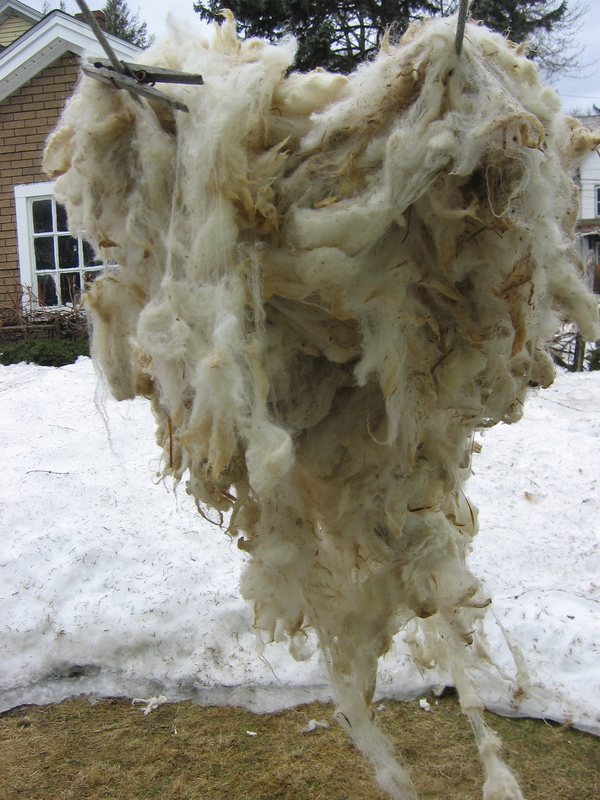 After trekking up a long, snow covered driveway, I bought about 25 pounds of wool. 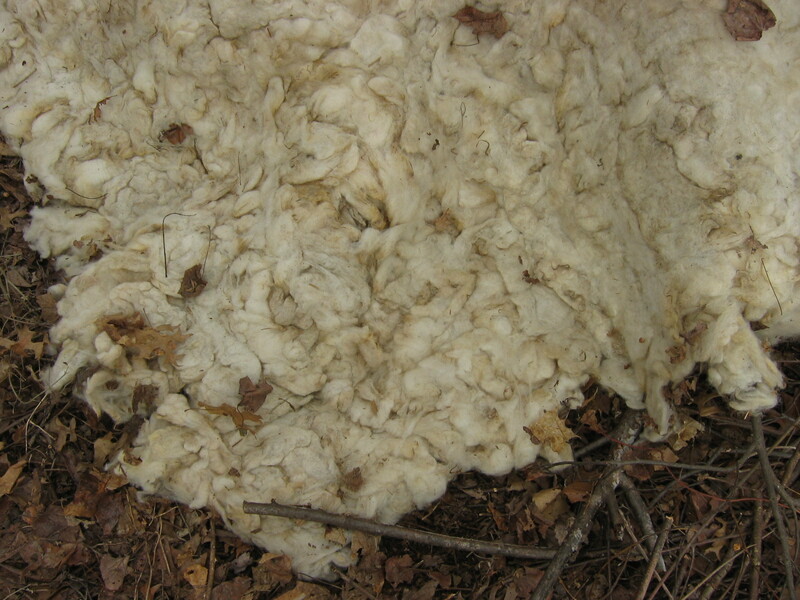 The fleece was pretty dirty. I didn’t use the worst parts, the rest I washed by soaking in two buckets of water, a wash and a rinse. 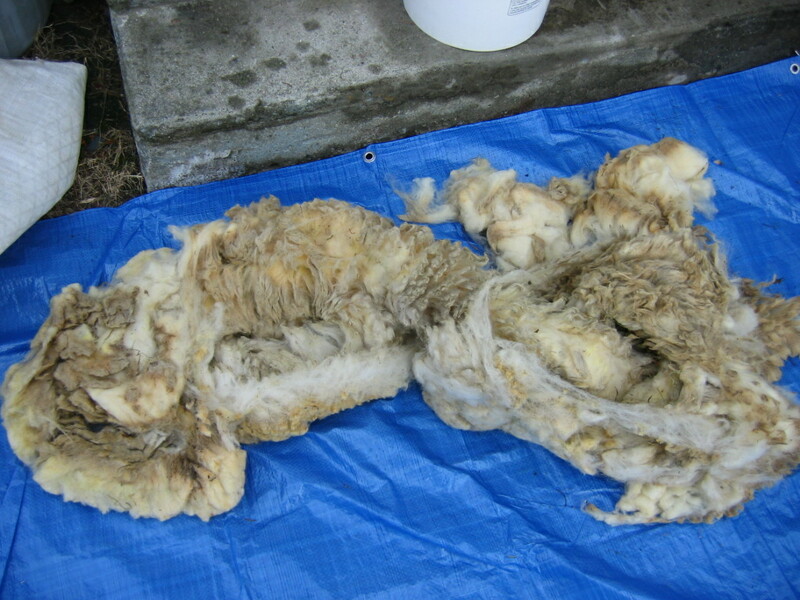 I didn’t use soap because I wanted to leave the lanolin, which is the waxy-feeling, water resistant stuff on the fleece. 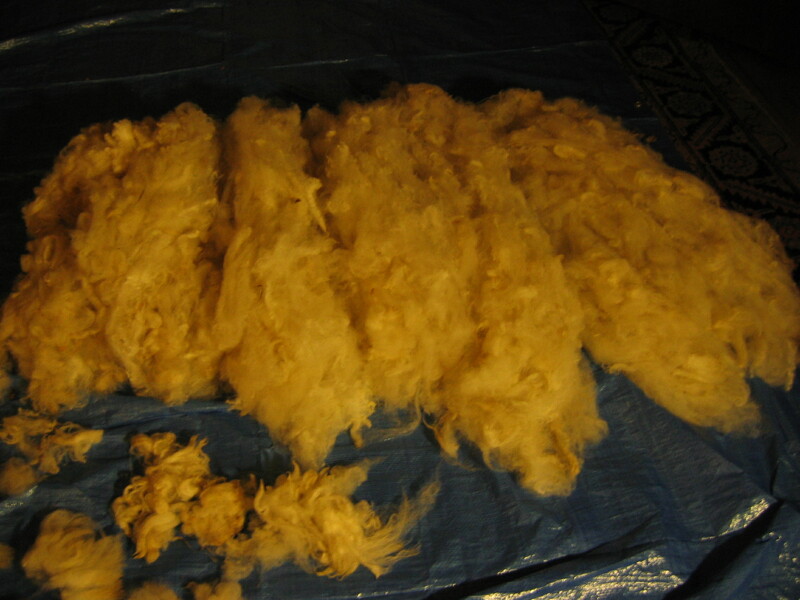 I had to be careful not to agitate the wool, which could start the felting process before I was ready. Washing was really tiring because buckets of water are heavy, and so is soggy fleece. Drying was difficult. 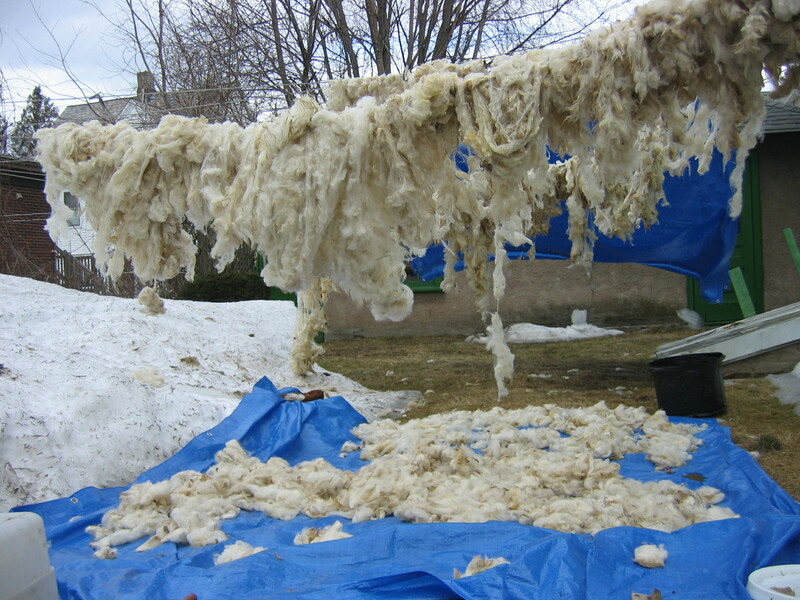 I spread the wet wool out on egg cartons, old newspapers, and tarps. I even hung larger chunks on the clothes line! This created some images I really love. This was an endless task. 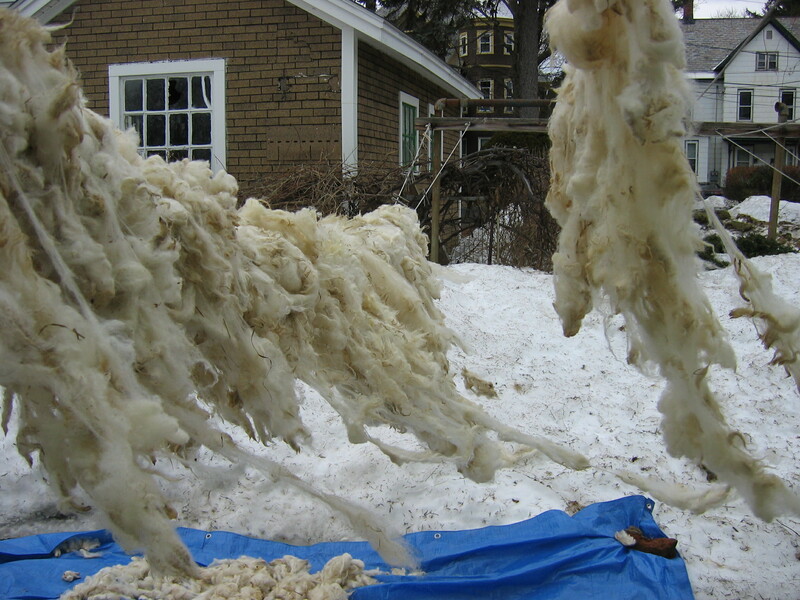 The idea is to get the fibers fluffed and running in the same basic direction. 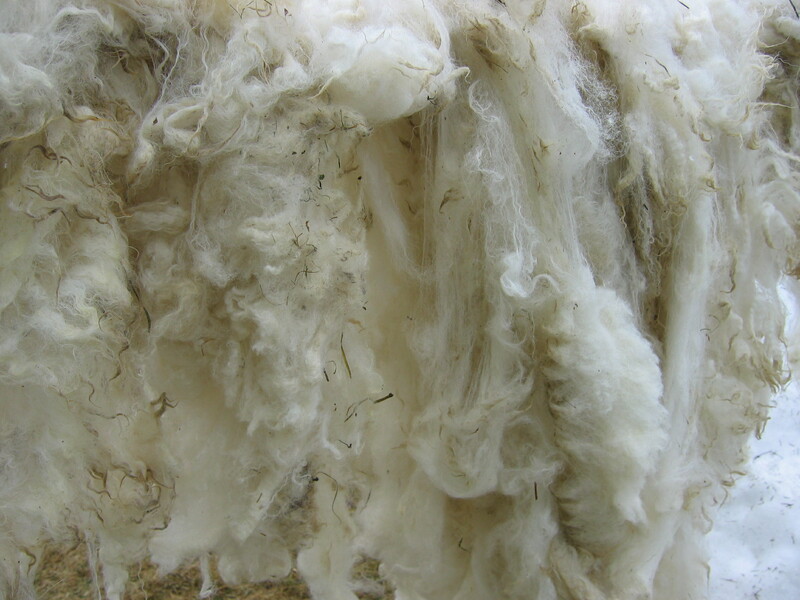 I didn’t card the wool because they don’t do that in the rolled mongolian method. 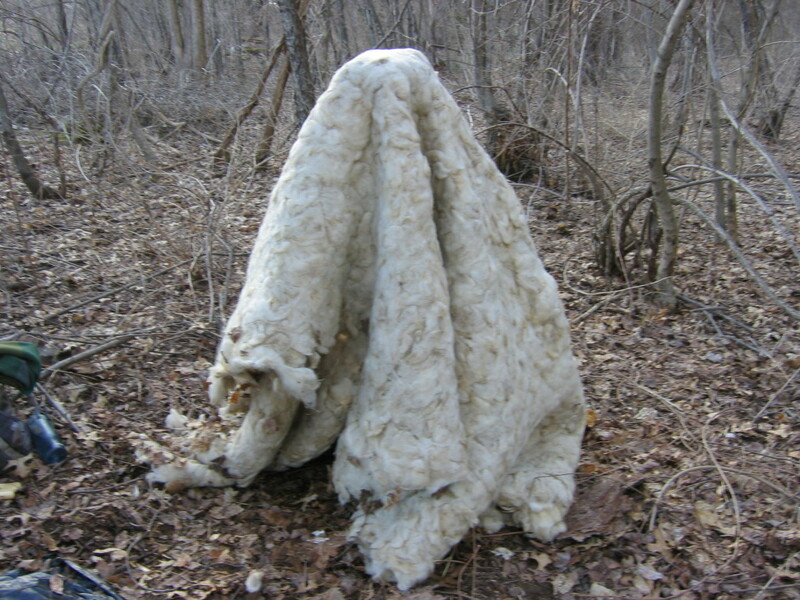 Instead, they arrange the wool by beating it with sticks. Hand stretching it was a middle ground I improvised. I should take this moment to acknowledge that I have a fantastic roommate who does not freak out when I fill whole rooms with wool. I made a pattern by putting a sheet over my head in the manner I planned to shape the structure. 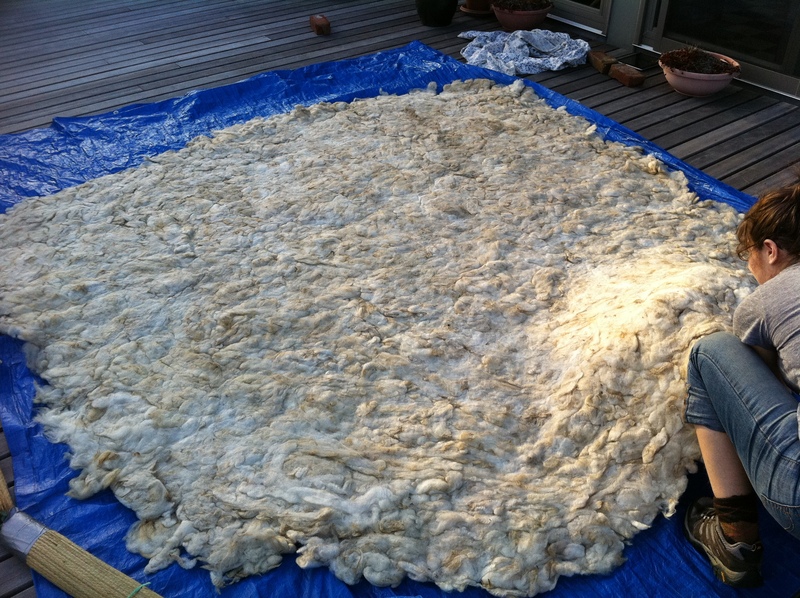 I found I would need a circle about 7.5’ across, so I laid out the wool to about 8.5’ to allow for shrinking. 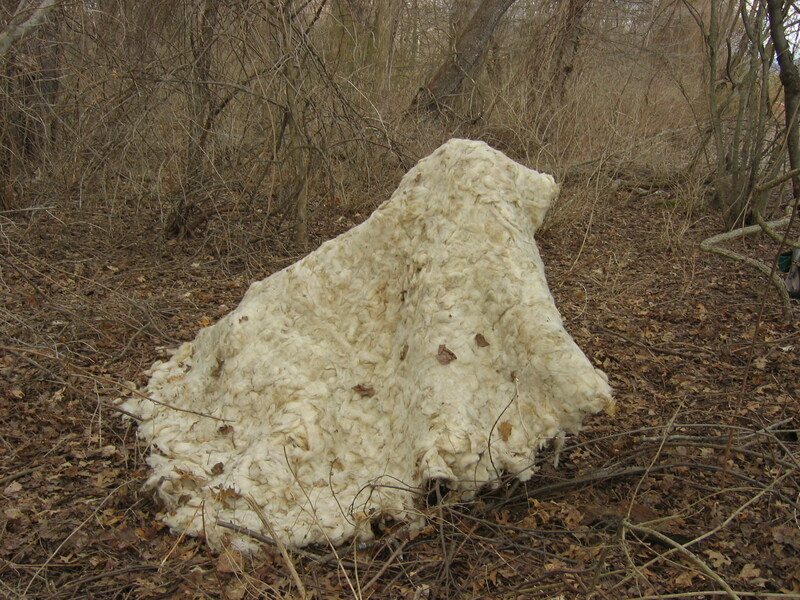 In traditional Mongolian felting, the wool would be laid out on an older piece of felt, called the Mother Felt. I used a combination of sheets and straw beach mats as my mother wool. 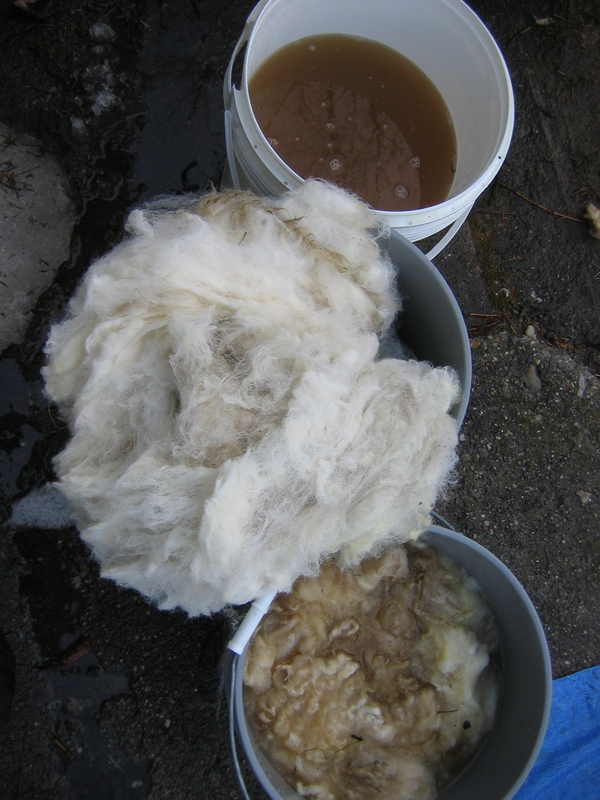 The idea is to have a material that the wool can have some friction against and that isn’t water tight. 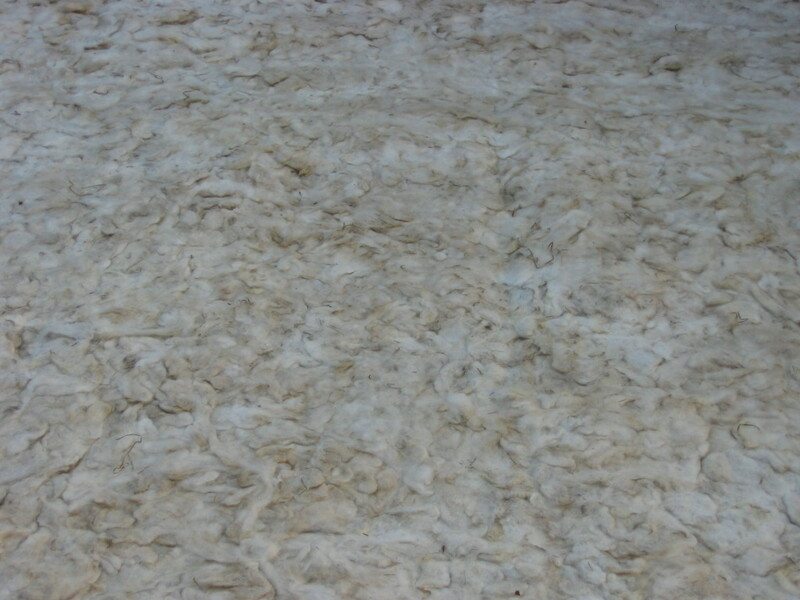 The first layer should be laid out with the fibers all running the same way, and the next layer should be laid 90 degrees across the first. We made three layers, the third layer aligned the same as the first. 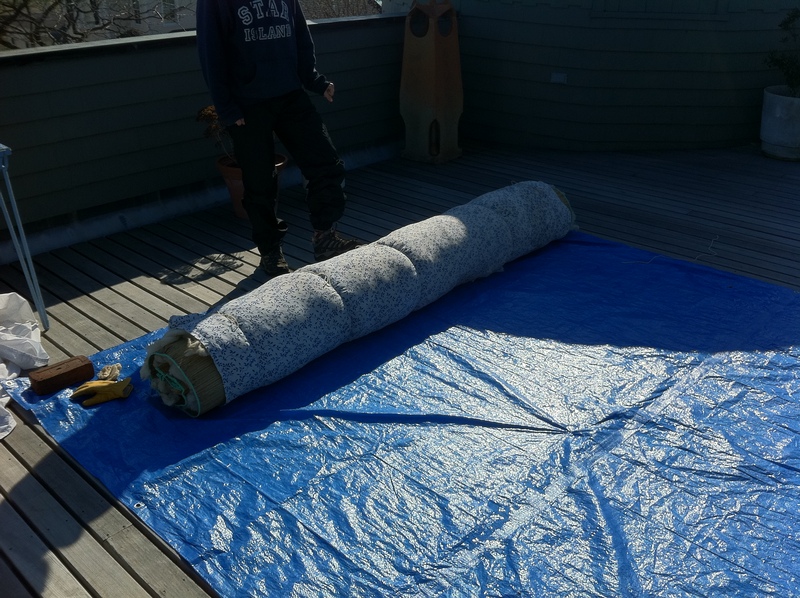 The idea is to lay the fibers so that they can tangle into each other as you roll the wool, so I didn’t try to flatten each layer too much. 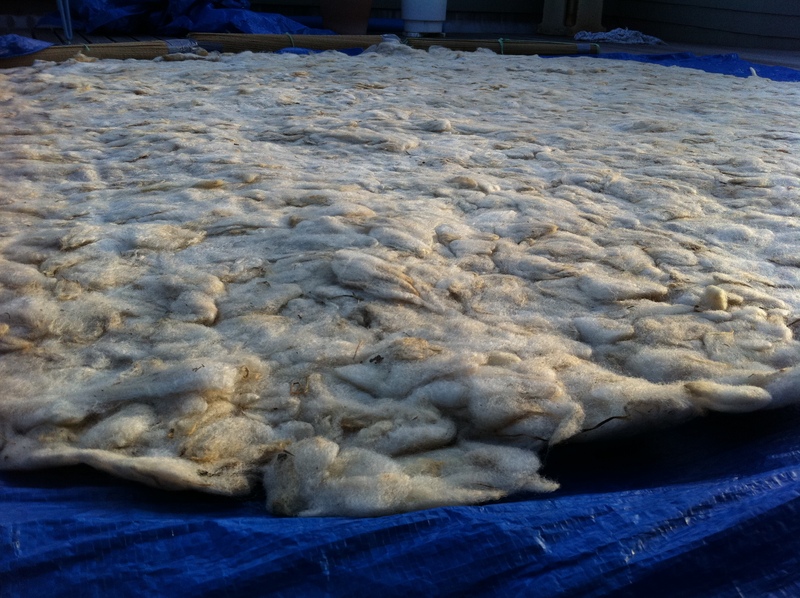 The felting solution I made was hot water mixed with a bit of oil soap, sprinkled on each layer, and periodically throughout the rolling process. Once I had the three layers arranged, I flattened them together by rolling over them once with a pool noodle. Then I placed the pool noodle at the edge and rolled the whole thing up like a cinnamon roll, and tied it shut in several places. Then we rolled the roll around with hands and feet. 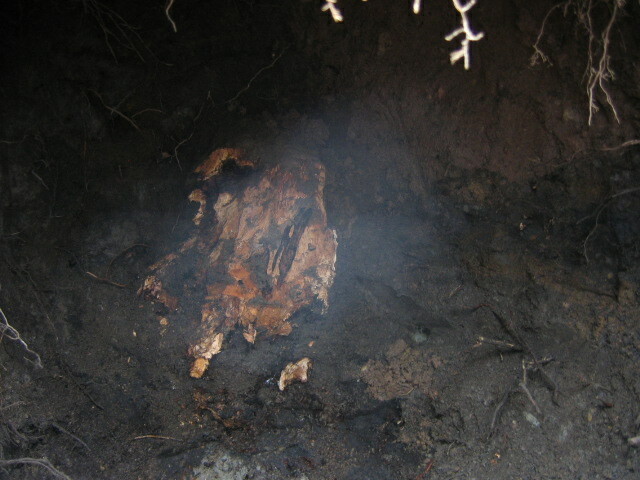 Traditionally, this work would be done by a horse or a camel, who would drag the roll around for several hours or a day. Having not horse or camel, I had to get creative. Step 7: and more and more and more rolling! 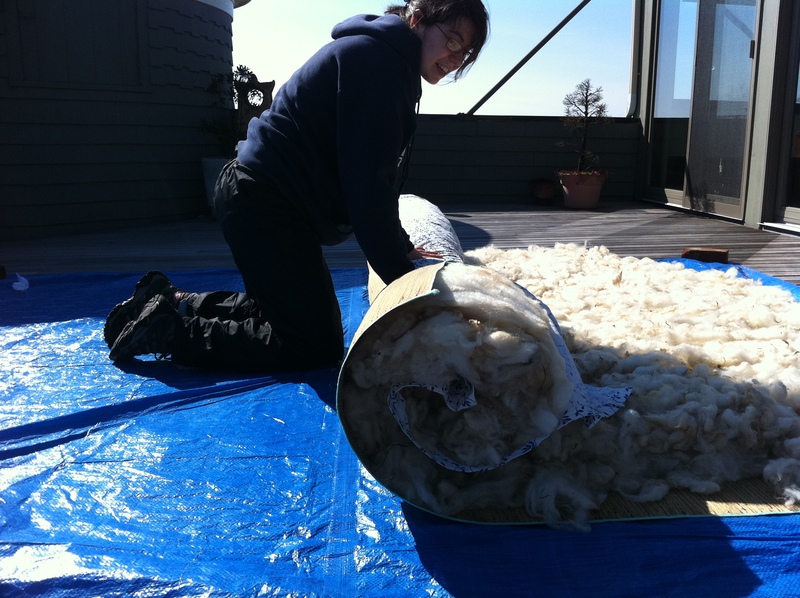 For the rest of the felting process, the idea is to continue agitating the roll, open it up and roll it up from a different direction, agitate it more, open it, roll it up from a third side, and so on. During this, I tried to keep pressure on the roll evenly distributed, so if I had help we would switch places and use hands and feet equally on each part. 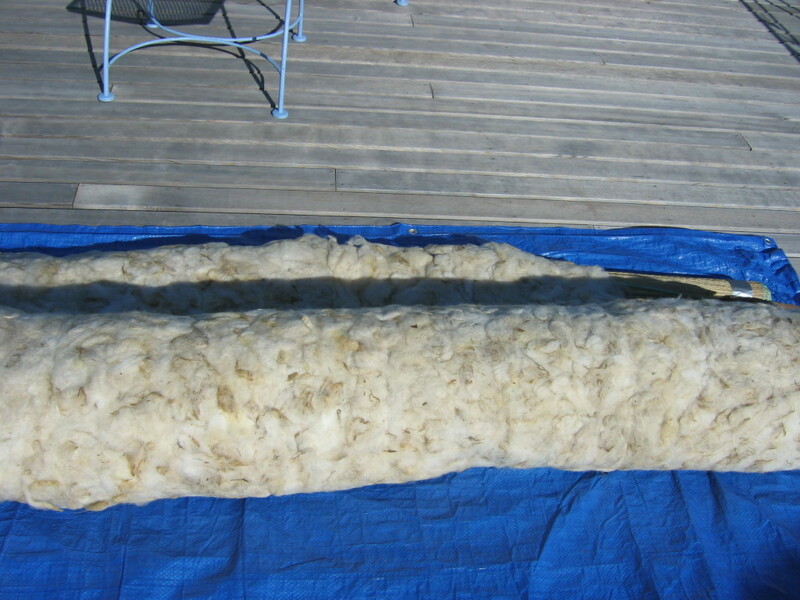 Once the felting is in full swing and the wool is beginning to cling to the mother wool, the whole thing should be flipped like a pancake and then rolled and rolled and rolled again on the new side. At this point I had to make adjustments. 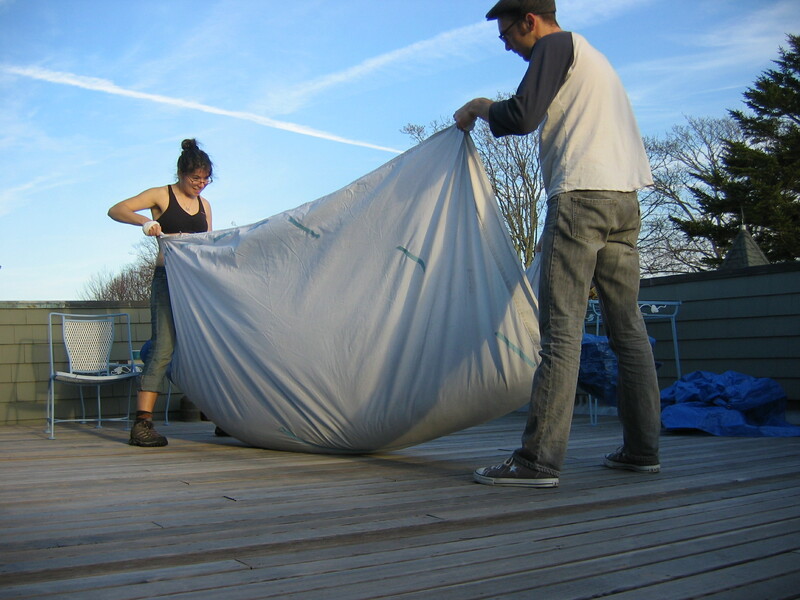 The wool was simply too big for the straw mats, so I rolled it up in a large tarp instead. Then I rolled up the mats and used them as the center of the roll in place of the pool noodle. This worked much better. Step 8: …and turning and flipping and rolling! 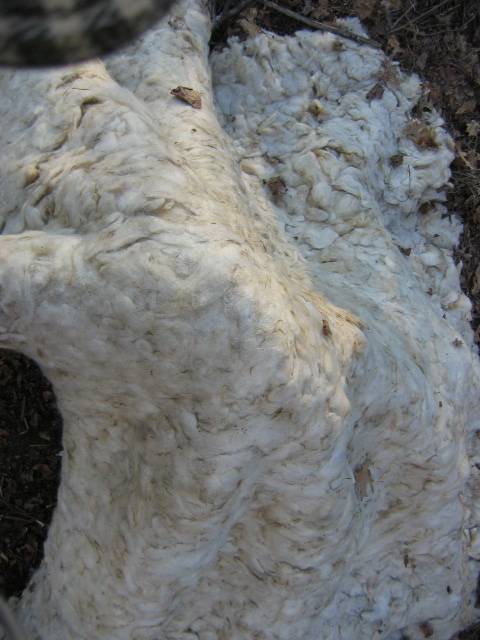 Fleece fibers have scales all over them, and agitation causes the scales to peel back and tangled with each other, forming a dense mat instead of a fluffy cloud. It takes a lot of agitation. After trying lots of methods, I discovered that rolling the whole roll back and forth in a sheet was the easiest way of creating consistent agitation. In these pictures, you can see how that works. 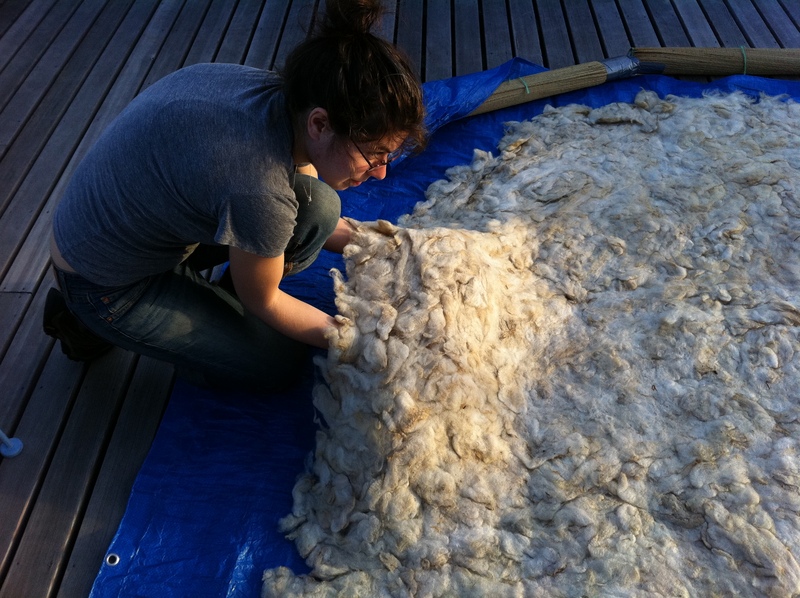 Be warned, felting a giant felt is really exhausting. You have to keep doing it for hours and hours and you will be sore. I was expecting this project to be a lot of work, and I was still surprised by how much work it was. Eventually the felt will get flatter and flatter and denser and denser. At last, I had what looked like a giant rug or blanket. How will this become a structure? Stay tuned! 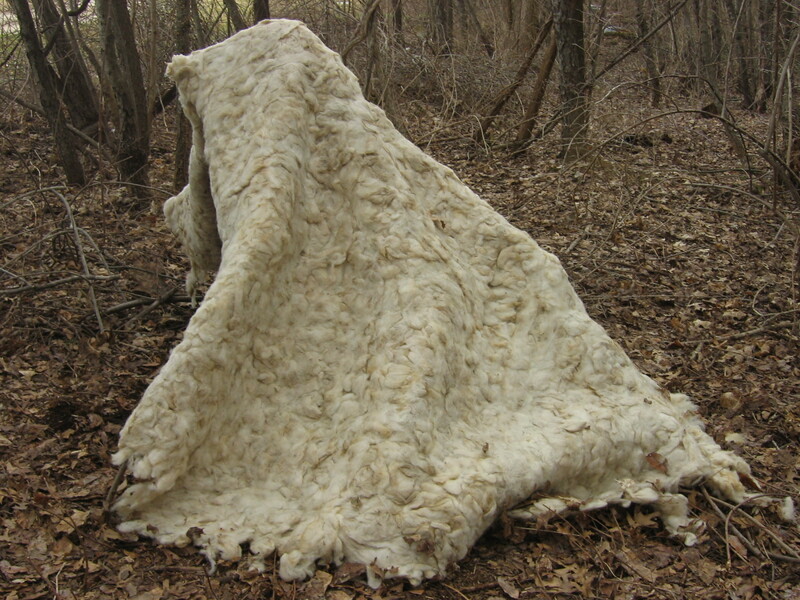 Acknowledgments: Llani, Leslie Cox, a couple ladies from Freecycle, my mother and Kevin Ford all provided me with wool. Hannah, Jedediah, Emma and Steve all helped me with wool transportation. 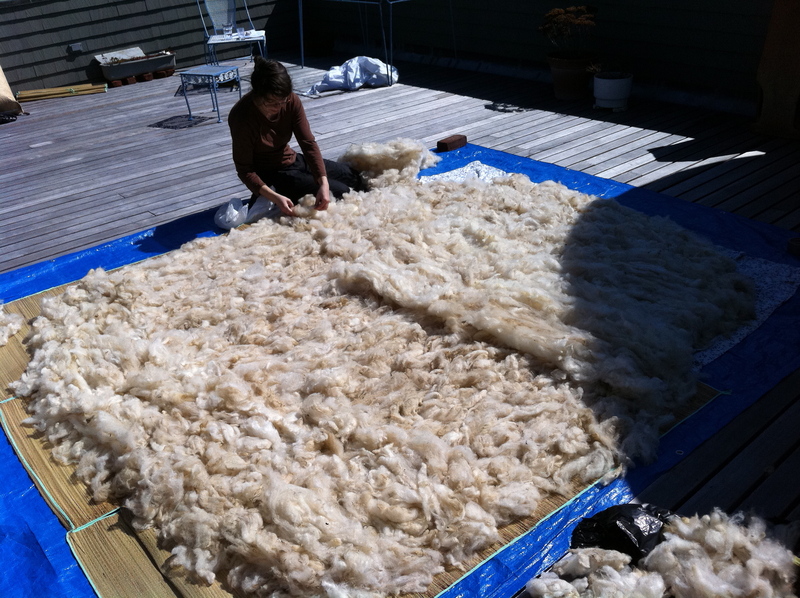 Jedediah proved himself a willing wool laborer, assisting with many steps of the project and offering design ideas. 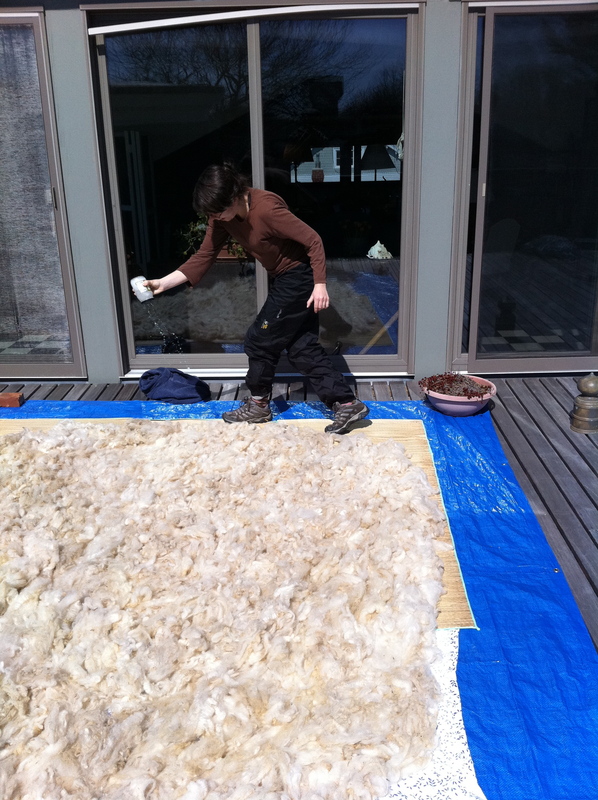 Iline tolerated living with me while I made our house smell like a sheep and covered all available surfaces with wool. 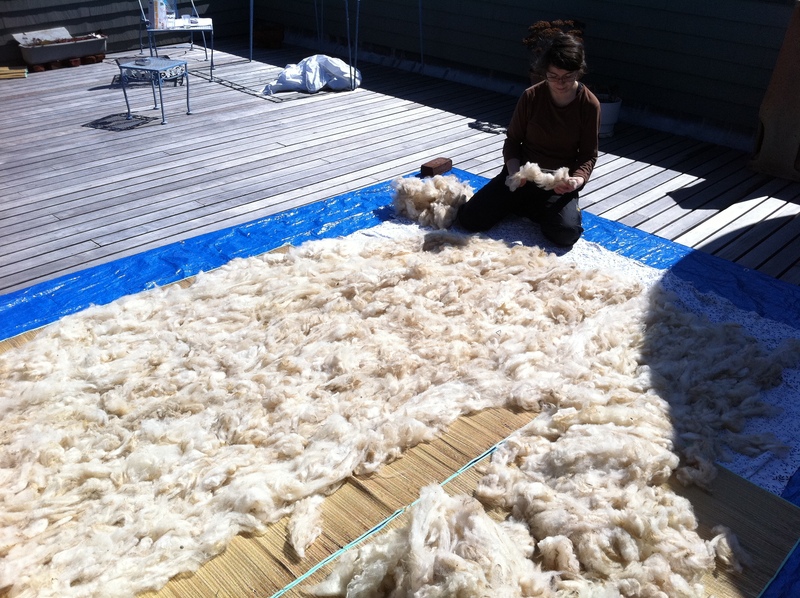 Pam, Karina, and Iris provided desperately needed human contact during the wool preparation process. I’ve been out a few more times since the last entry. Miraculously, despite wind gusts of 50 miles an hour, the structure was just as I left it. No posts had collapsed. 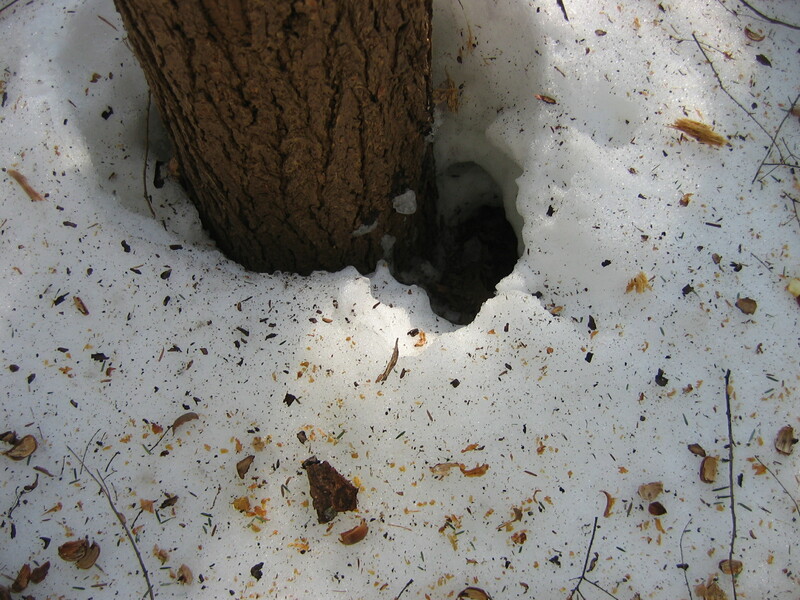 The thaw and freeze had further hardened the crust on the snow, which made for easier movement. 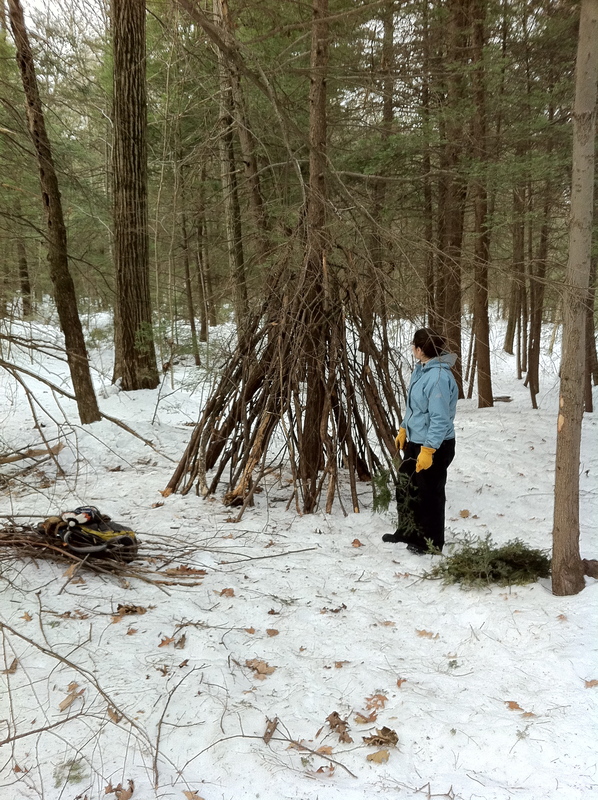 I started out by cutting branches from a fallen pine tree that I found last week, and gathering slightly thinner branches to fill in the gaps in the structure. 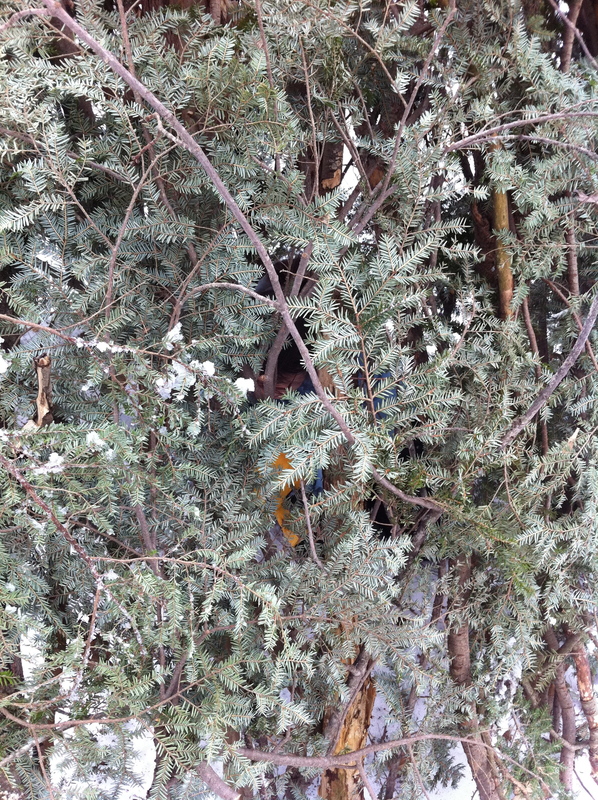 I also began scavenging green pine branches for the outer layer. Many of these had been shaken loose by the high winds. Creating this structure has felt lonelier. Maybe because it is rare that I even hear another human while working. My only consistent company is an ambitious woodpecker, who I hear a lot of. 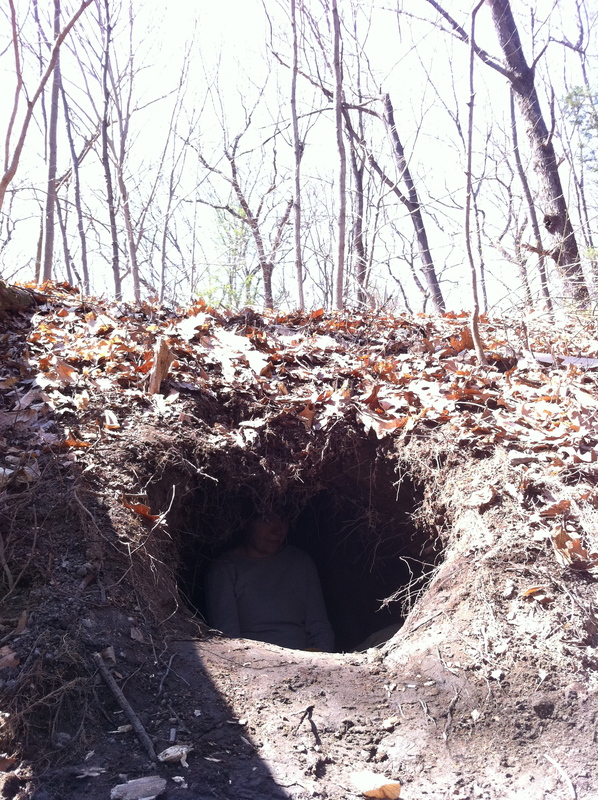 One day I heard lots of voices in the woods, hooting and hollering, and some primitive part of my brain got scared. 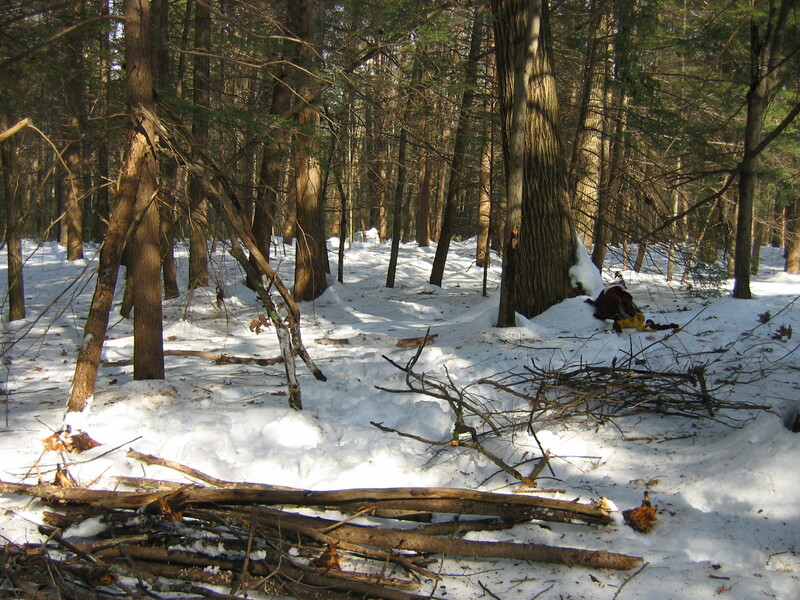 When I headed out of the woods at the end of the day, I saw buckets on the trees– folks from the farm center had brought a class out to start the maple sugaring! 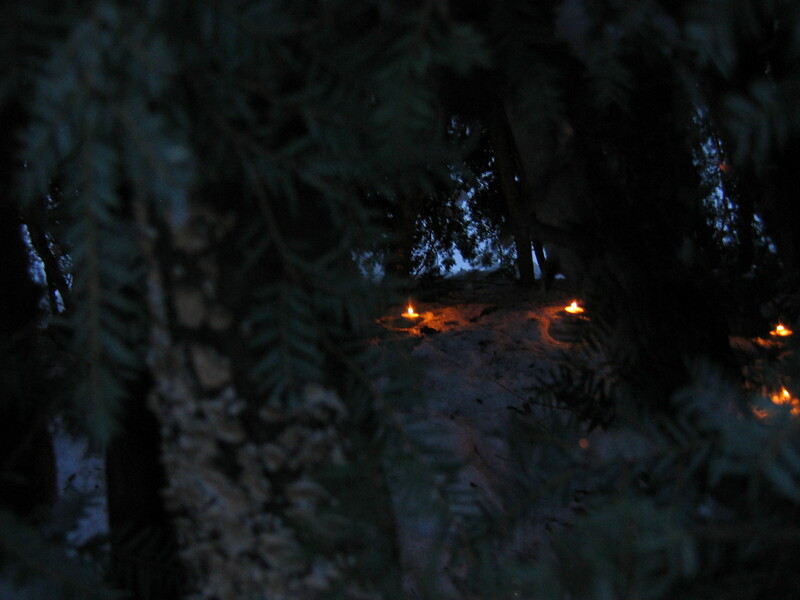 The next step was to add a layer of green pine branches. 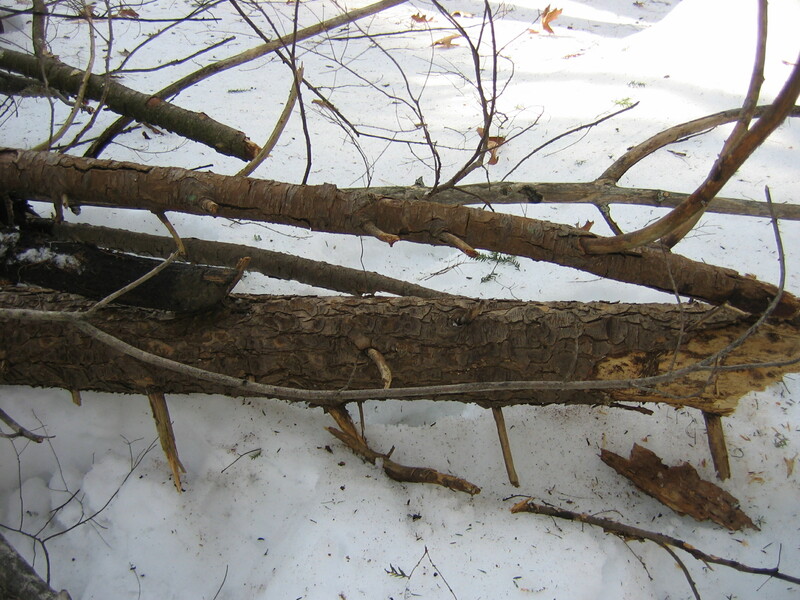 I scavenged these from the ground, where many had been shaken loose by the wind, and also from the lower branches of the hemlocks that were being weighed down by snow and ice. I cut these free, sometimes causing an exciting upwards sweep of the tree. 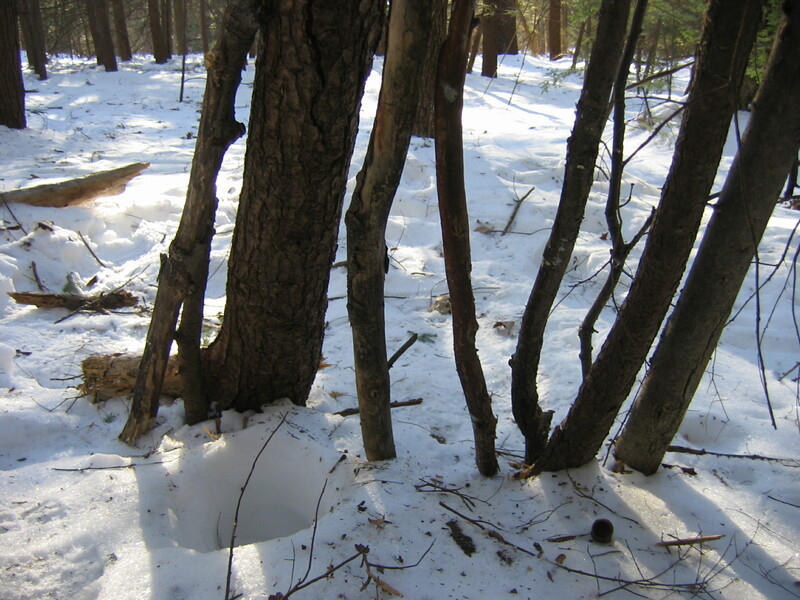 During my search for these trapped lower branches, I realized that many of them were already in use as shelters. 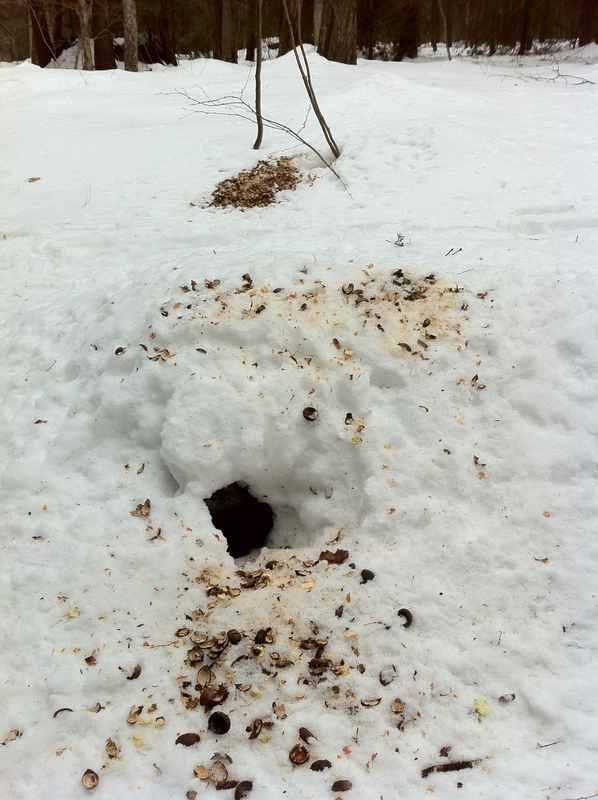 There were holes leading to burrows underneath them, with piles of nutshells tossed out the door. 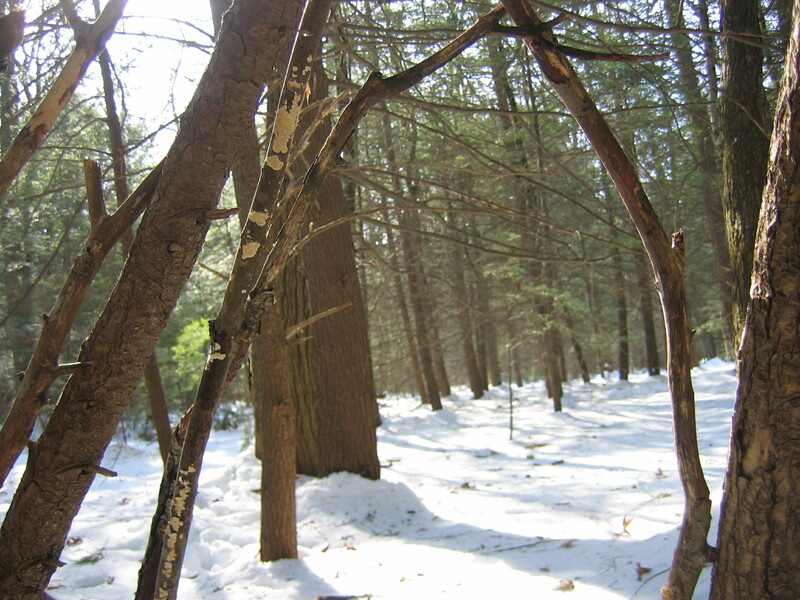 Once I noticed this, I began seeing them everywhere, and once I saw them, I couldn’t disrupt them, so I had to look farther and farther away in order to find branches that weren’t already in use as shelters! Even though this made my job harder it also made me feel ridiculously happy. 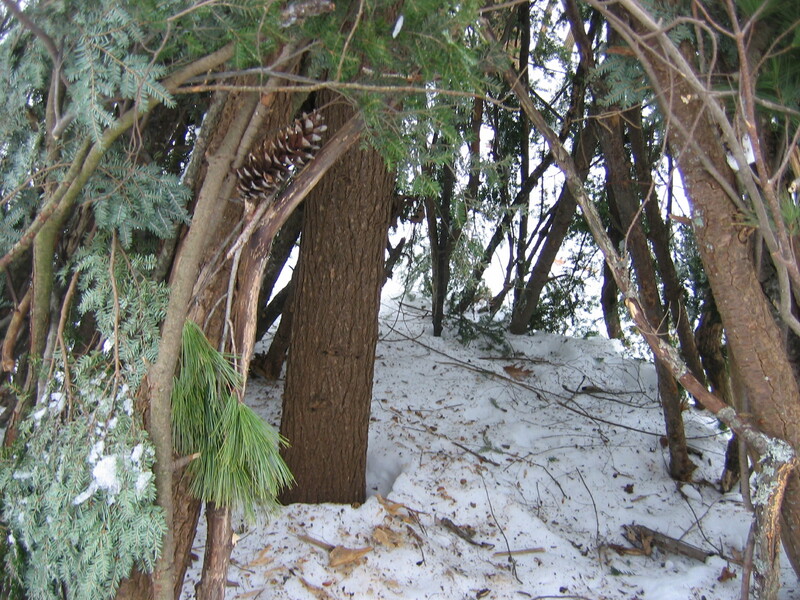 The covered shelter looks like big green pod, hugging the tree that rises out of it. 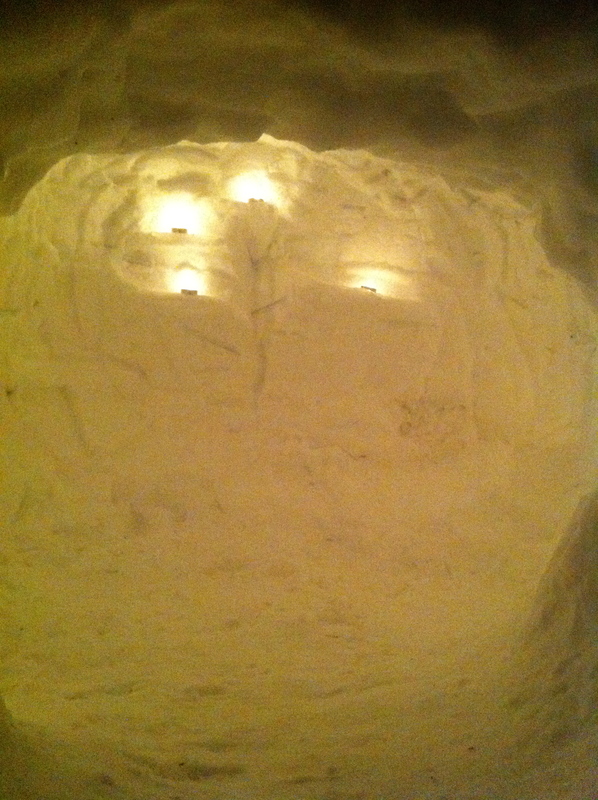 Inside is cozier now that the walls are more solid. 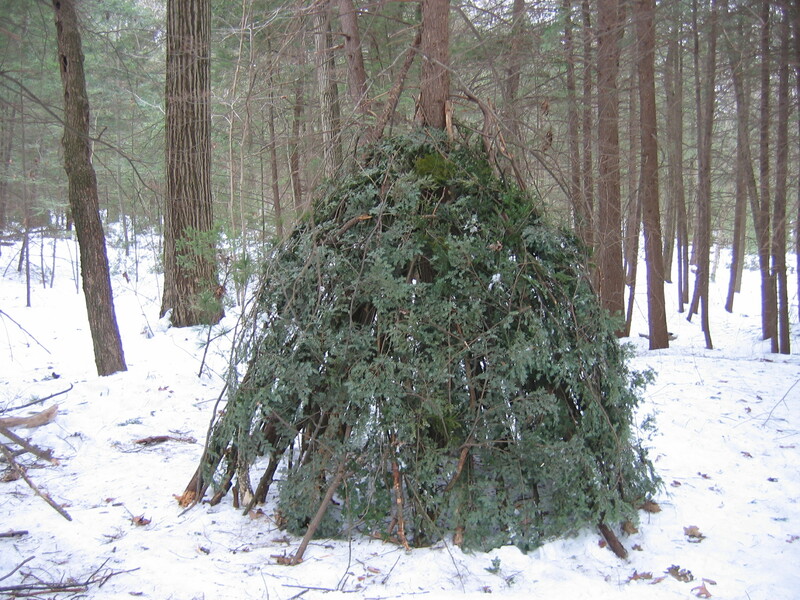 I based this design on some debris shelters I’d seen pictures of, and also on the primitive structure I worked on last summer, modified to make the structure roughly tipi or pine-tree shaped. Throughout this process I have always made an effort to leave before dark. 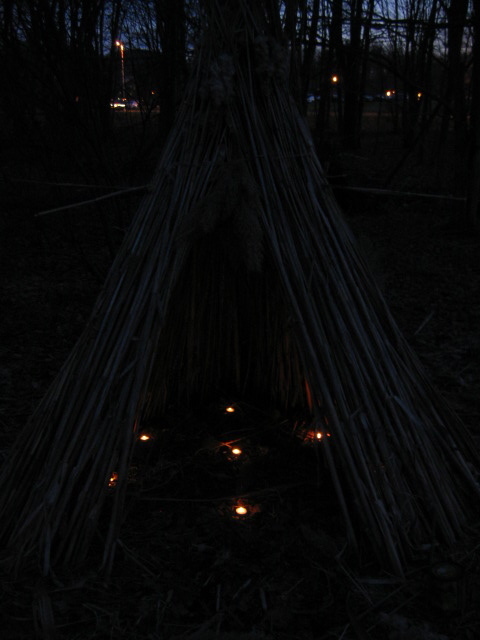 Saturday I did the opposite, so that I could see the structure lit from within. 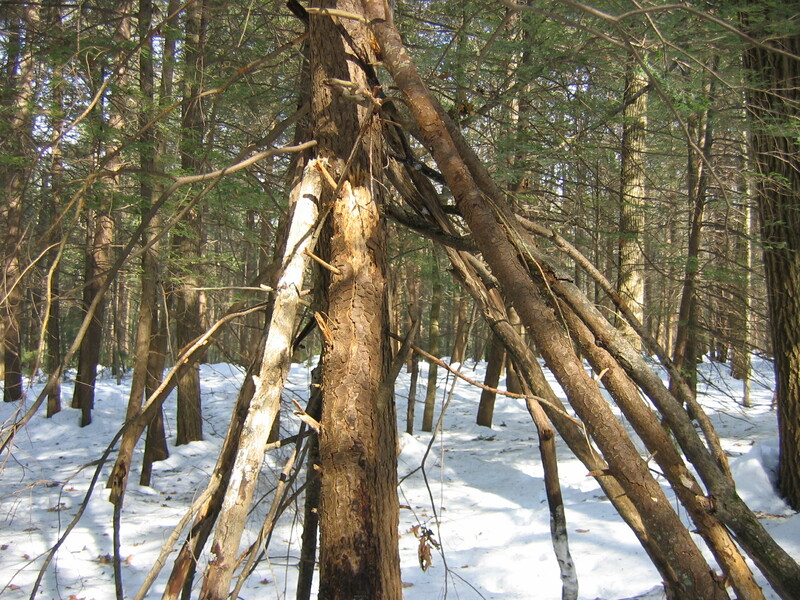 I just discovered a useful book on shelter building: Shelters, Shacks and Shanties and How to Build Them, by D.C. Beard. 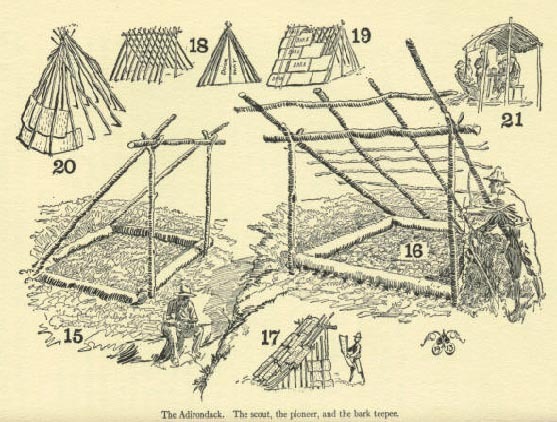 It was first published as a guide for “outdoorsmen and scouts” in 1914, so there may be some backwards language in it, but it also has good clear directions and nice illustrations that tell you how to make many different types of structures of varying complexity. Plus the guy’s name is beard, how could you not want to read it? Today was my first day working with wood. I hiked out into the woods, crossing the stream and stumbling through the snow, trying to walk on the crust but generally busting through. It took me awhile to find a place I wanted to build. 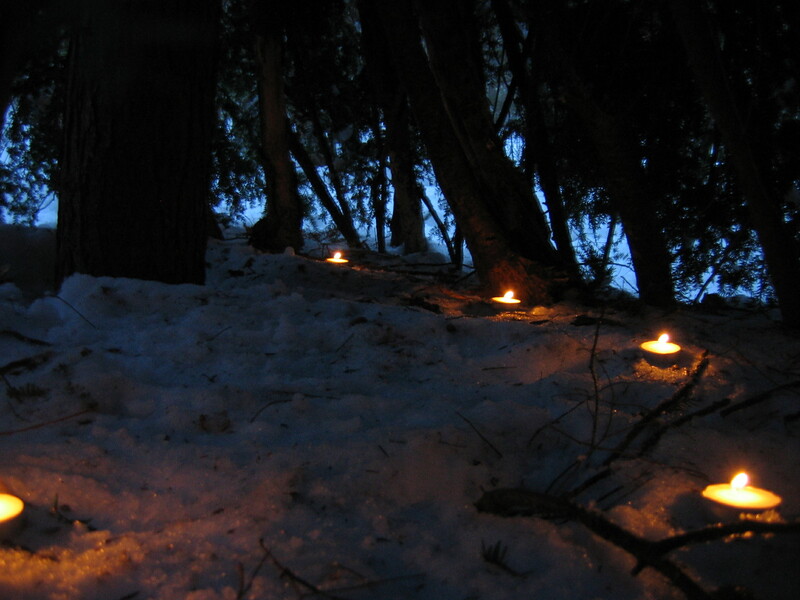 I wanted it to be not too far off the beaten path, but I also wanted it out of direct sight from any paths. I wanted it to blend in enough to not be exciting to drunk college students wandering around in the woods. 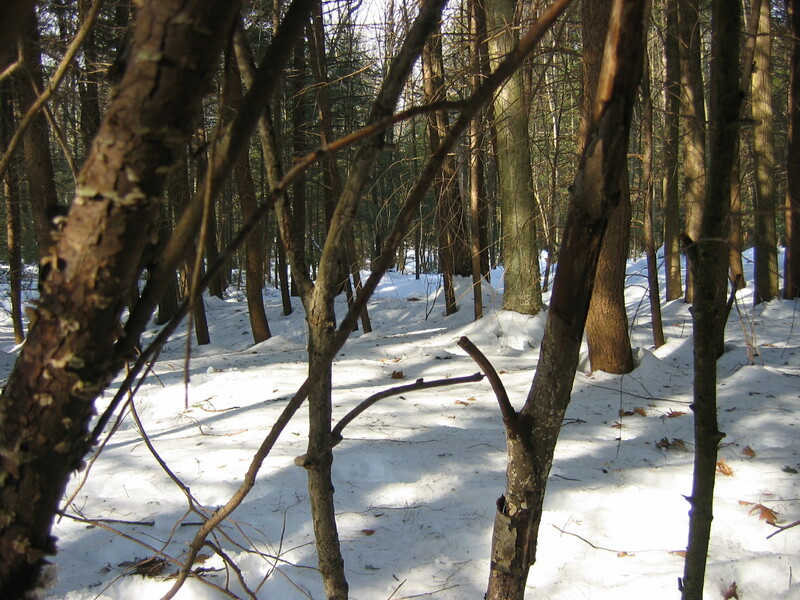 Since there is still about 2 feet of snow on the ground, I really have no way of knowing where the less traveled paths are, so it will be interesting to see how the landscape changes as the snow melts. I found a place I wanted to build, sheltered between four trees. 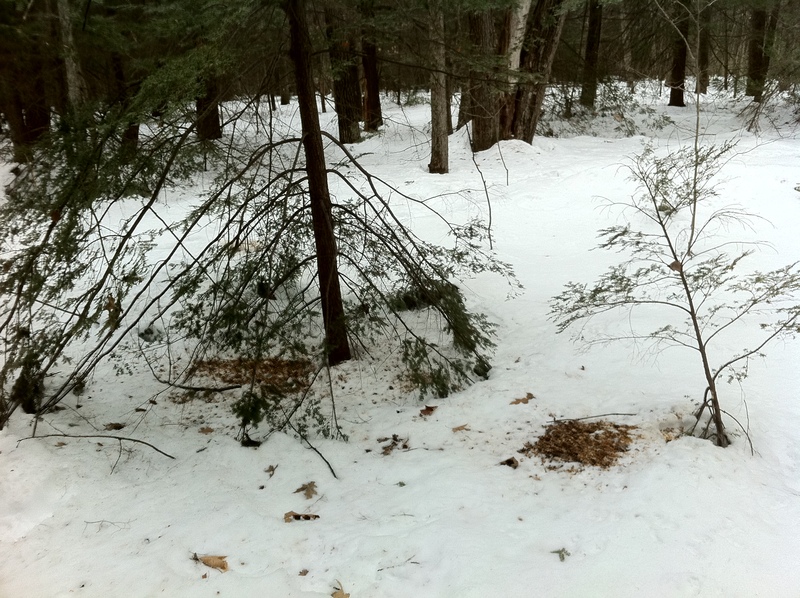 The area is mostly hemlock, creating an evergreen canopy which I intend to use as extra protection for the shelter. For the first couple hours I gathered wood. 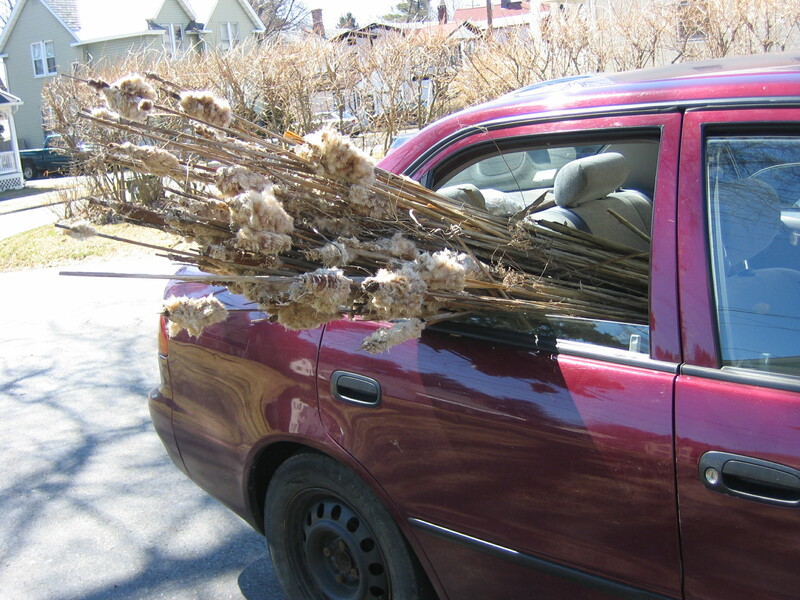 Small sticks, big sticks, and the elusive, much sought-after forked sticks. 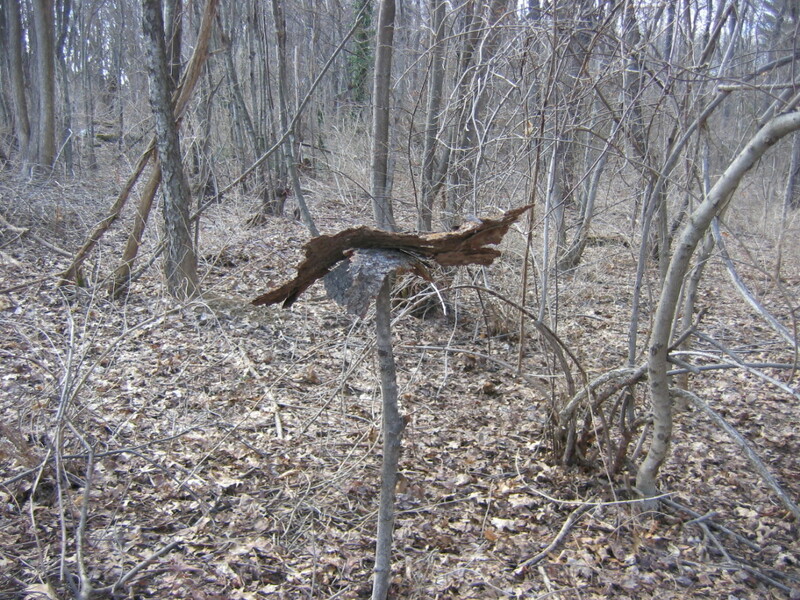 After awhile I discovered several small standing snags, trees that have been killed by disease or rot. While they aren’t the strongest wood, for my purposes they will work fine. I set about using a combination of muscle and leverage to loosen and uproot these snags. The largest was about the maximum size I could lift and carry. The glove is for scale, not because I buried someone. The biggest I could carry. Gathering wood is really exhausting. 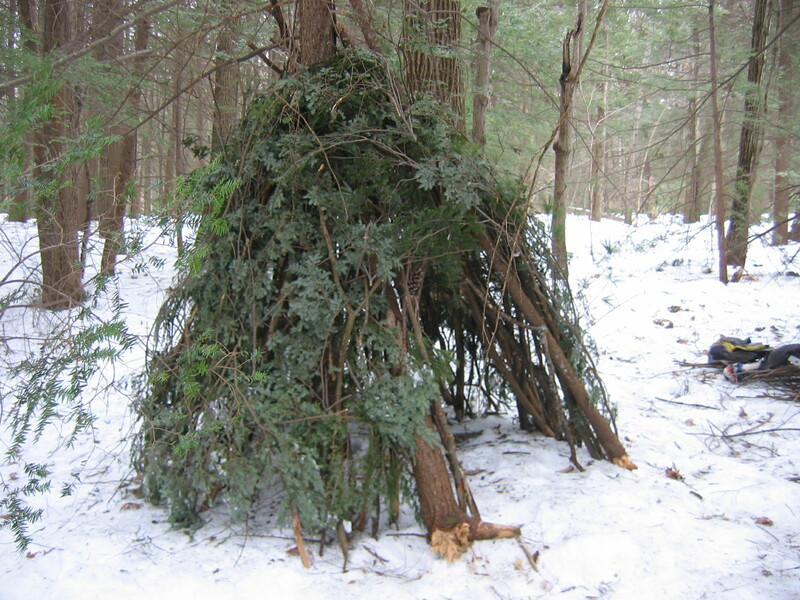 The last time I built a primitive shelter out of wood was last summer, in a course on green building and sustainable design. It seemed to go very fast, partly because the large forked supports had been found ahead of time. Also, there were about 20 of us. Not the case today! 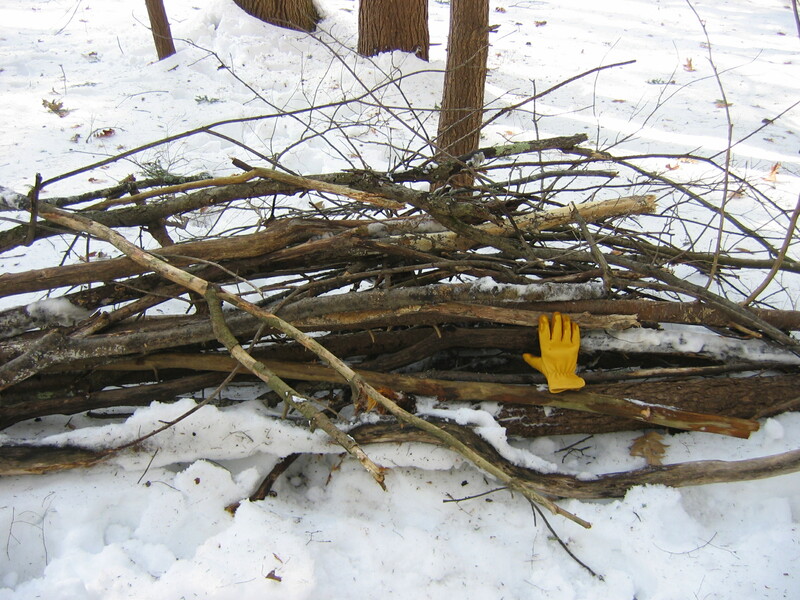 I managed to gather a pretty big pile, but as a result my limbs are leaden. Once I felt I had a big enough wood supply, I began to frame out the structure. 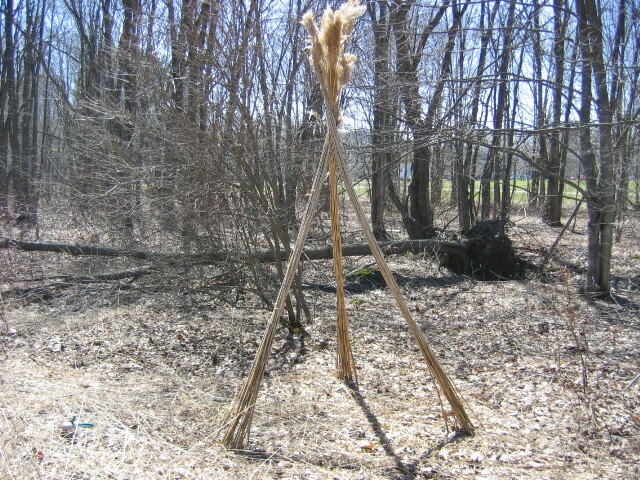 After some thinking I decided to use an existing tree as a support, creating a sort of teepee shape around it. 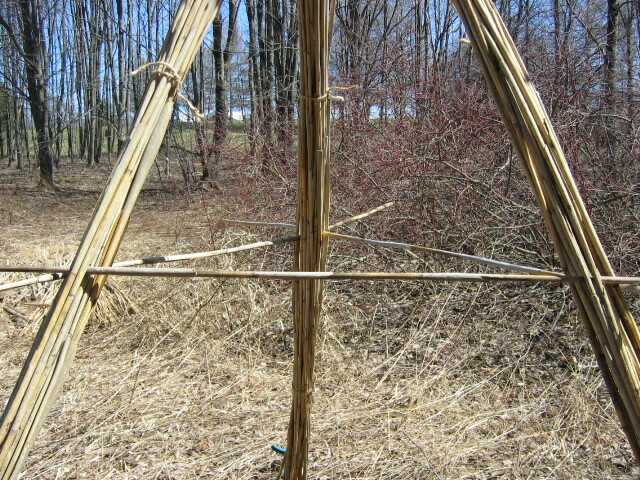 Leaning four forked sticks against the tree, one in each direction, created the general shape. 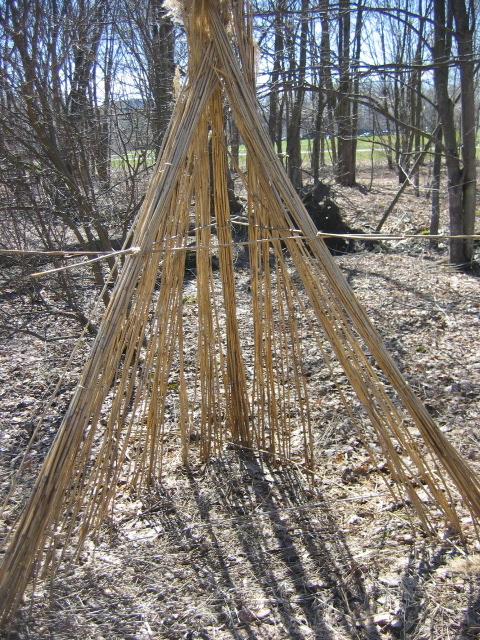 I then filled in the gaps, leaning larger and then progressively smaller sticks in the spaces, trying to rest them on each other in such a way as to give the structure strength and stability. 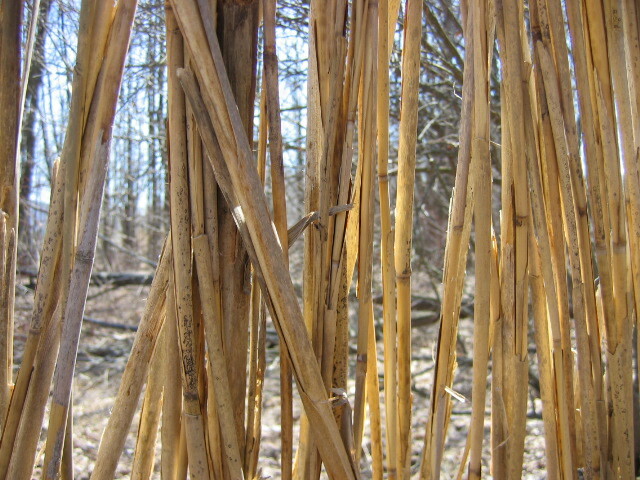 I also found some interesting shaped sticks with which to outline a door frame. 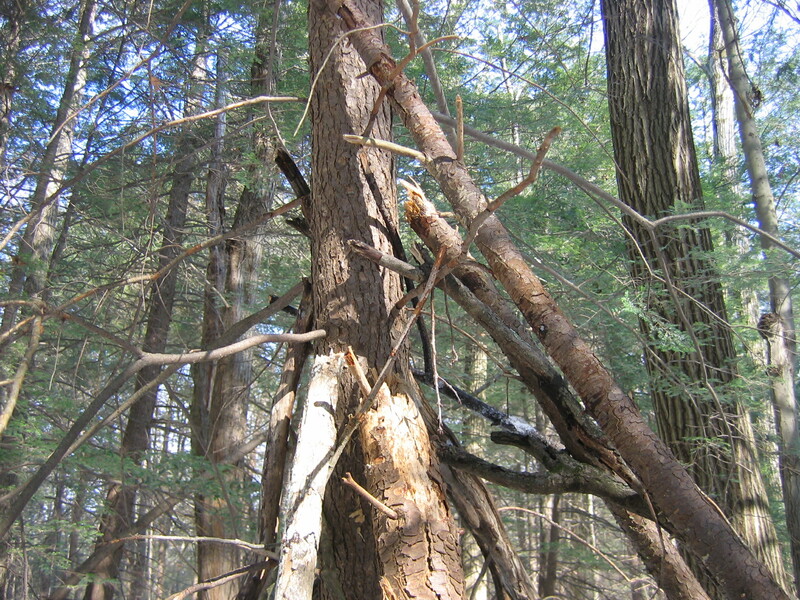 This squirrel is going to have the most fortified shelter in the woods. This whole process really took me back to natural history class, where we studied trees and forest disturbance. Reading the Forested Landscape, by Tom Wessels, is a fabulous book about forest disturbance and succession, and it has beautiful woodcuts, too. I was struck by the differences in the wood I gathered. 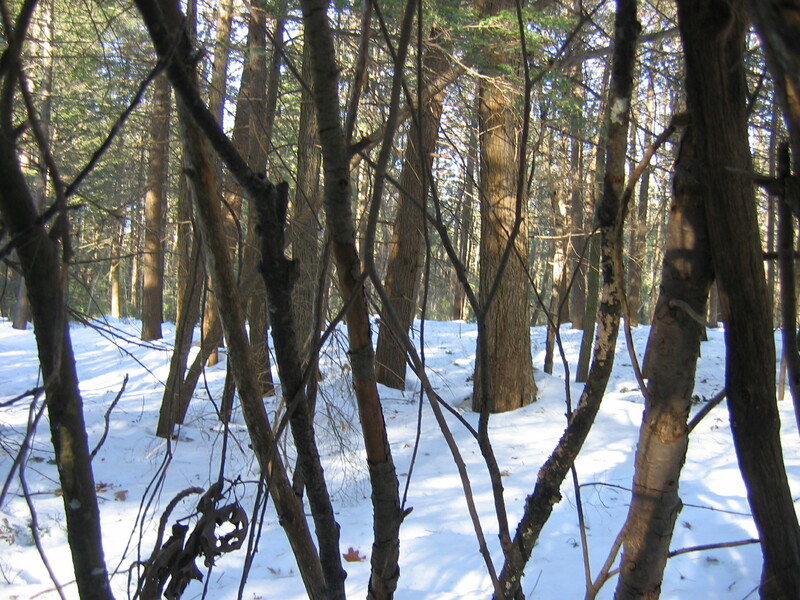 While the area is mainly conifers (also called evergreens or softwoods), there were still hardwoods (deciduous trees, the kind that lose leaves in the winter) to be found as well. 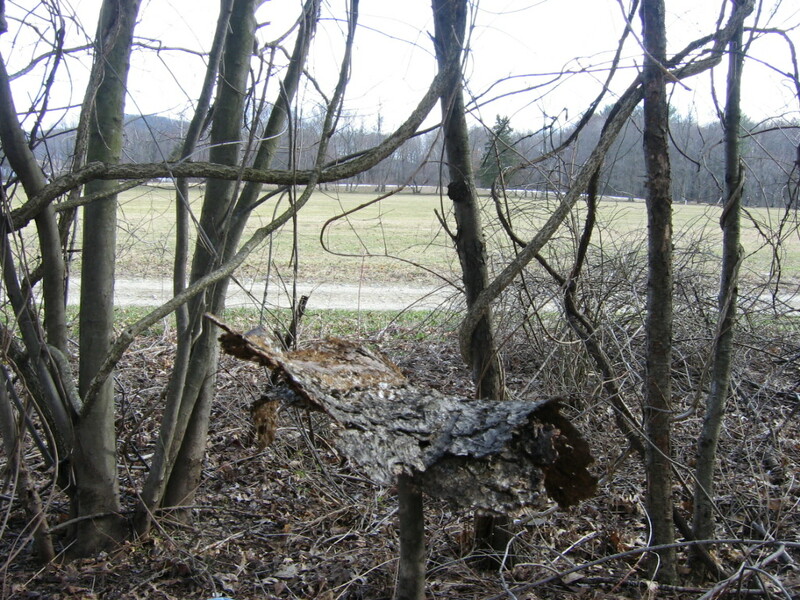 The softwoods were, well, much softer, and clearly were rotting from the inside out. 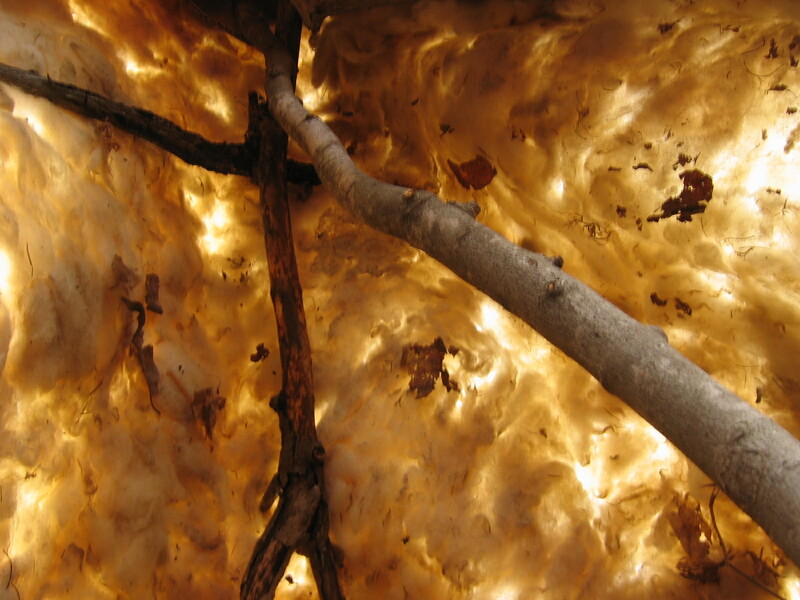 Hardwoods do the opposite, rotting from the outside in towards the core. 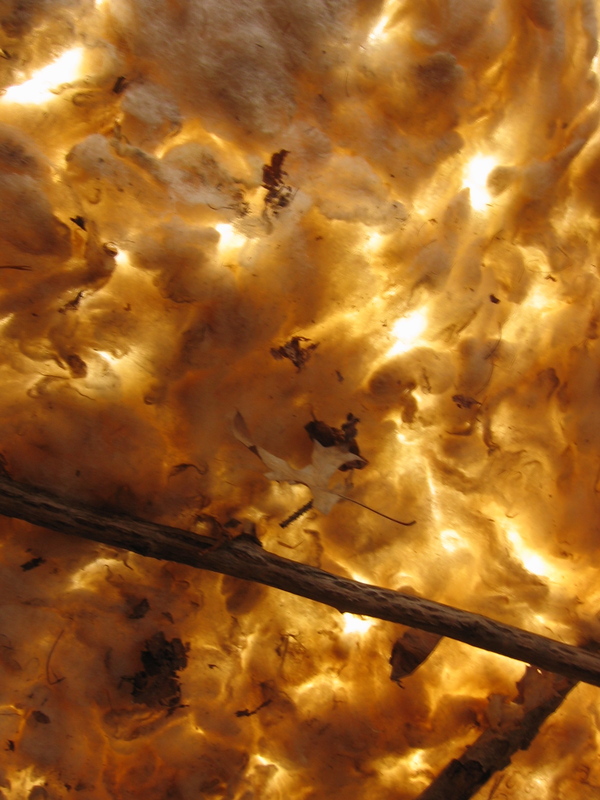 This makes the wood a lot stronger, even when it has been lying on the forest floor for awhile. I tried to place the hardwood I found in extra important places. I also don’t know how the melt will effect the structure itself, since the whole structure will sink! 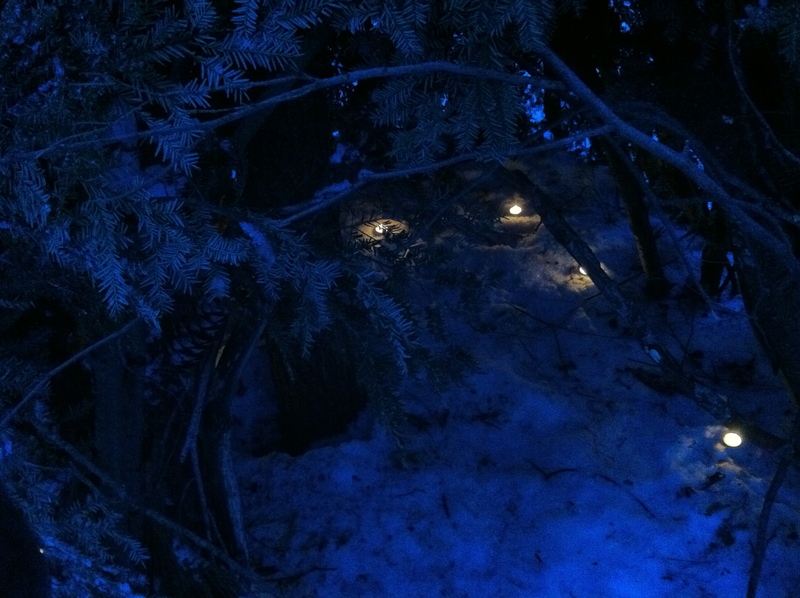 Right now the snow on the site is so packed that I’ve used it to help secure the bases of the branches. 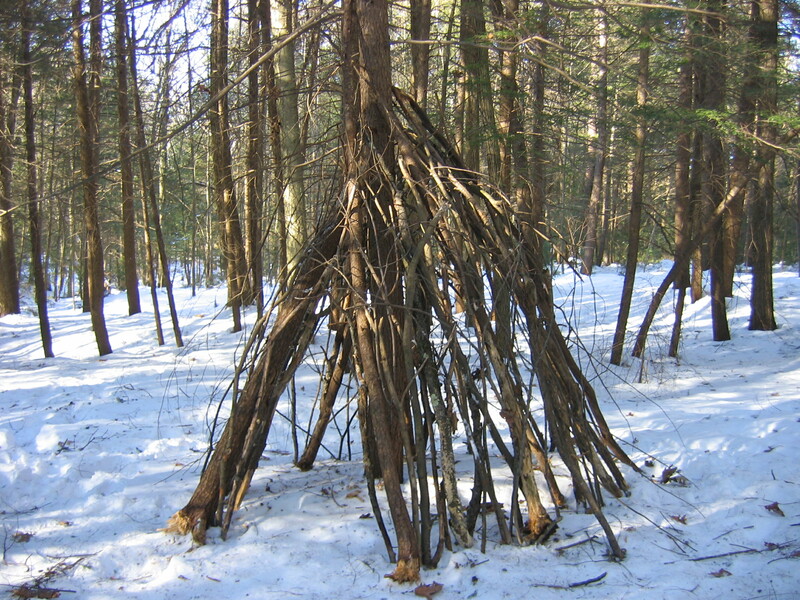 Did the structure survive the high winds of last week? Only time will tell! Or rather, only I will tell, when I catch up and write the next entry. Again, the glove for scale. Inside, looking out through the door. 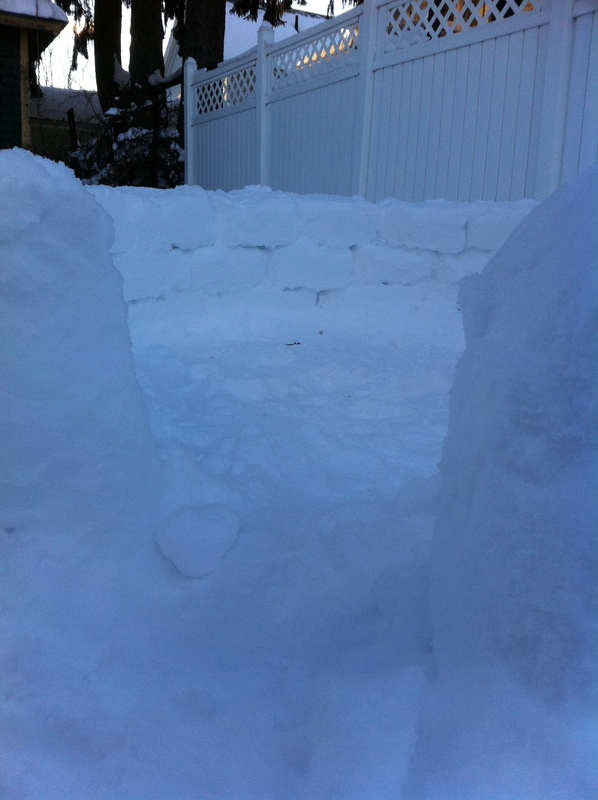 After I determined that building an igloo with blocks was not realistic, I decided to try the hollowing-out-a-snow-mound method. 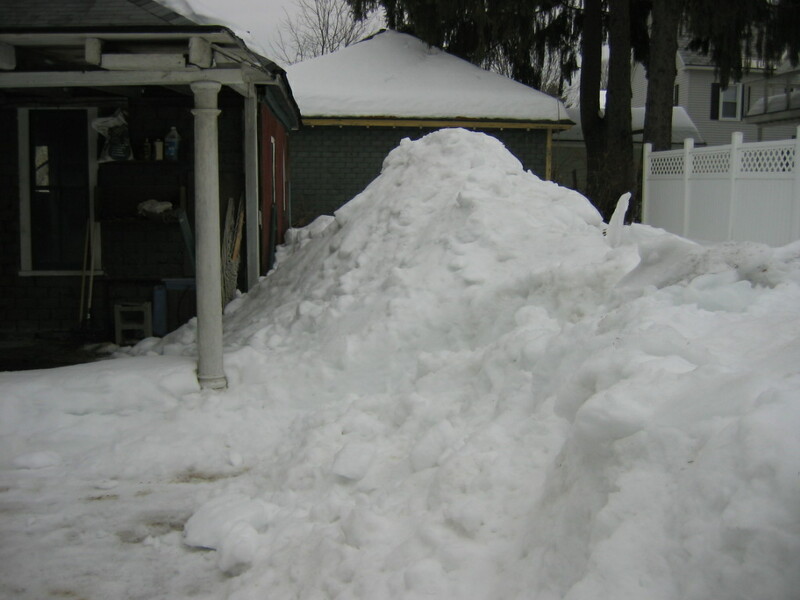 Fortunately, after all this snow and ice, our backyard consists primarily of snow mounds, so the mounding and packing was already done. I came up with a method right away. 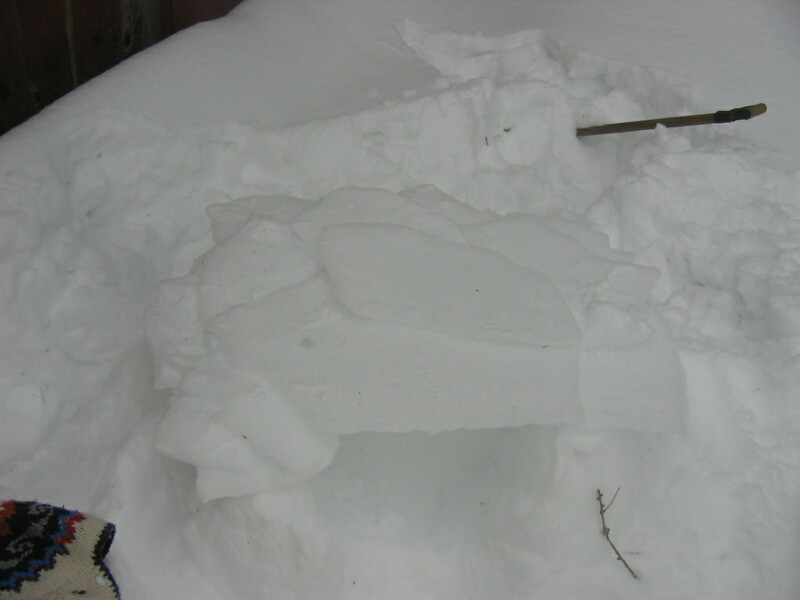 Using a large kitchen knife, I would make crosshatched cuts in the snow I wanted to dig out. 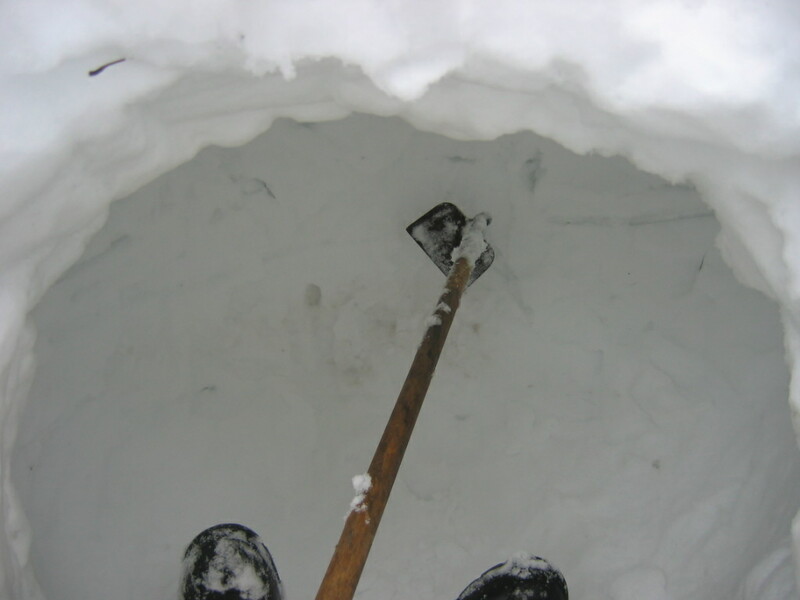 Then I used a garden hoe to dig out the loosened snow and ice. 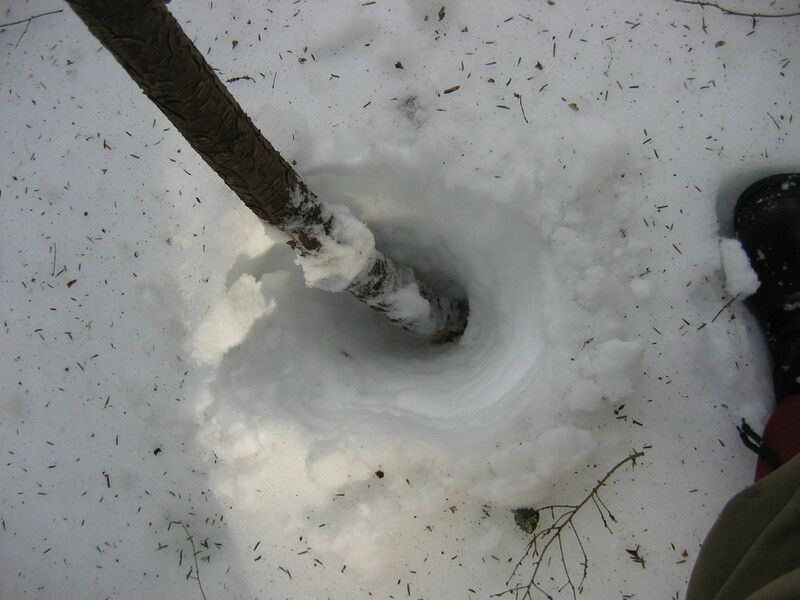 When it got deep enough, I slid my legs into the hole for leverage. 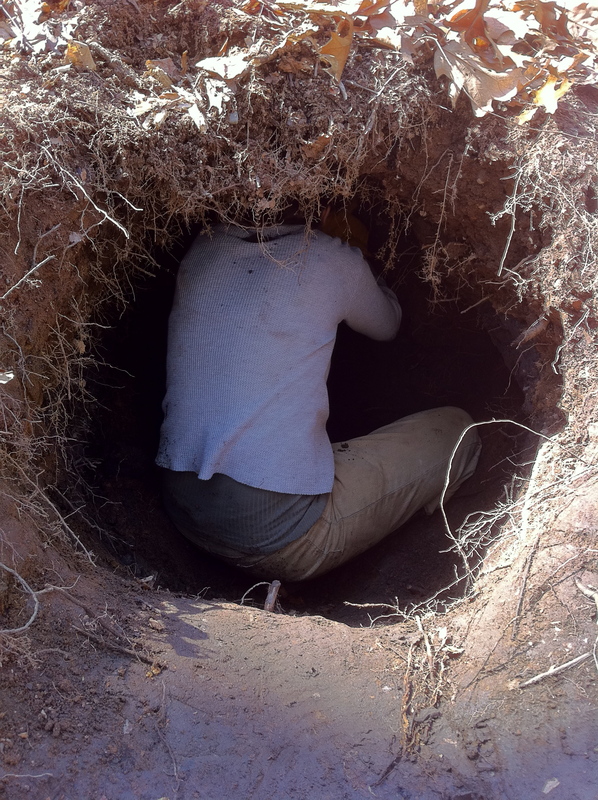 By the end of the first day I could fit all the way into the hole, and it was just wide enough for me to sit sideways, legs outstretched. 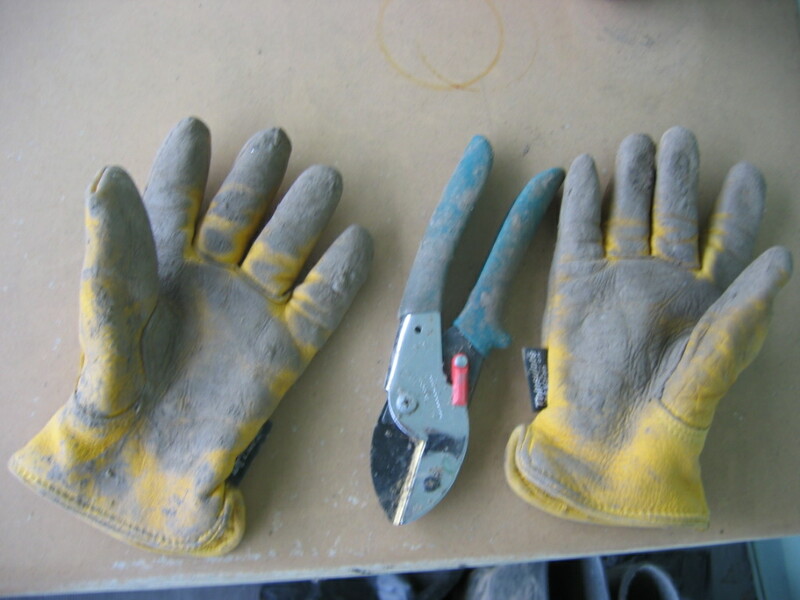 Once I got inside, I took the head off the handle of the hoe, so that I could chop and scrape in close quarters. 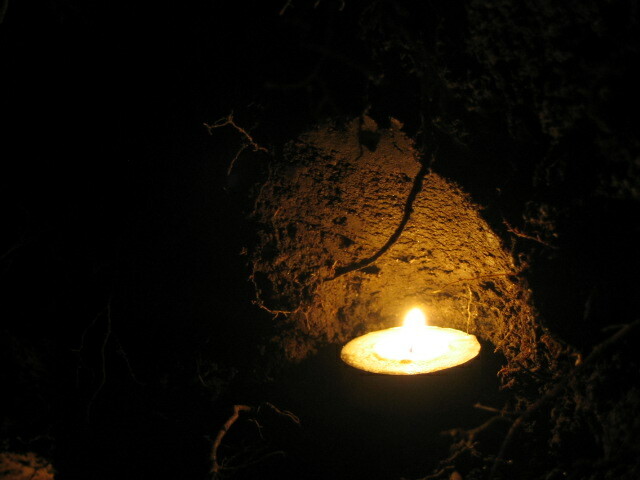 Today I continued work, widening and deepening the space. I also worked on raising the ceiling, so that people taller than me could sit up comfortably as well. I gave myself at least one good crack in the head on a piece of ice that was jutting out. 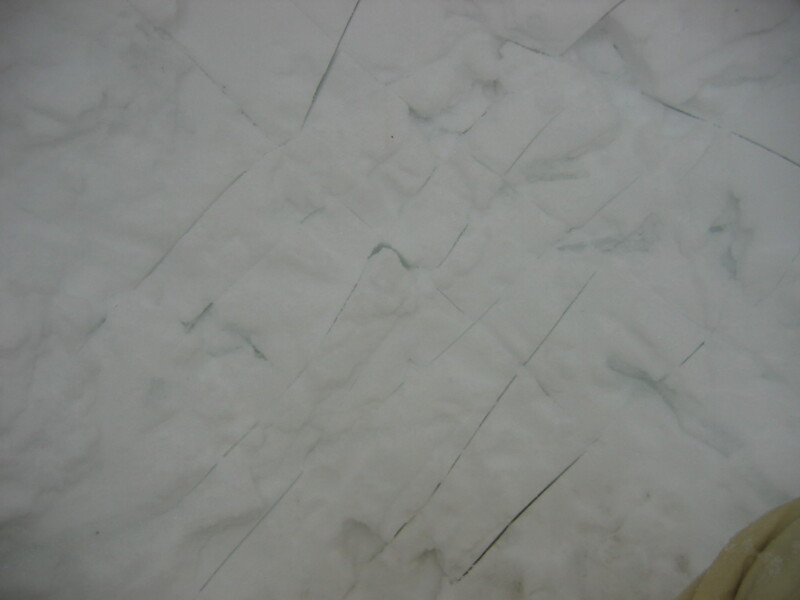 These pieces of ice are probably the broken remains of the ice sheet I mentioned in the last post. Rather than simply clearing them all away, I decided to try using a few of the chunks of ice as shelves. You’ll see what I plan to do with those! The space is a good size now. I can easily sit up straight in the middle or up against one wall or the other, and when I sit in the middle I can stretch out both arms and lay a palm against either wall. Two people can fit inside, but it is tight. The whole process has felt very meditative. Perhaps not in the usual sense, since I don’t often meditate while squirming in and out of a small hole dragging boxes of snow, or meditate while showering myself in the face and on the head with snow and ice chunks. Meditative in the sense of a working meditation, which I sometimes think is my favorite kind. Simply being present with ice and snow and the weight of those, the immense quiet of being surrounded and muffled by snow. When I’ve been working on the structure, I have found it hard to stop and go in for the day, even as the sun sinks low. There is always a little more I want to do. Today I packed a perimeter path in the snow, so that one won’t sink up to their thighs if they try to walk around the shelter. I have decided to leave the exterior otherwise unchanged, because I want it to match the environment. Not to camouflage, but to match. 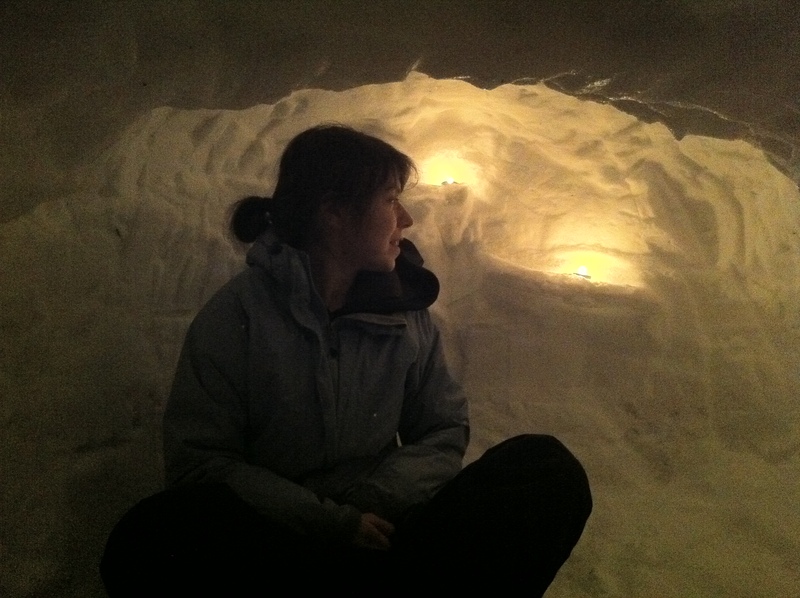 What is it like to be in a snow shelter? 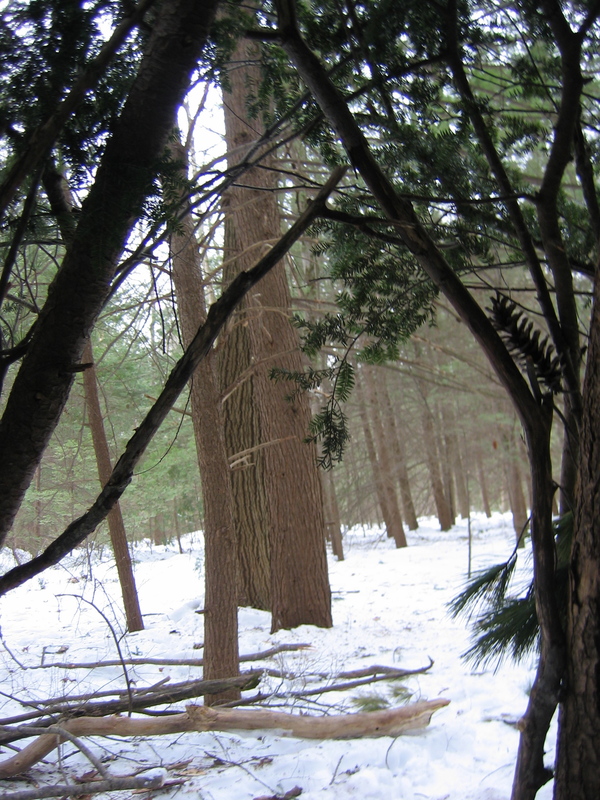 Most of us in the Northeast learned that when we were small, but it is easy to forget. 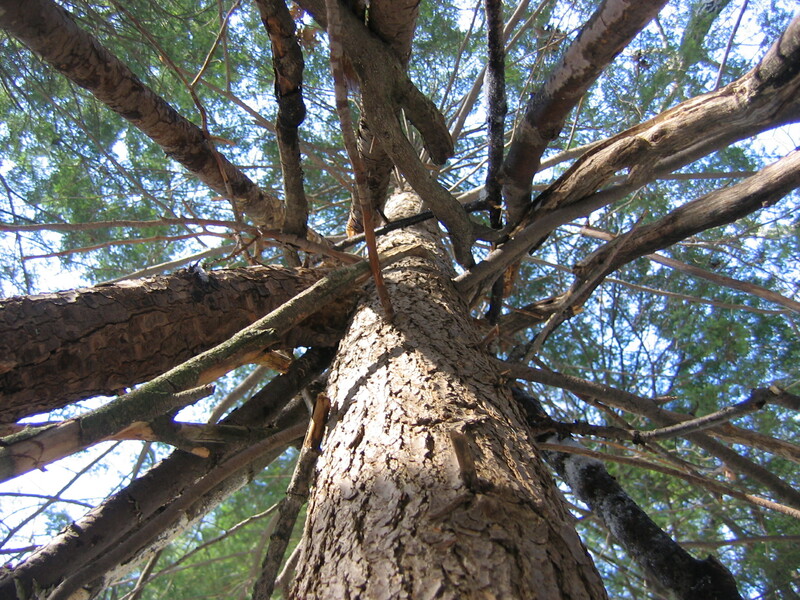 The top of the structure has caught pine needles, small branches, tiny bunches of seed pods you don’t recognize. When you slide in through the small entrance you know these rest over your head. The walls are thick and muffle the outside world. It is a specific kind of quiet, and you find that it blots out road sounds but less so the sounds in the sky. 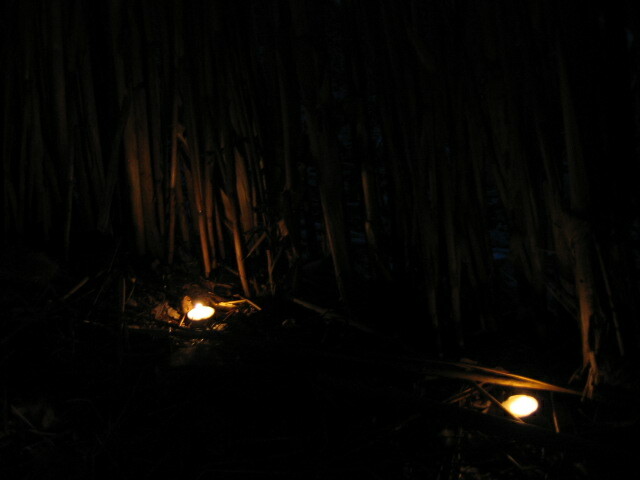 An airplane overhead, crows in the trees across the street, these find their way to your ears only slightly muffled. 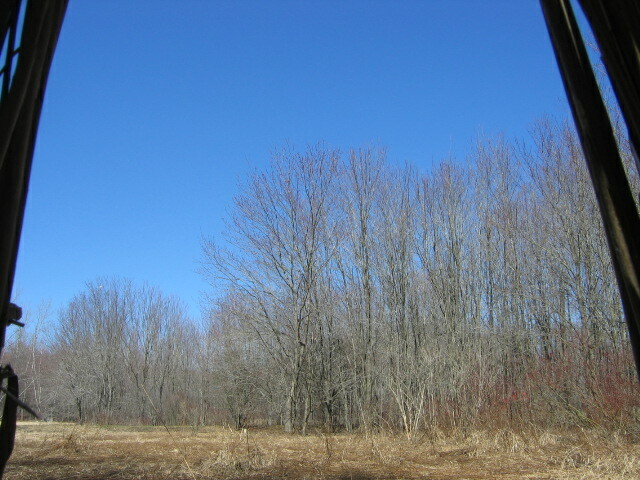 The wind in the evergreens, however, is amplified. 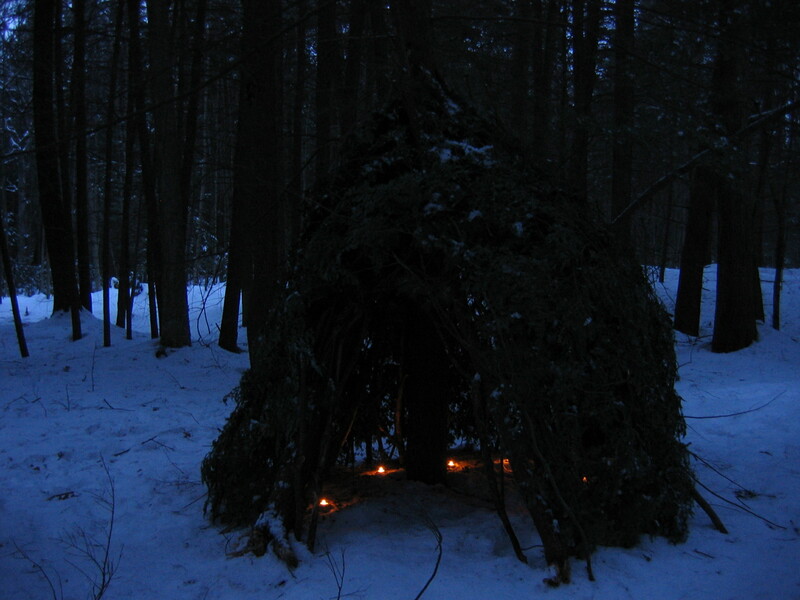 You can hear every gust, you can even tell the direction of the gusts, where the trees are, even though all you can see through the doorway is snow. 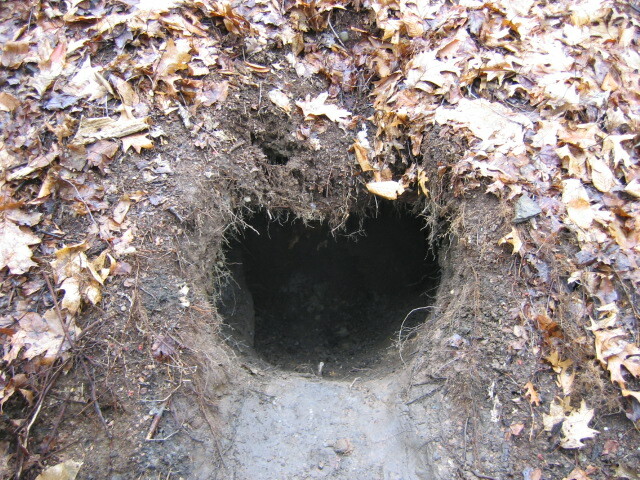 That hole acts somehow like an owls ear, the way sound funnels in indicating the direction it came from. Like us, owls have an ear on either side of their head. Unlike us, their ears are not placed symmetrically. One ear is higher, one is lower. This allows them to place what they hear in vertical dimensions as well as horizontal. This is why they are so skilled at hunting. 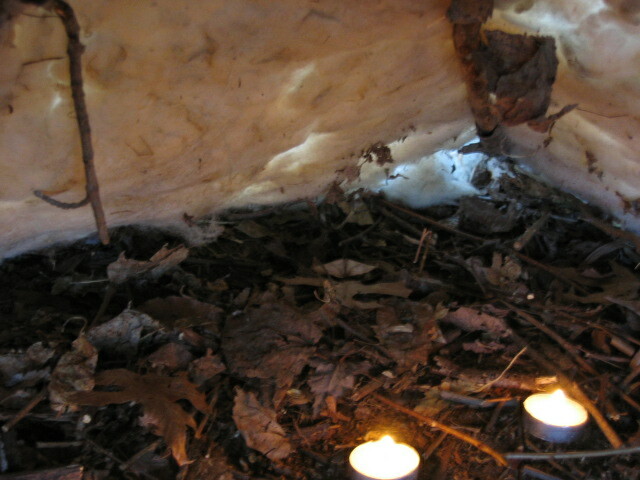 A tiny feather has blown into the shelter, gray and downy. There are pine needles and ice chunks embedded in the roof and walls, and the scratches left from carving out the space remind me of cave paintings. The hush inside calms me, almost without my realizing it. 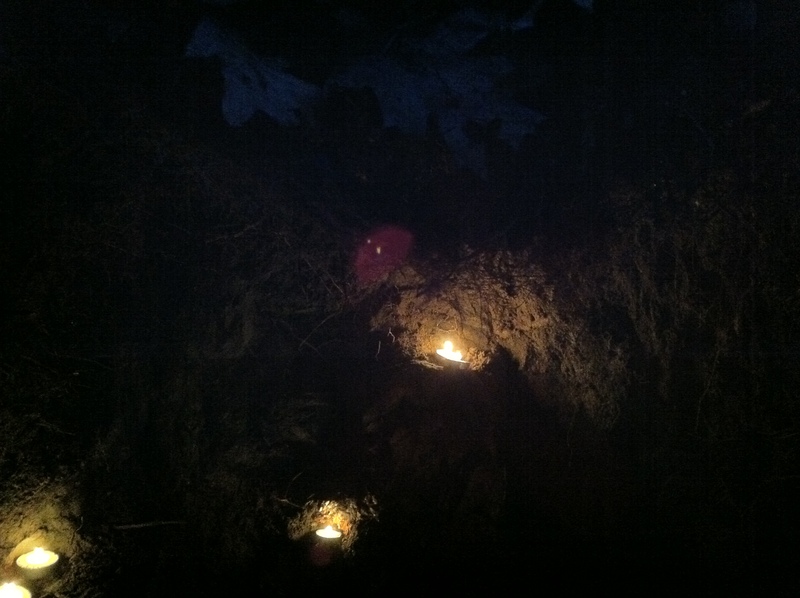 I get this feeling that I usually only get when sitting zazen after a long absence from meditation, or when I’m in the woods or on a mountain for the first time in awhile. It is an expansive feeling, a grateful feeling. When I get it this image fills my mind, that I didn’t notice I was parched, but here I am, on the shore of an enormous lake, face dipped into the water, drinking and drinking and drinking. I had originally scheduled snow houses for February, but when we got a huge amount of snow in January I figured I’d better strike while the iron was hot. 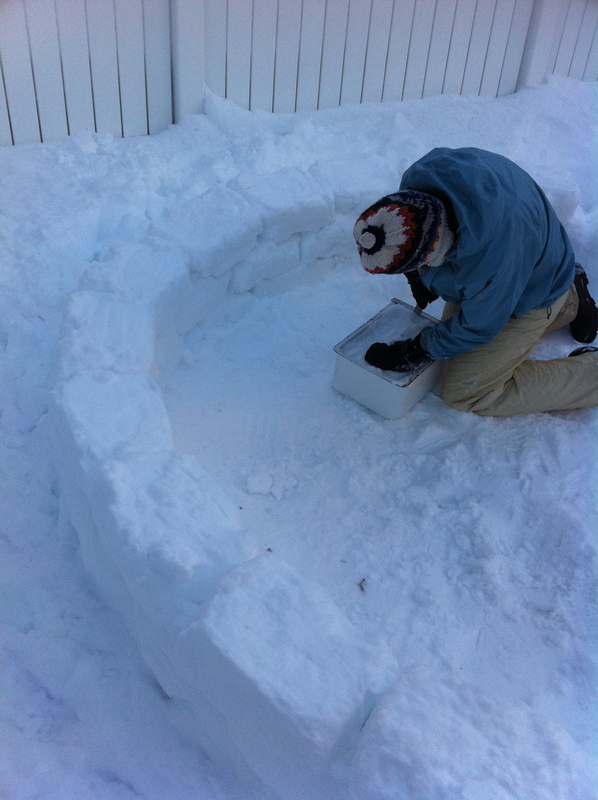 Right after the first big snow, I went out to start an igloo. Originally I envisioned cutting blocks of snow, but since the snow was dry and light, rather than wet and heavy, this wasn’t possible. A mold seemed like a much better idea, so I used a plastic cheese drawer I found lying around. 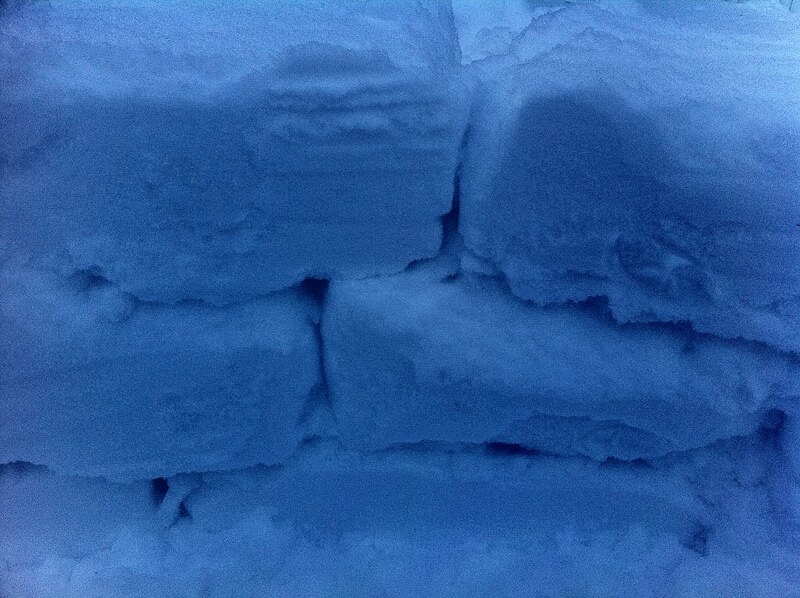 By packing snow tightly into it, I found I could form bricks. The bricks, however, were shorter than I would have liked, and having only one mold made for slow going, so I switched molds. At my old house there was a barn full of treasure, by which I mean abandoned junk, and in it I had discovered the metal fruit and vegetable drawers of an old-fashioned refrigerator. 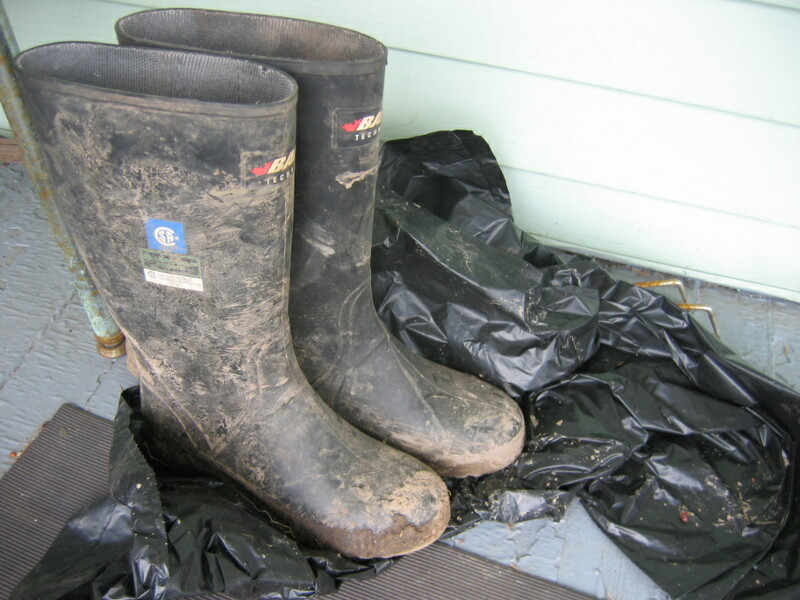 I came inside, hastily emptied these, and brought them outside with me. They did make larger blocks, but because the mold was deeper, I found that I had to cut around the edges of the blocks with a knife before they would come out, rather like loosening a cake from a cake pan. I also found that if I let the full molds sit in the sun for a few minutes, the bricks held together better. 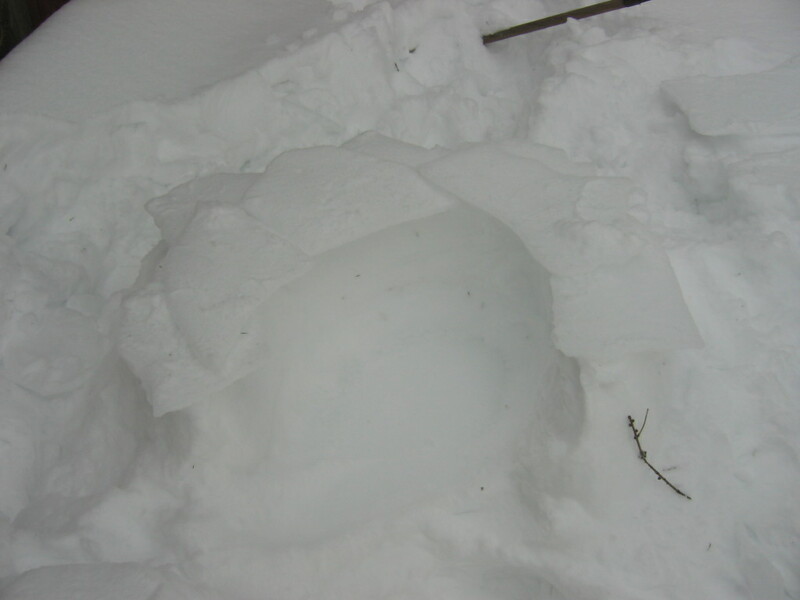 I made the igloo just big enough to lie down in. 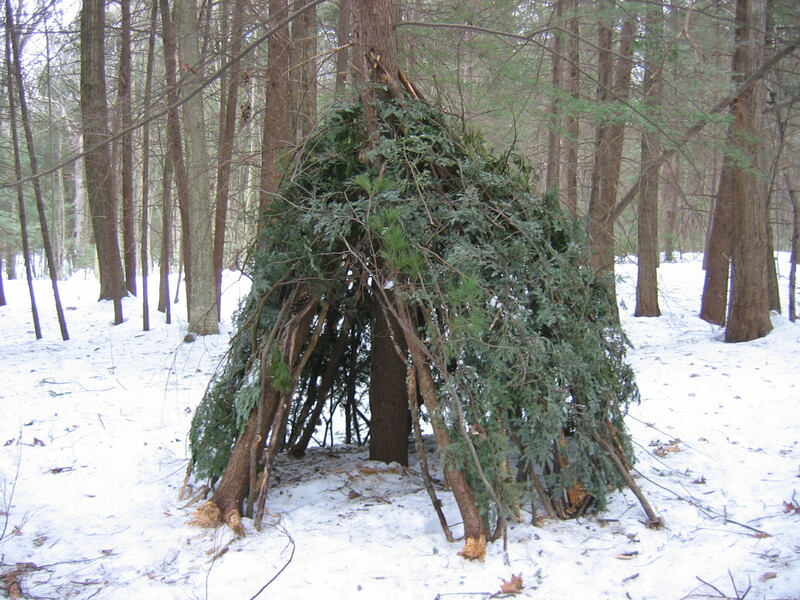 I based my methods on a few different igloo recipes I found on the internet. The brick making and brick placing process gave me a lot of time to reflect critically on what I was doing. I’ve heard that Inuit peoples have hundreds of words for snow, describing different characteristics: wet heavy snow, dry crumbly snow, light drifting snow. These are the categories I imagine. 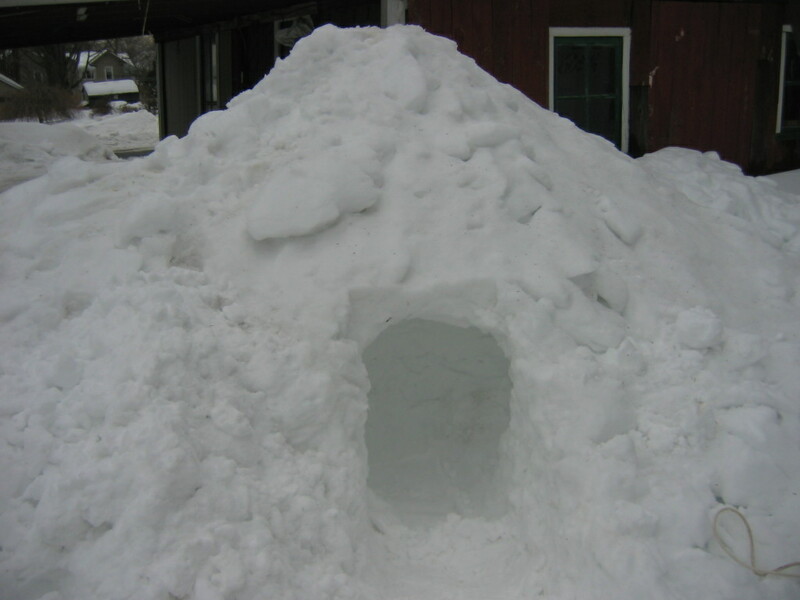 It occurred to me that people who live in very snowy places would probably wait to build an igloo until a good igloo snow was falling. I thought about this as I pounded the powdery snow into the mold, only to have it fall apart when I removed it a few minutes later. 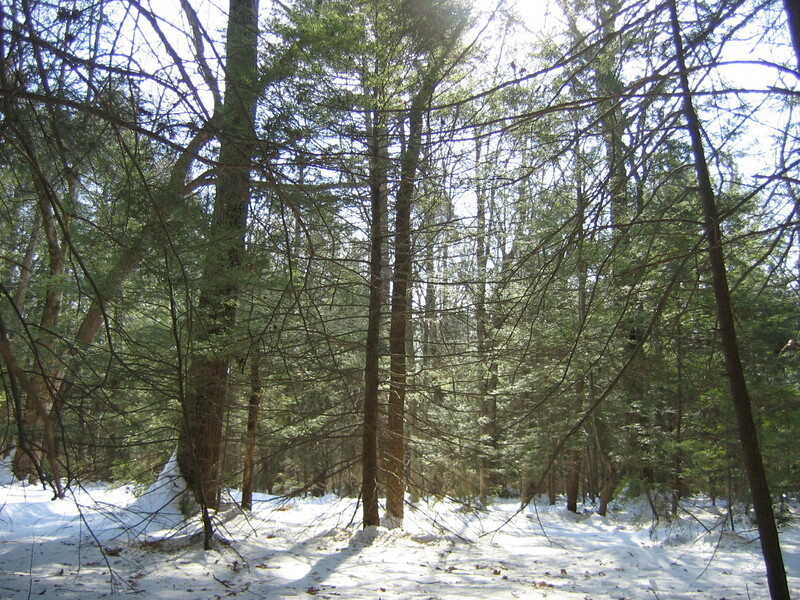 Unfortunately, the Northeast is no longer a place where big snowstorms can be counted on. 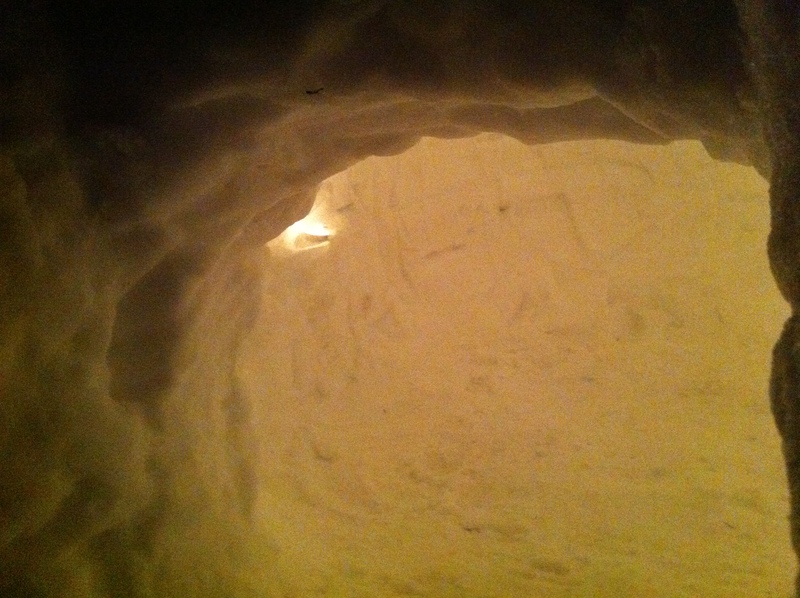 When we got the big one that inspired me to start the igloo, I realized that this might be one of the few big snows of the year. Down here I didn’t have the luxury of waiting for good packing snow, so I figured I might as well get started. Make a circle of bricks with a small opening on one side. Slant each brick slightly inwards, so that the structure will gradually move inwards. Also, spiraling the rows, rather than setting circle on top of circle, is helpful. When you get a few levels up, place a large brick as the frame over the open space you left. This will later be the door. You will need help holding the bricks on from the inside, as you get to the steeper part of the curve. 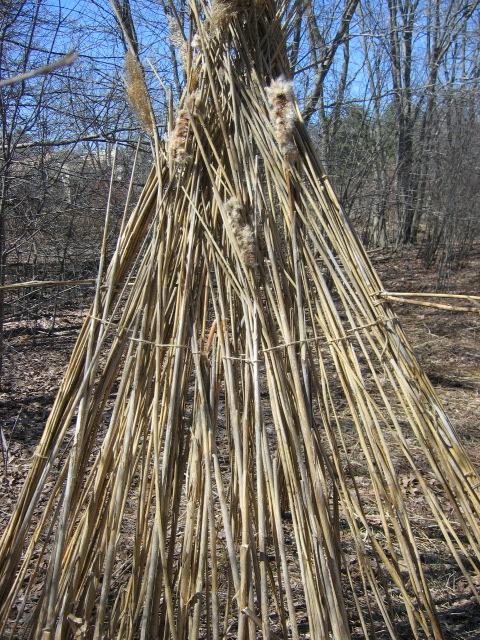 Complete the curved top, a chimney can be cut later. Consensus seems to be that holes should be cut after the dome is complete, because the curve provides the strength and integrity of the structure. Build a tunnel that leads up to the door. 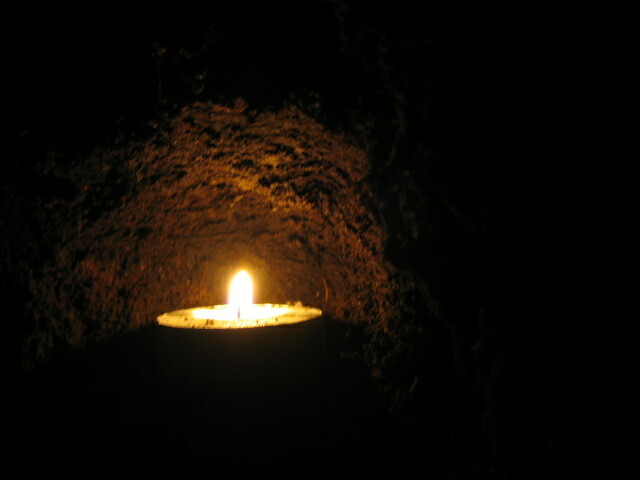 Starting low, creating a rise in the tunnel, then having it dip back down again, will block wind. When you get to the door, widen the hole if it needs it. Fill in gaps between bricks. 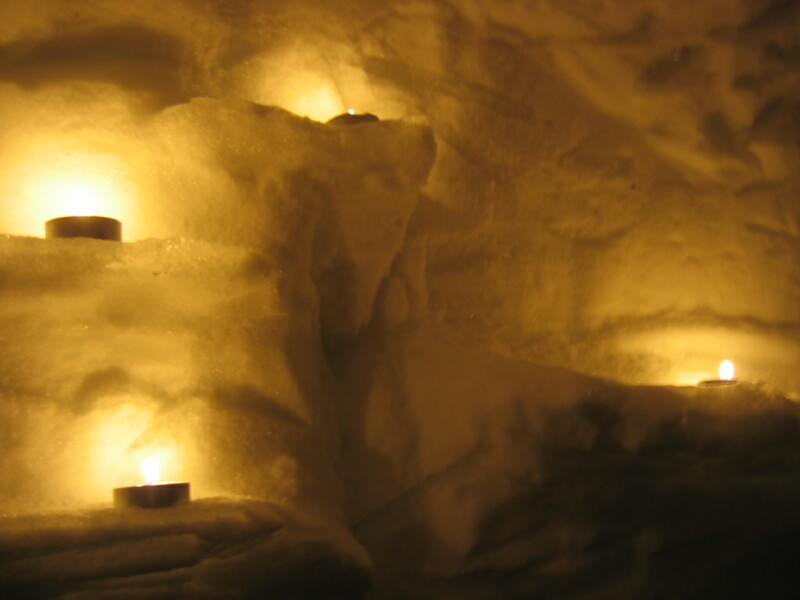 During all this, get as much snow out of the igloo as possible! 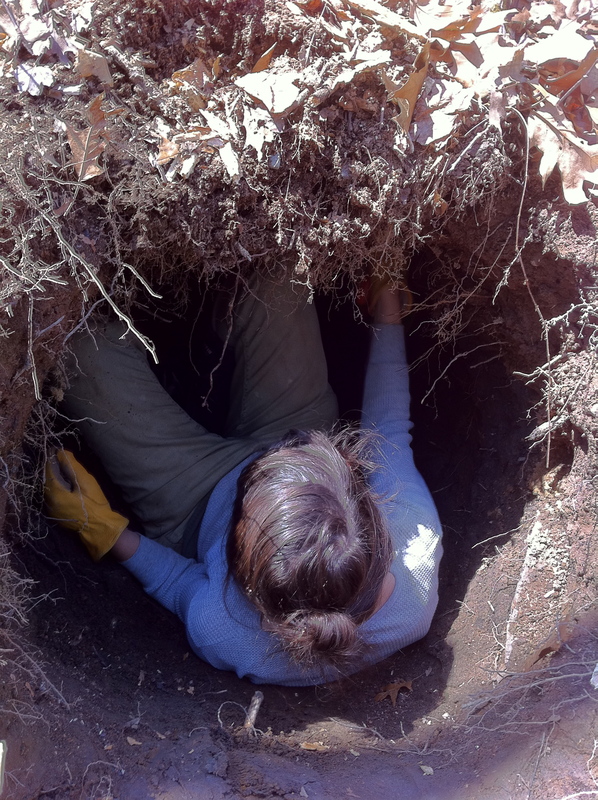 Once you close the top, excavation will get a lot harder! Also, a good technique for building any domed structure is to find the exact center on the floor and affix a string the same length as the ceiling height you want. As you build up the walls, pull the string taut to where you are working. Your wall should be built where the string ends. This will keep you on track for creating a dome. 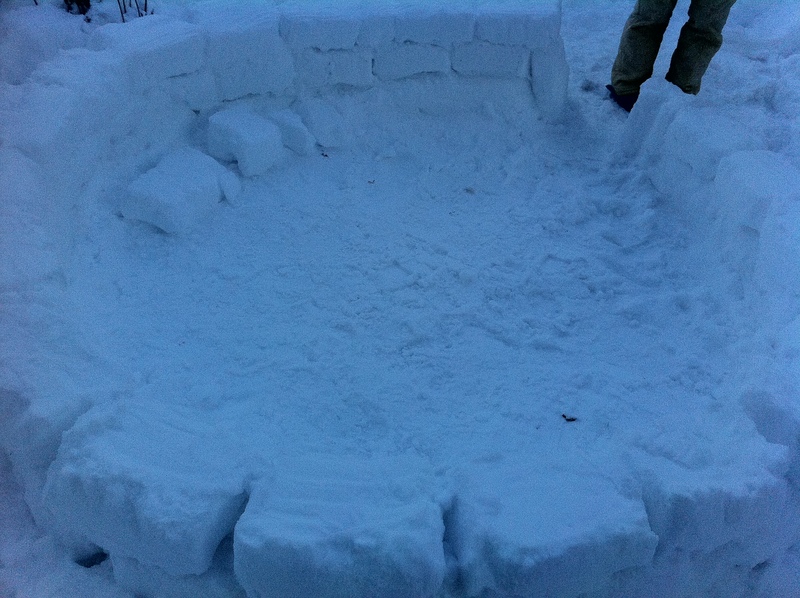 Make a pile of packed snow the size you want your igloo. 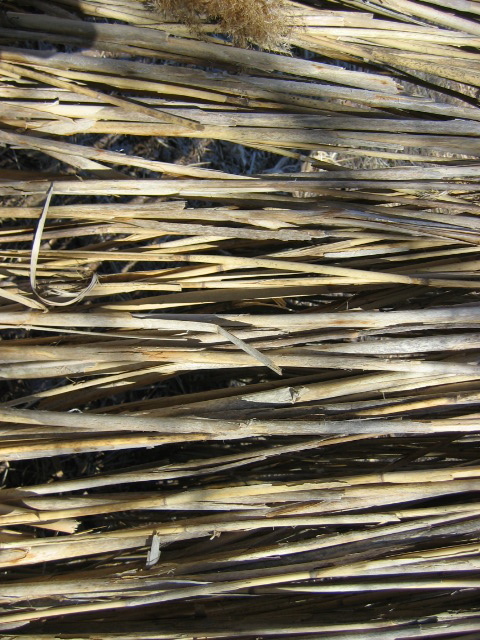 Collect a bunch of sticks, and mark on them the width you want your walls (say 1 foot). 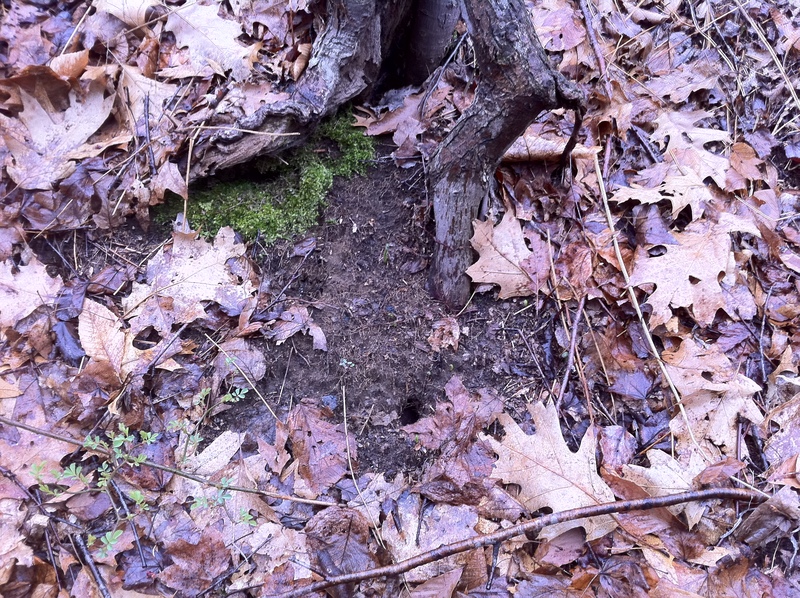 Stab the sticks into the pile, so that they each penetrate 1 foot in. 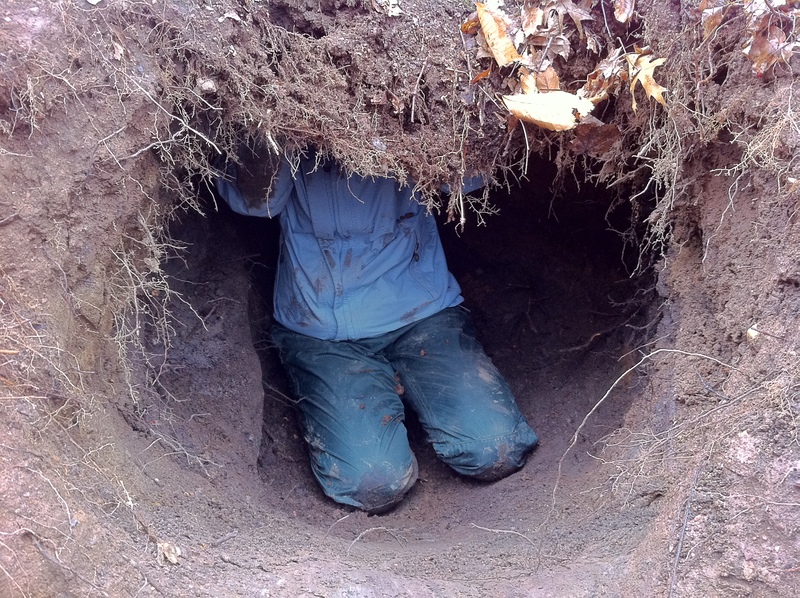 Cut a hole and start excavating! 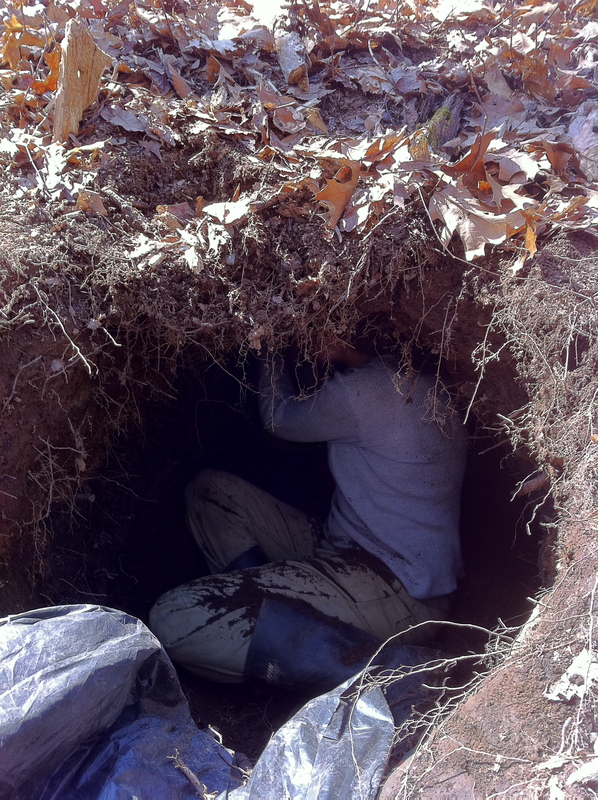 Dig dig dig until you can get inside, then hollow it out from the inside. Stop when you get to the sticks! Then you could build a door tunnel, add a chimney, et cetera. If you are traveling and need an igloo, take all your gear and pile it in a heap. (If you aren’t traveling and have no gear, I bet you could find some other object to replace it. Nothing too large! 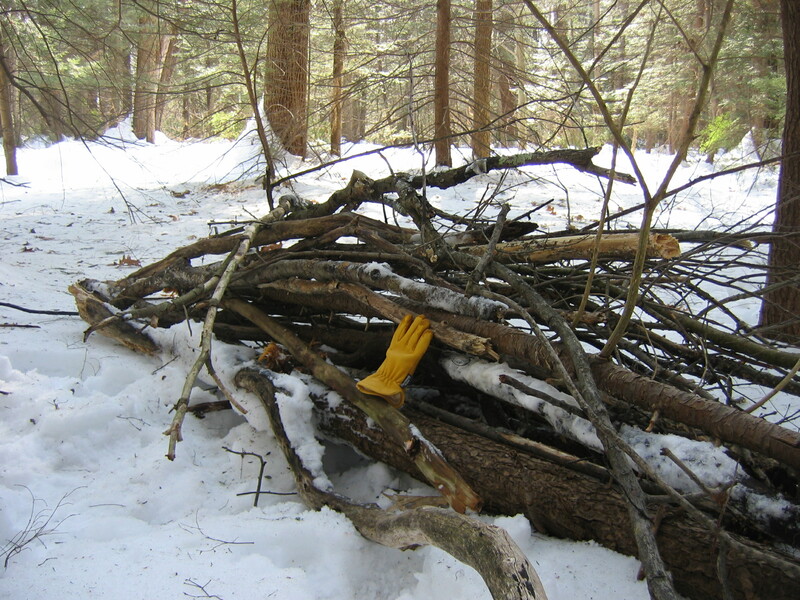 Pack a pile of snow over the pile of gear, at least as thick as you want your walls. Stab the sticks in, as above. 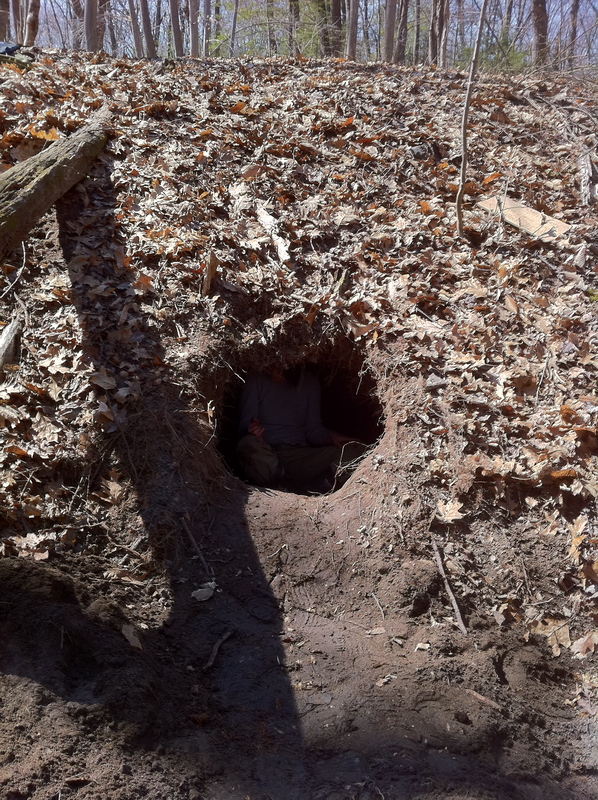 Make a hole for yourself and burrow until you reach your gear. Then remove it, piece by piece, through the hole. 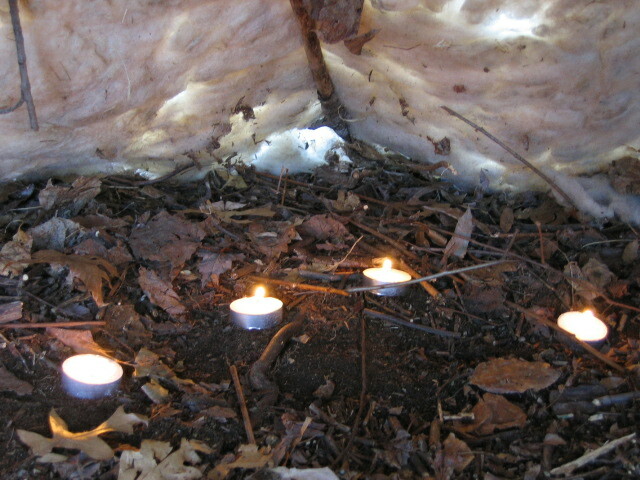 Add a chimney hole if desired, and the door tunnel mentioned above, which will create a heat sink in the igloo (wind can’t come in, heat will escape less easily). 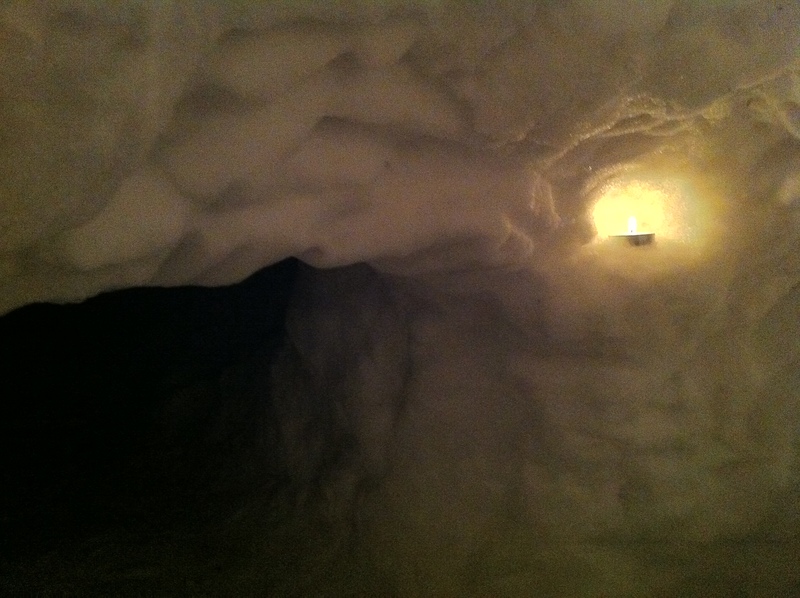 Today I finally got back to the igloo. 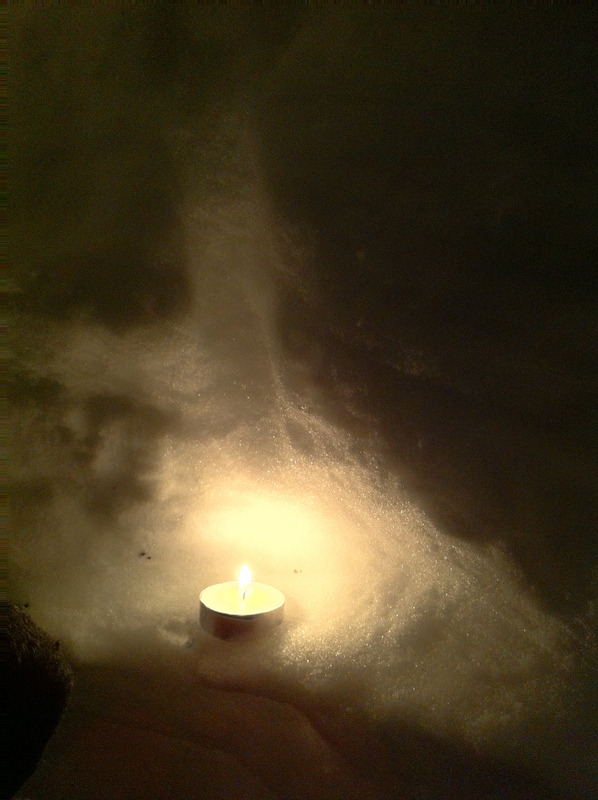 It has snowed quite a bit more since, so I had to brush a heap of snow off the walls. I felt a little like an archeologist, uncovering the distinct brick shapes. It has been bitter cold, and it quickly became apparent that this snow was even less suited for bricks than the previous snow was. After a few tries, I decided to build something with a material I did have- Ice! Because of our recent snow/ice/sleet/thawing/freezing pattern, several inches below the snow there was a sheet of ice about an inch thick. 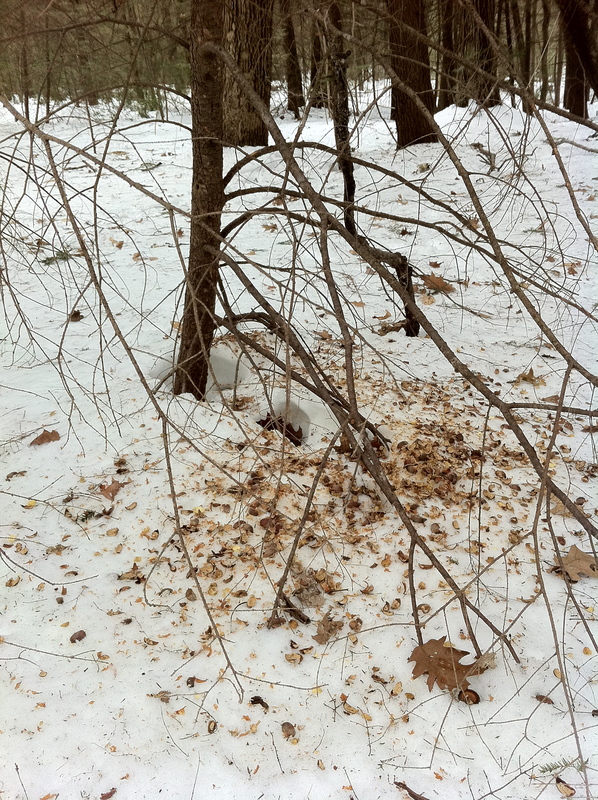 I discovered that with strategic shovel chopping I could harvest pieces of this ice. I couldn’t help but feel very New England-y, since ice harvesting used to be a major occupation in this region back in the day. 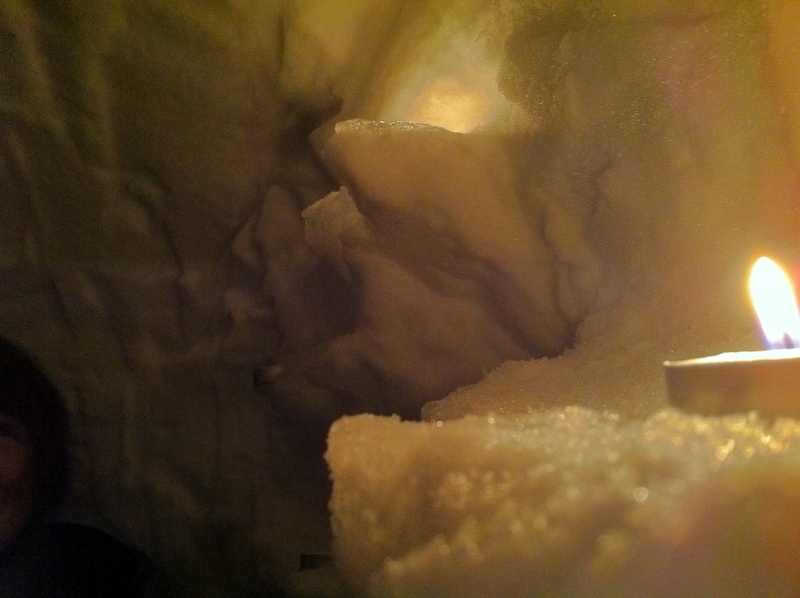 I built a tiny enclosure with packed snow walls dug into the surrounding snow, and then harvested a couple of large pieces of ice to use as the roof. 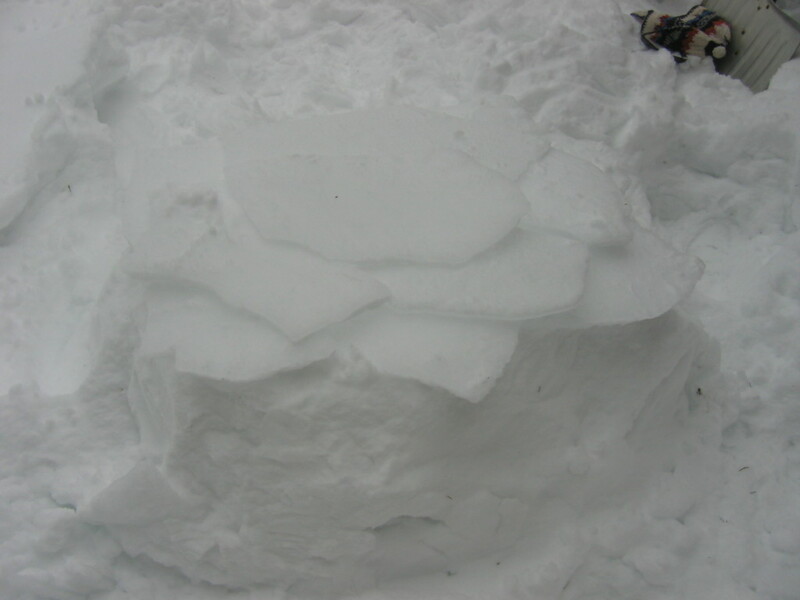 I also placed smaller sheets of ice on top of the snow wall, layering them before the two big pieces went on top. I felt a little like Andy Goldsworthy making one of those giant stone pinecones. It is my hope that these smaller pieces will act as counterweights, more widely distributing the weight of the two larger pieces. We’ll see how that goes. I tried to take pictures, but the sun was so bright on all the snow I couldn’t really see the camera screen, so results may be mixed. 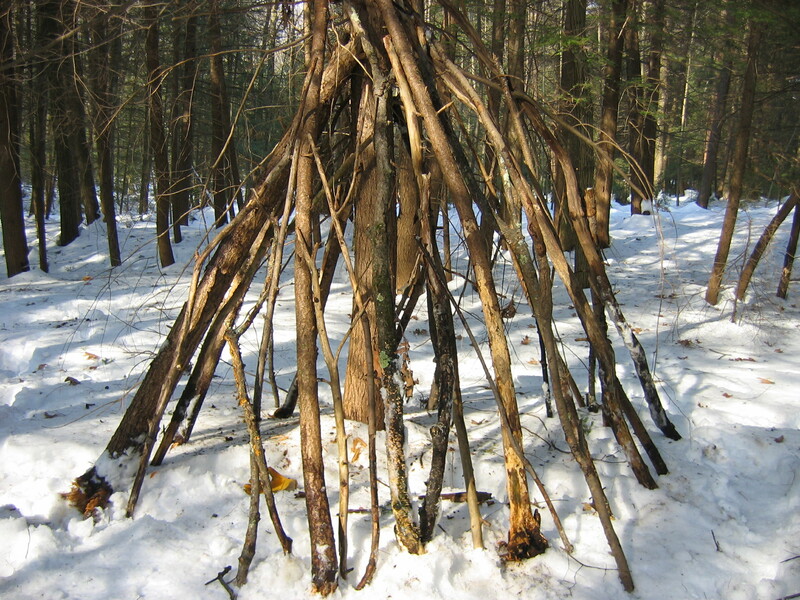 Snow structure building has always been fun (as most of us who grew up in snowy climates know) and snow structures can also be very cozy. 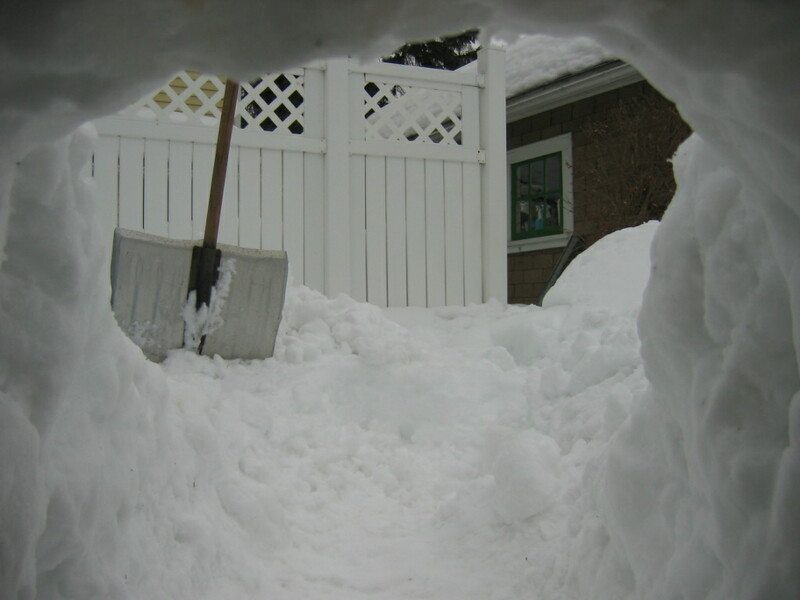 Depending on the amount and quality of snow I have to work with, I plan to finish the brick igloo, and perhaps try another igloo, of the brick-less, gear-heaping, stabbed-with-sticks variety. An ironic side note: I am claustrophobic, and would probably not enjoy spending extended periods of time in an igloo, or hollowing one out from the inside. 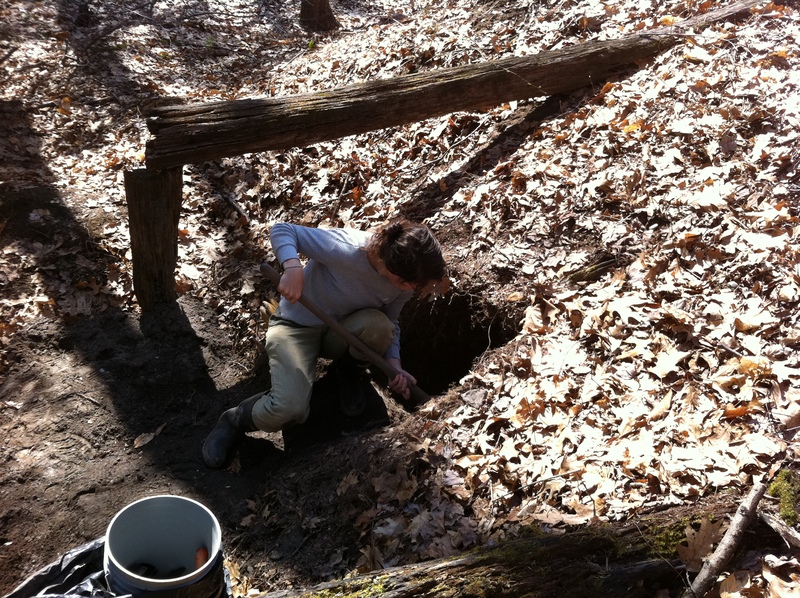 department of post-collapse studies · what to do next.